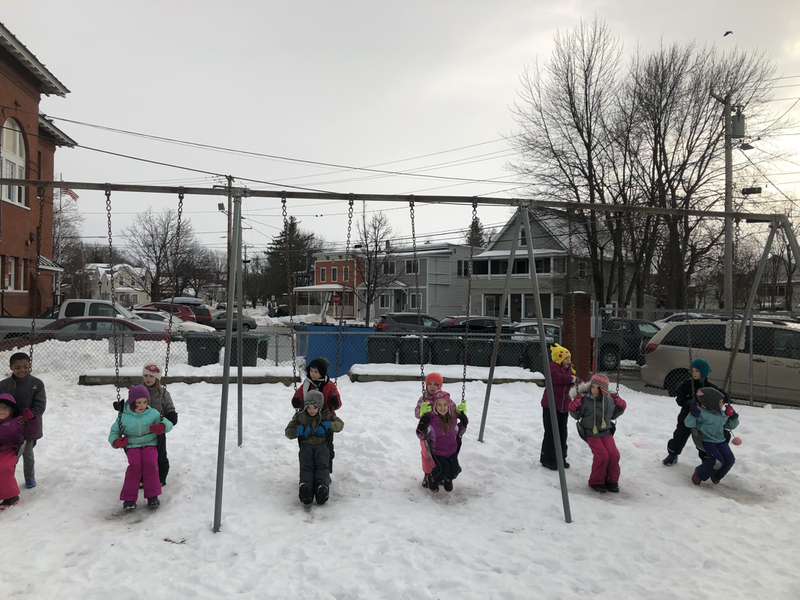 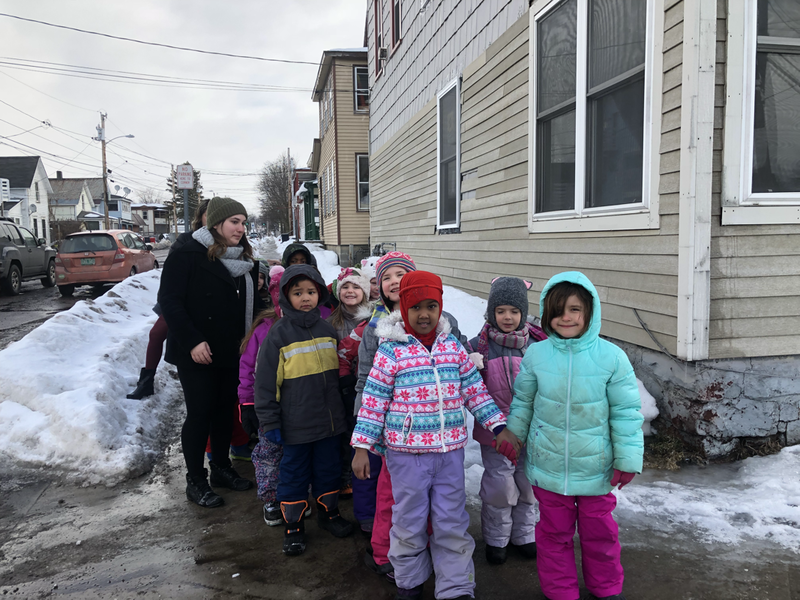 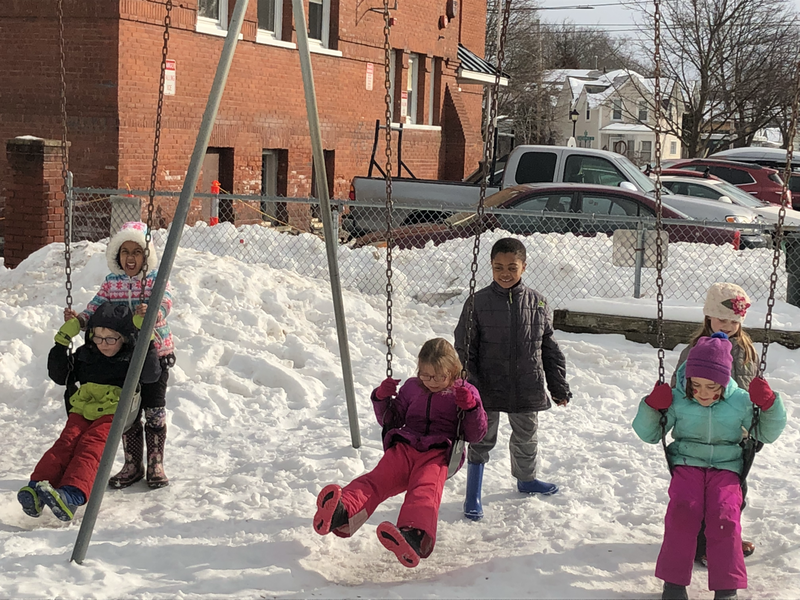 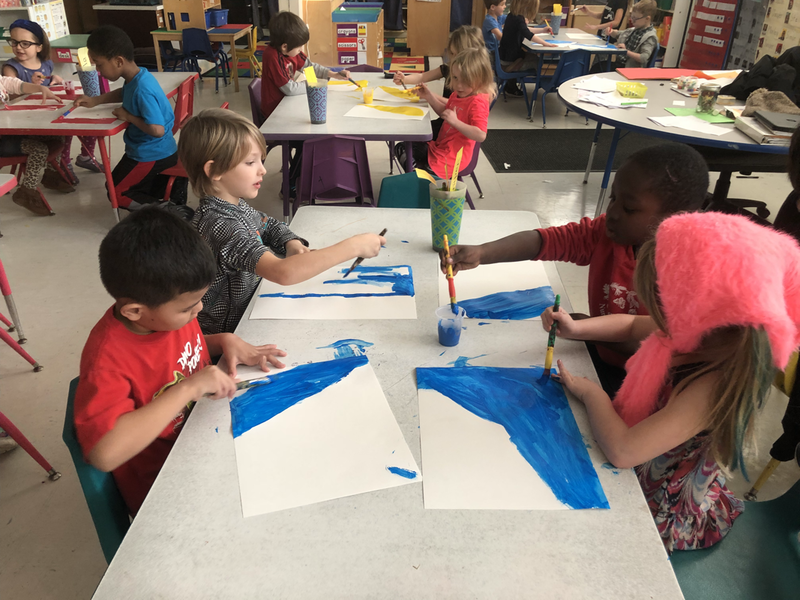 The kindergarten students have been learning all about weather. 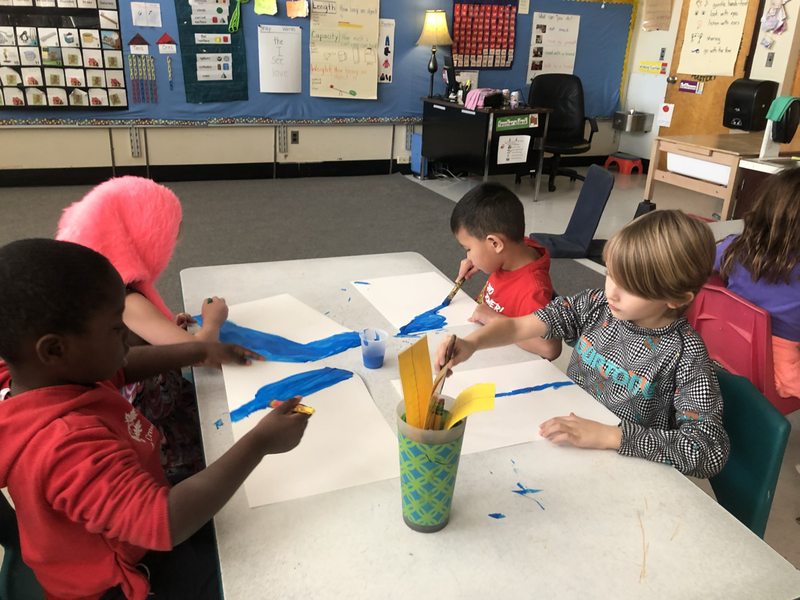 We have learned the process of the water cycle and are exploring concepts of evaporation, condensation and precipitation. 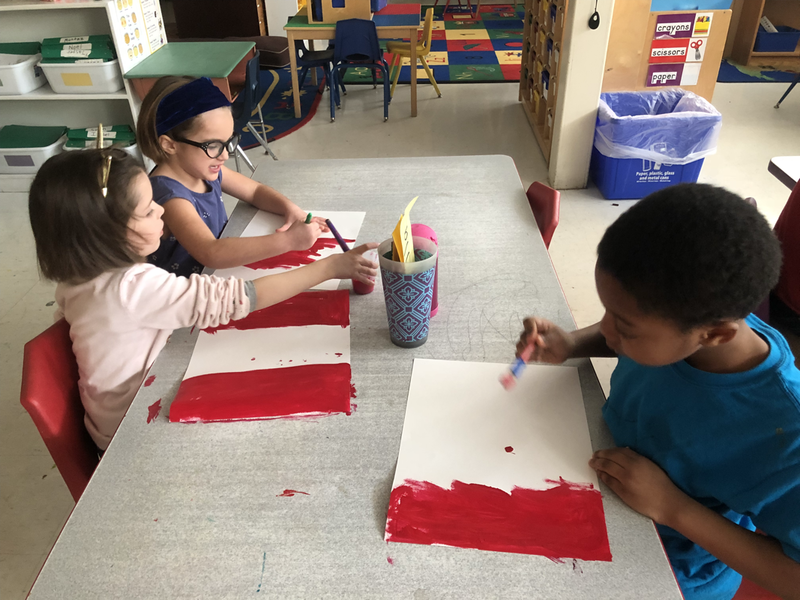 We have learned about the 3 major types of clouds - cirrus, stratus and my favorite cumulus. 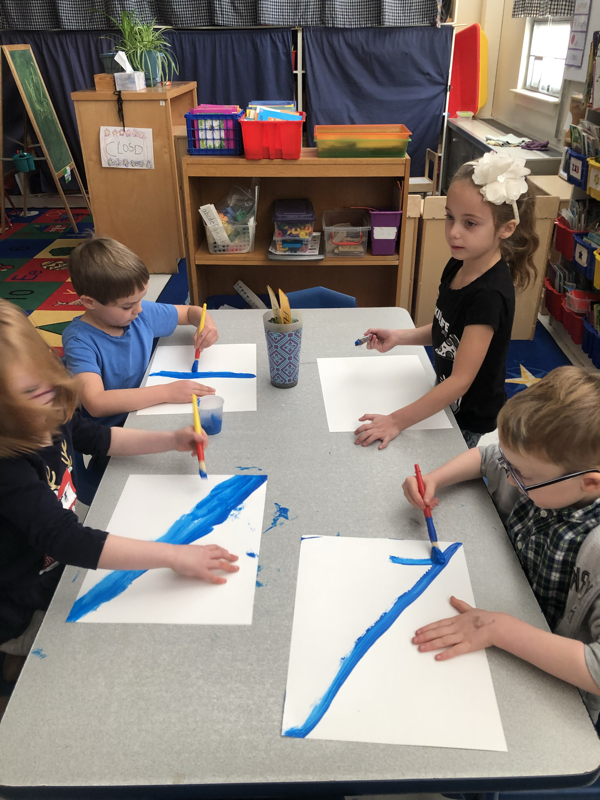 The students picked one cloud type to make a cut out. 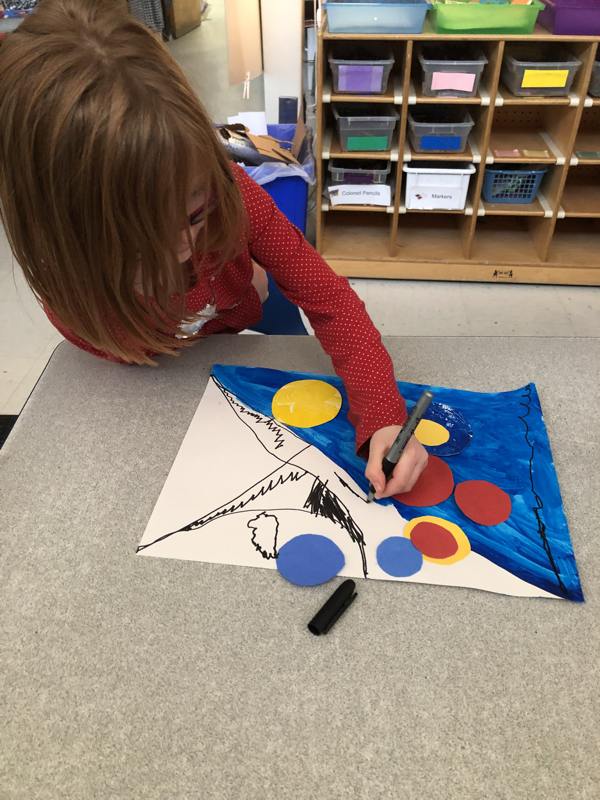 After tracing these onto cardboard we learned about tints and created some beautiful colors on our clouds. 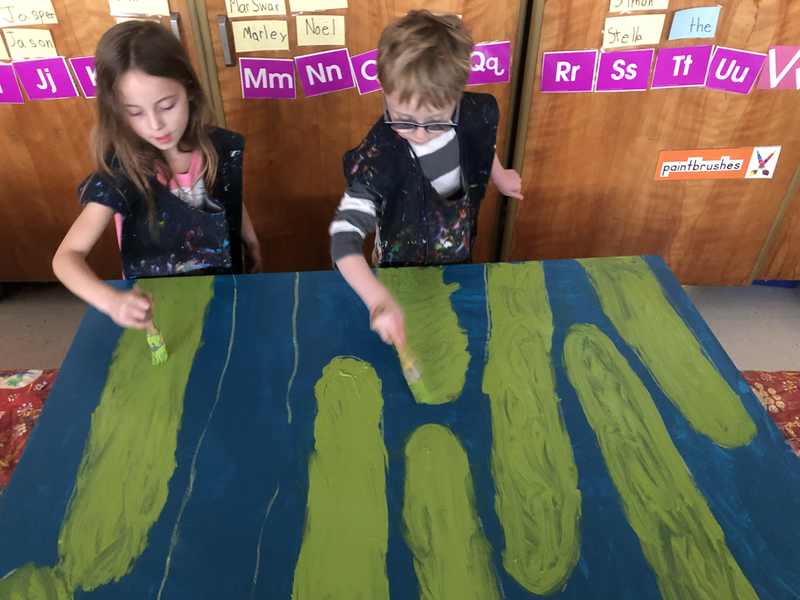 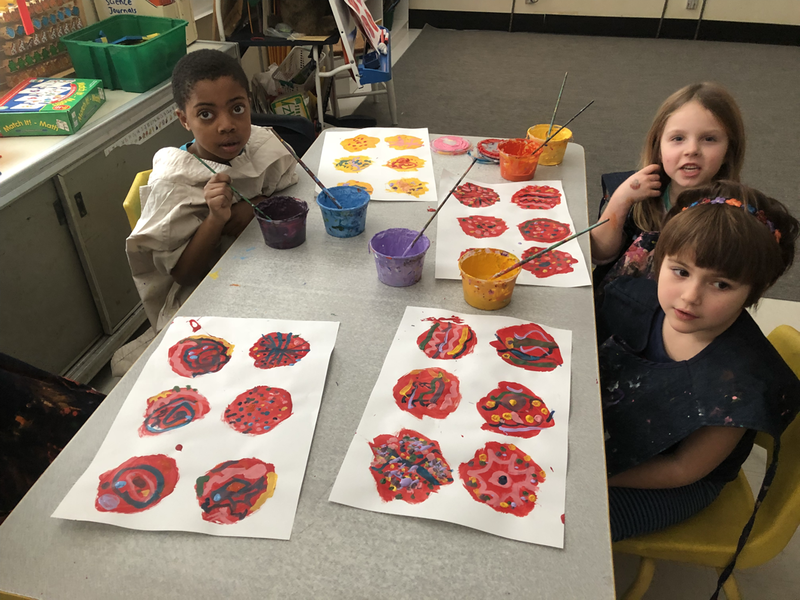 We are also working on our precipitation batiks! 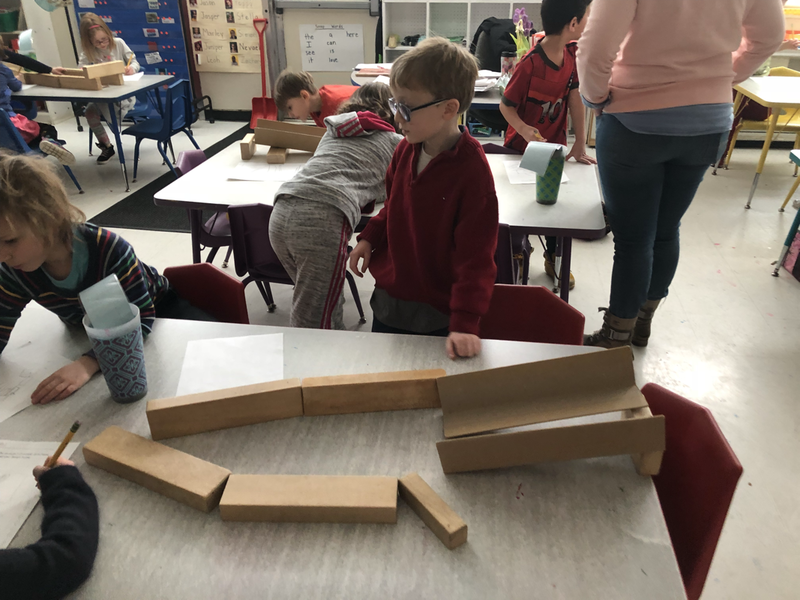 Next week, we will assemble all the pieces together and complete this fun project. 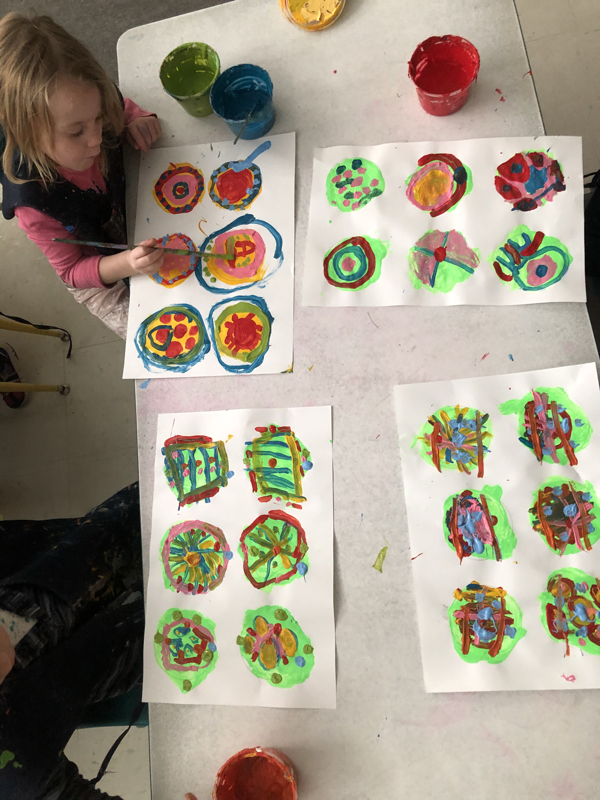 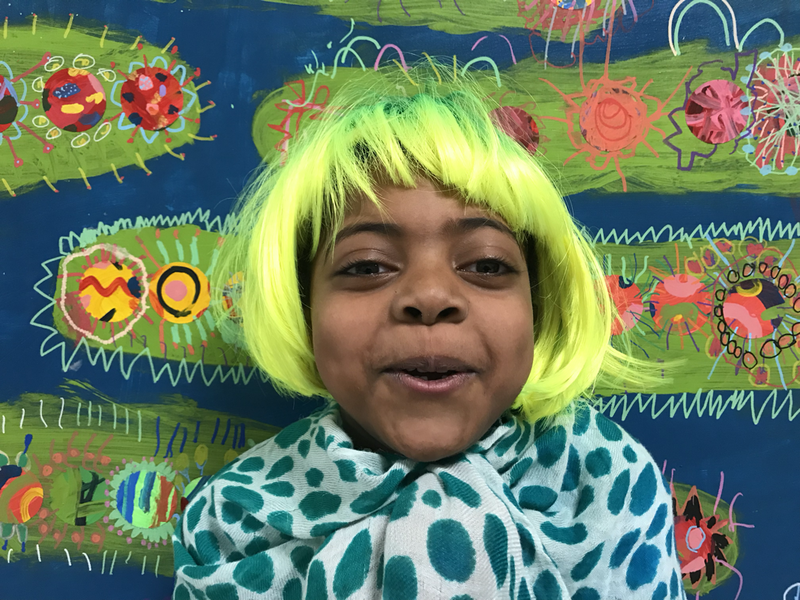 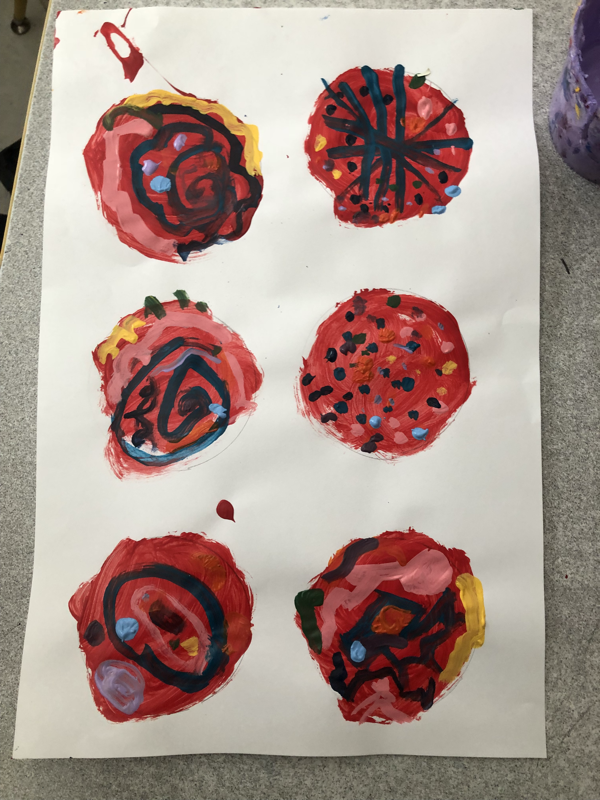 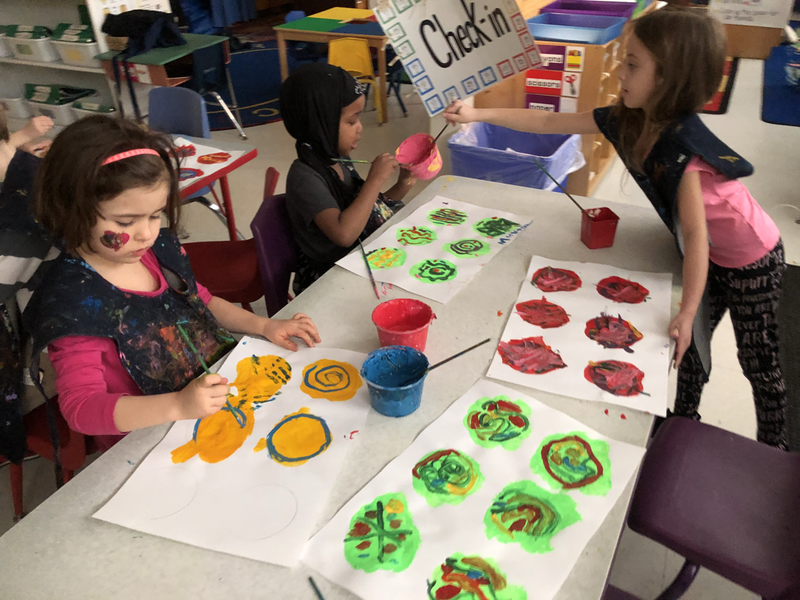 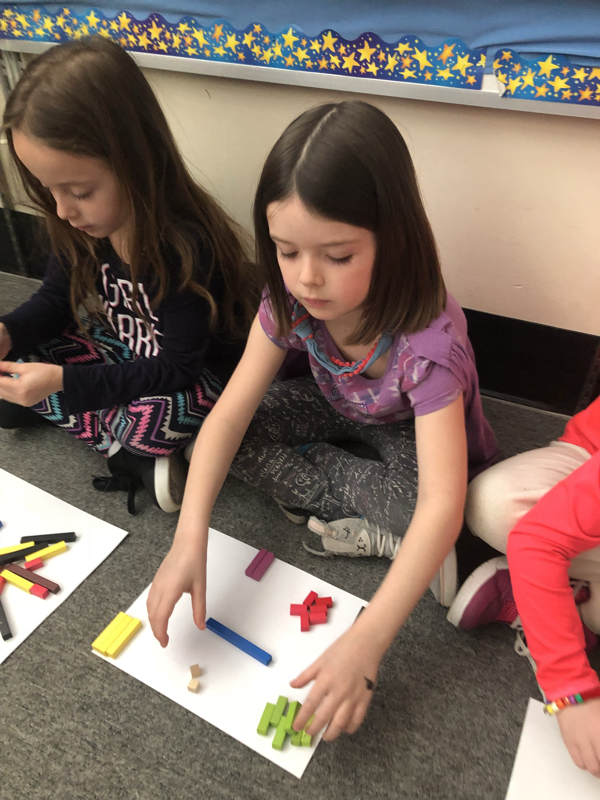 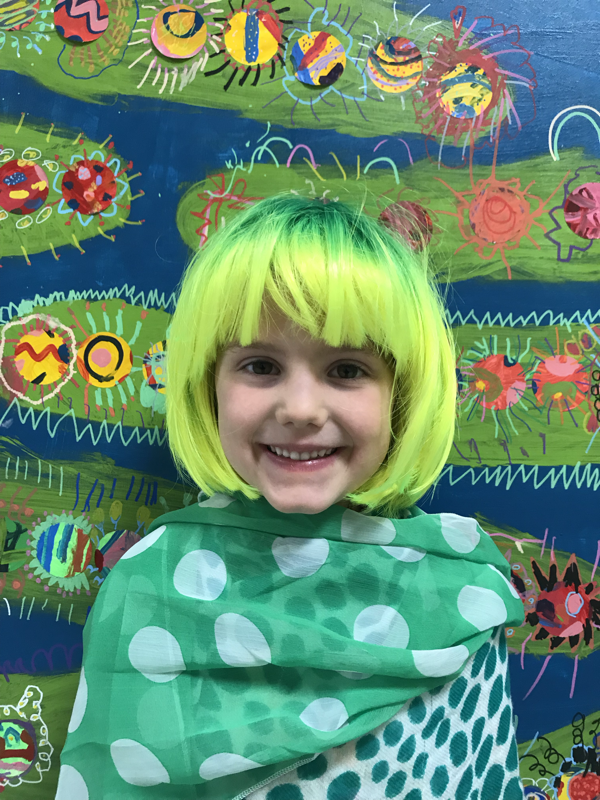 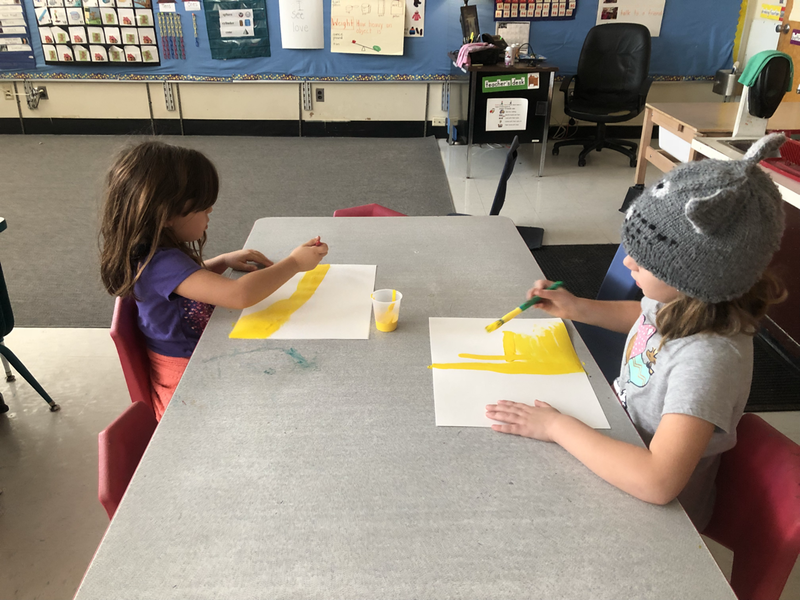 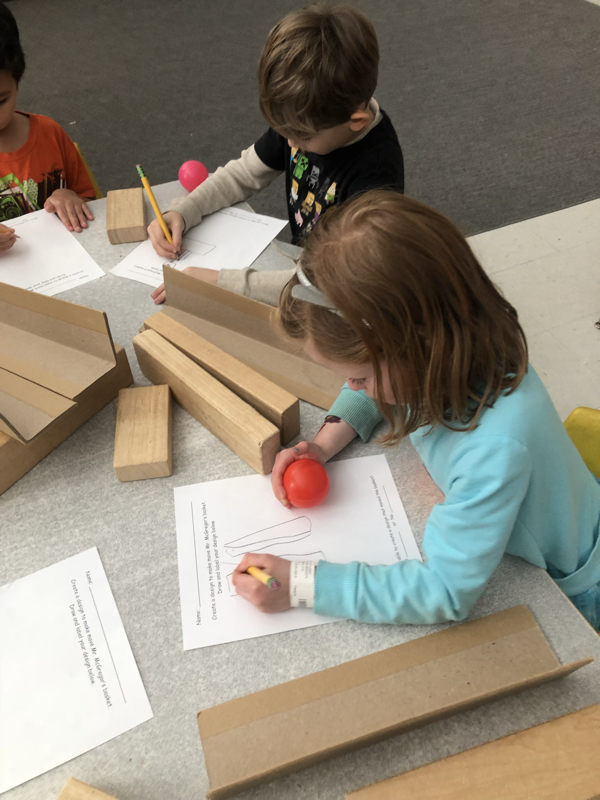 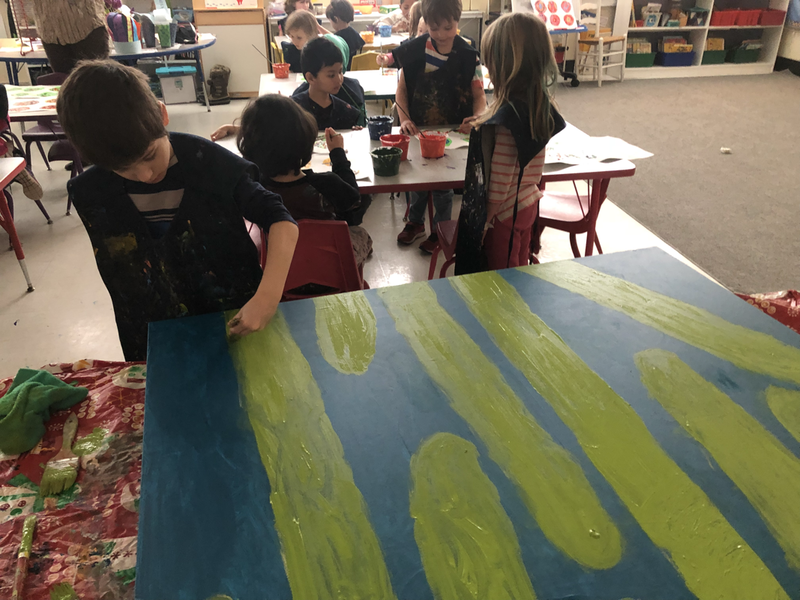 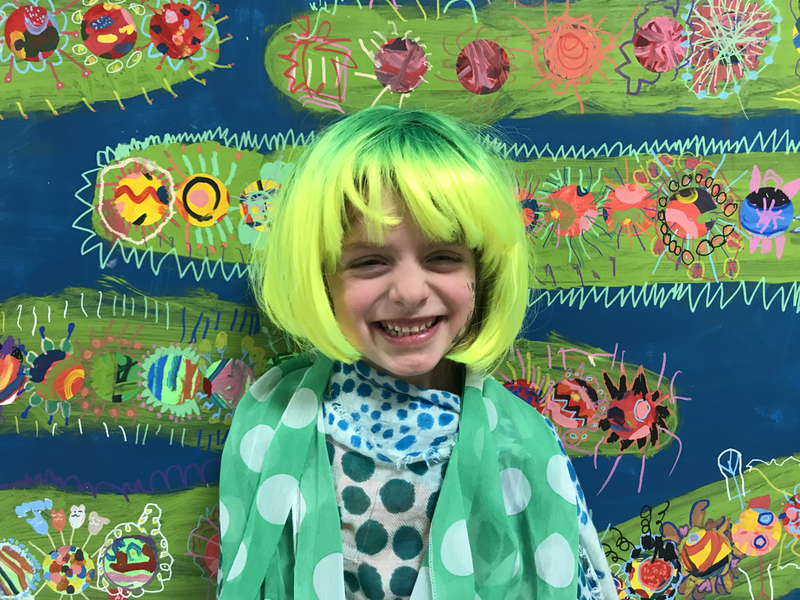 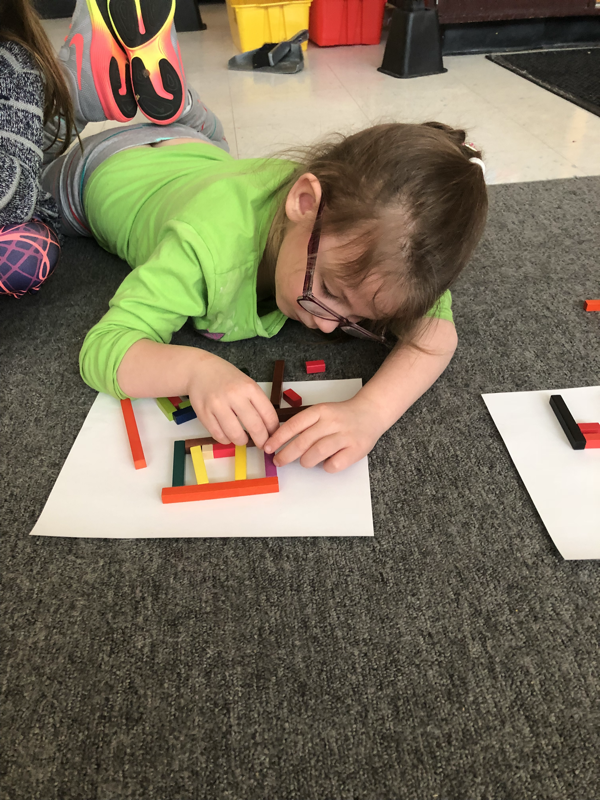 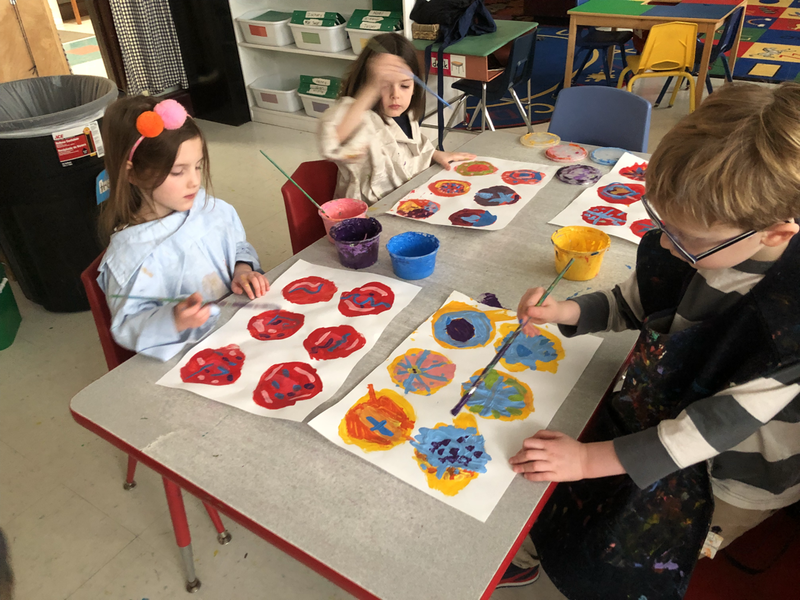 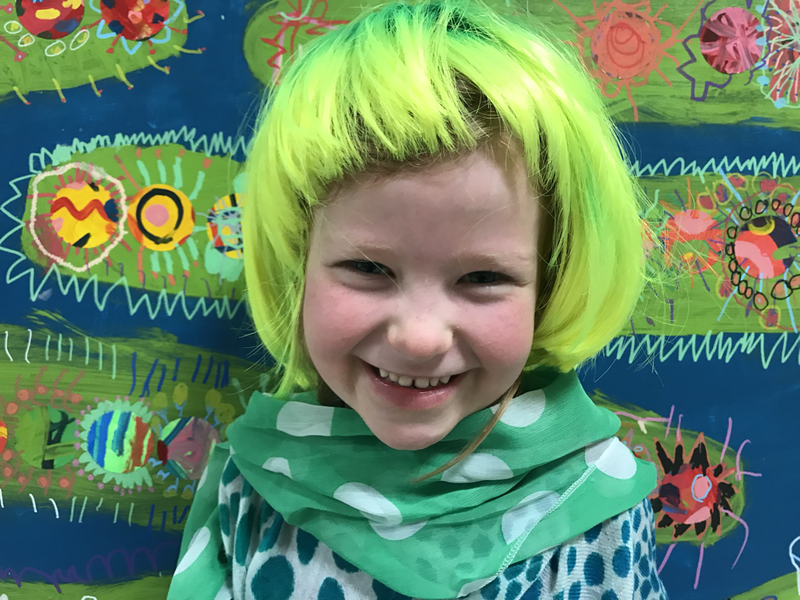 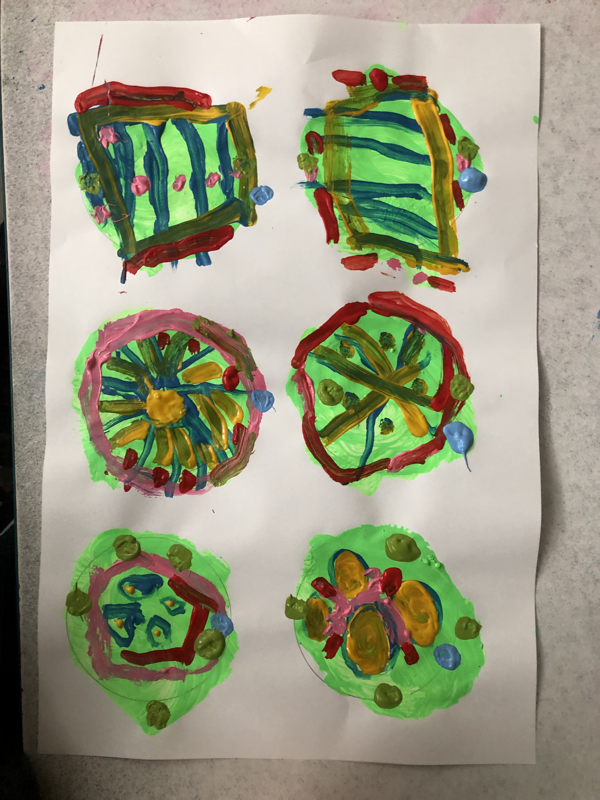 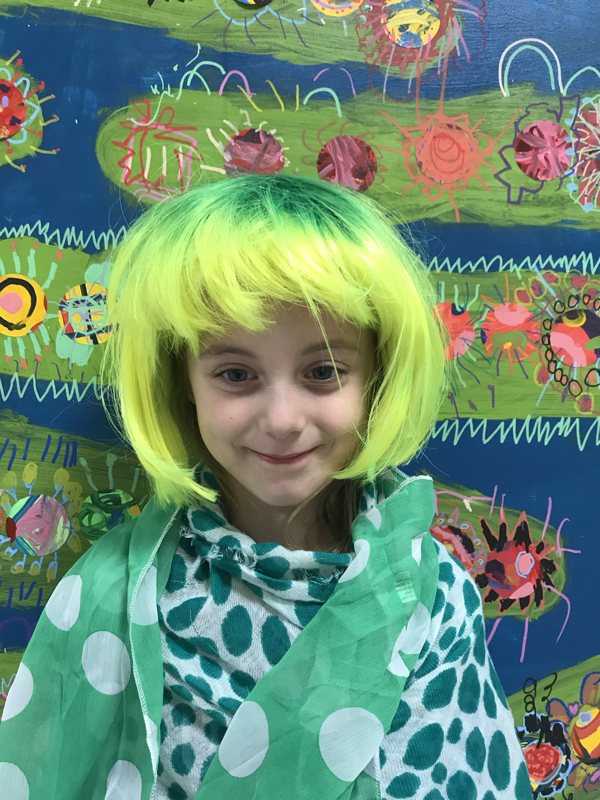 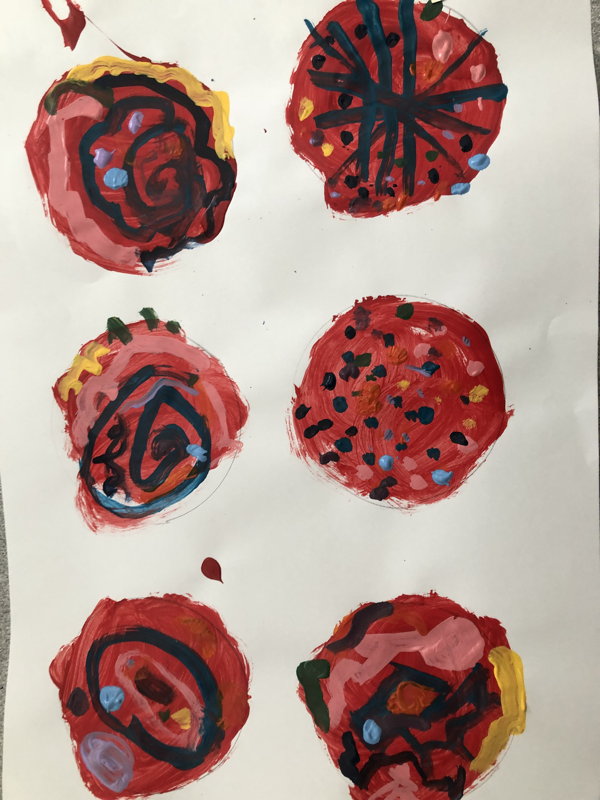 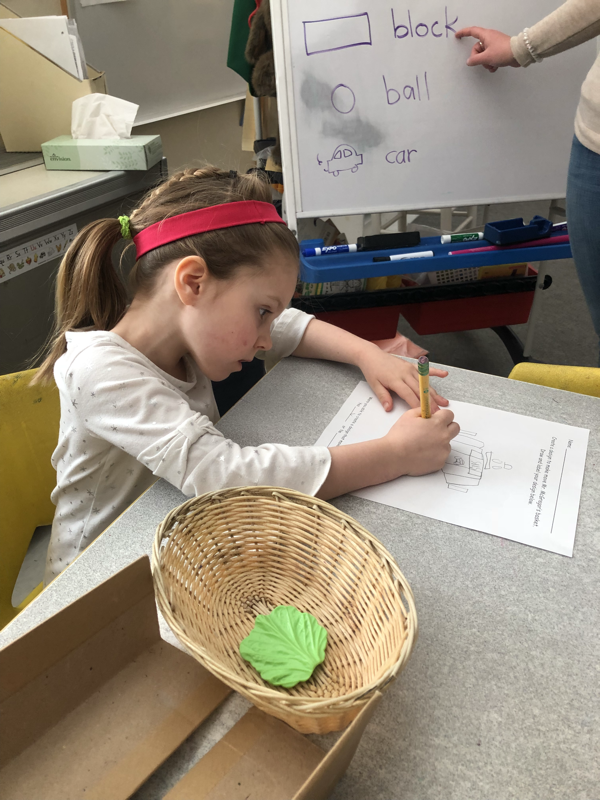 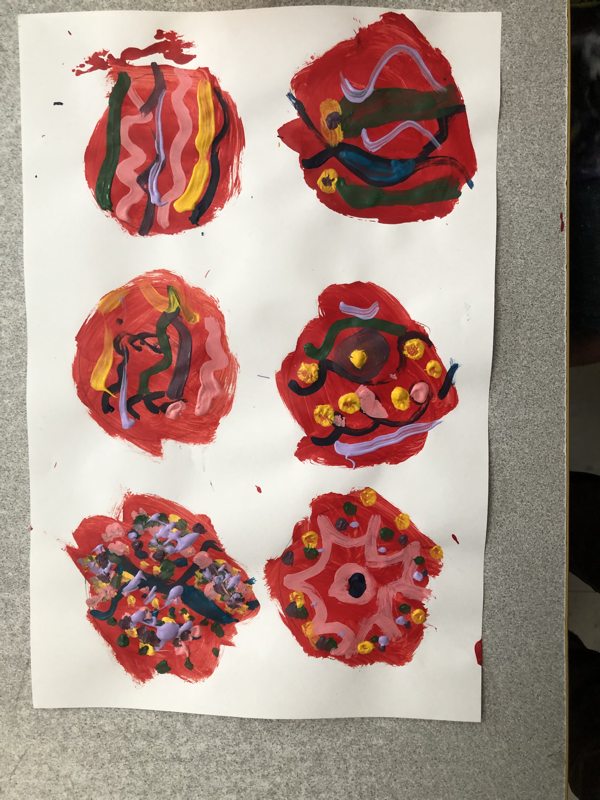 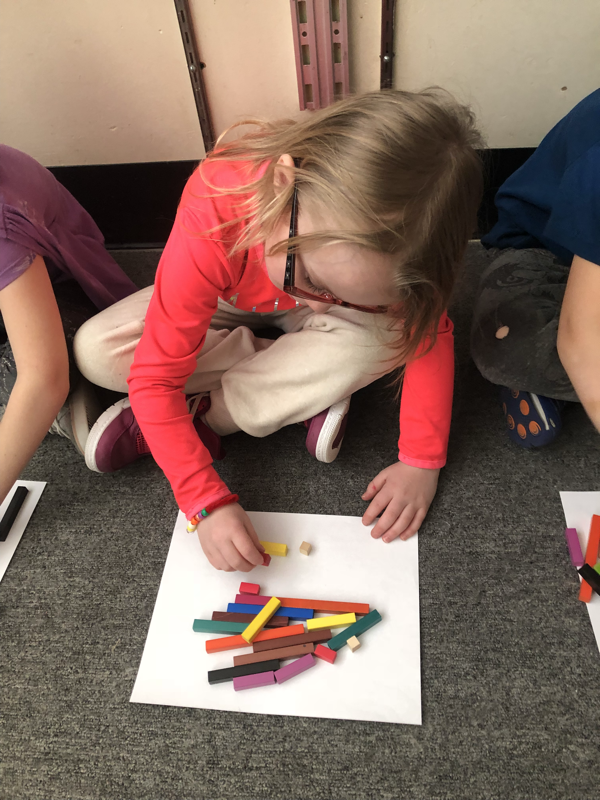 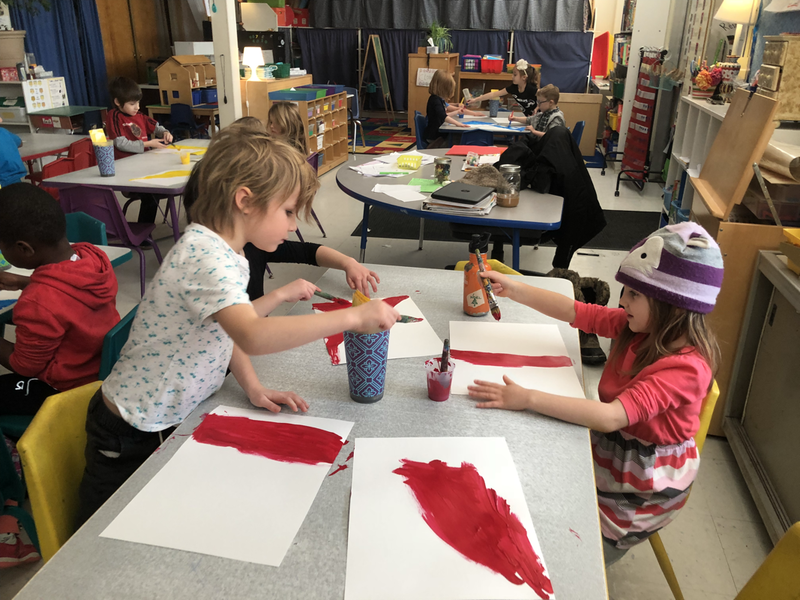 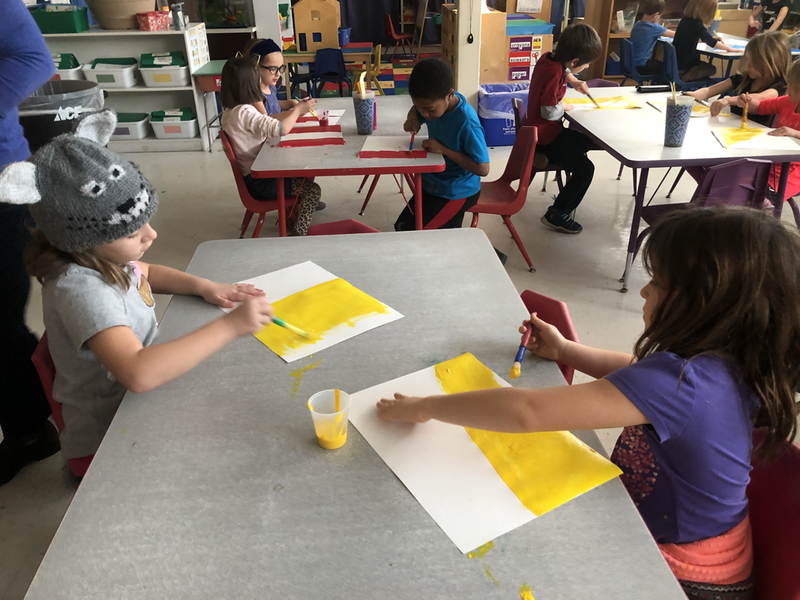 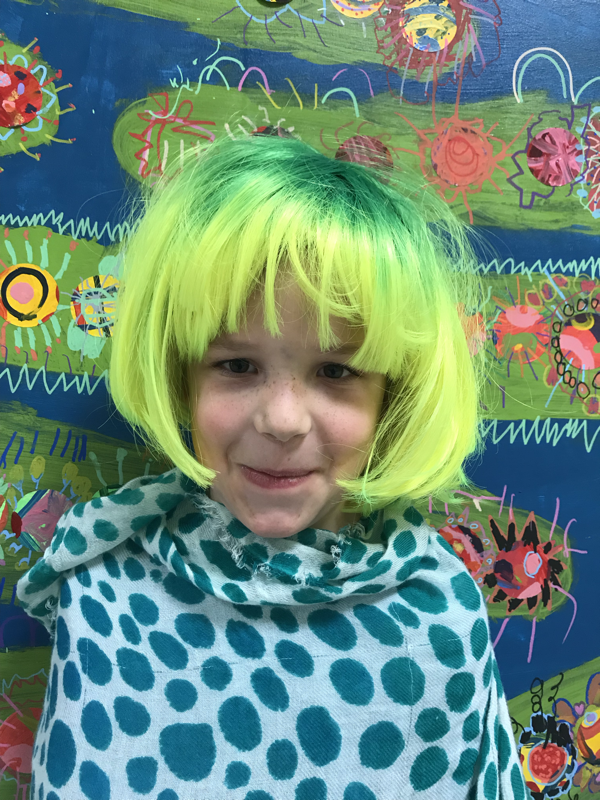 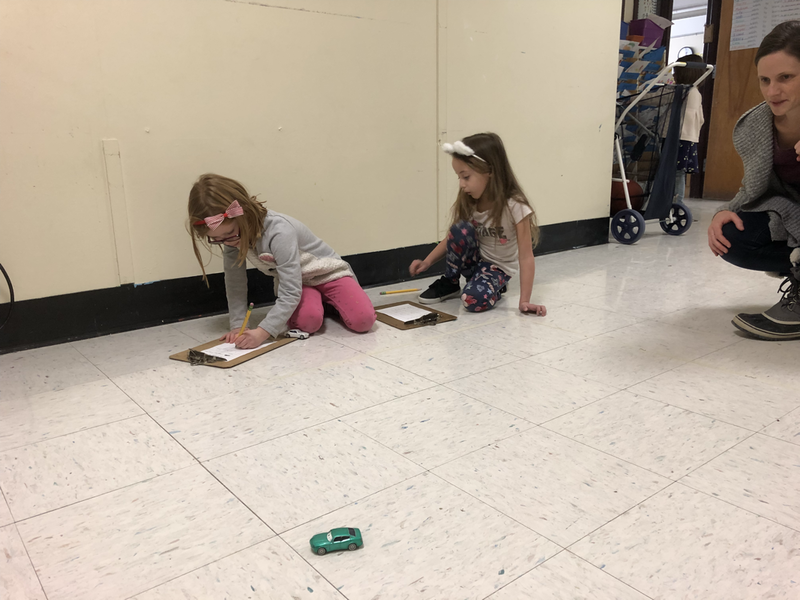 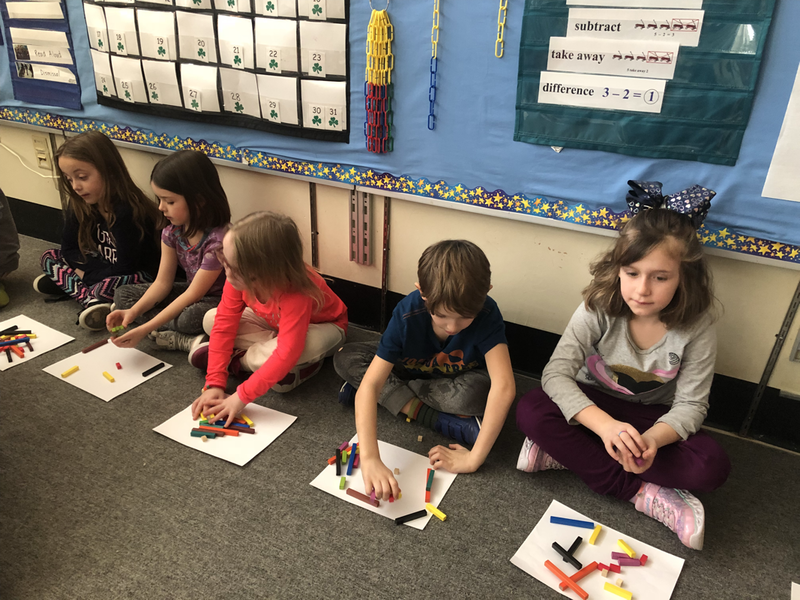 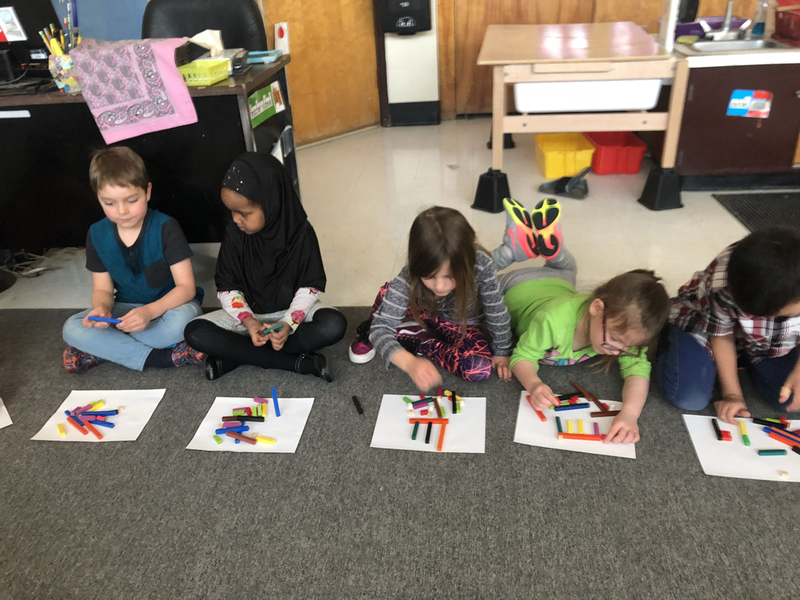 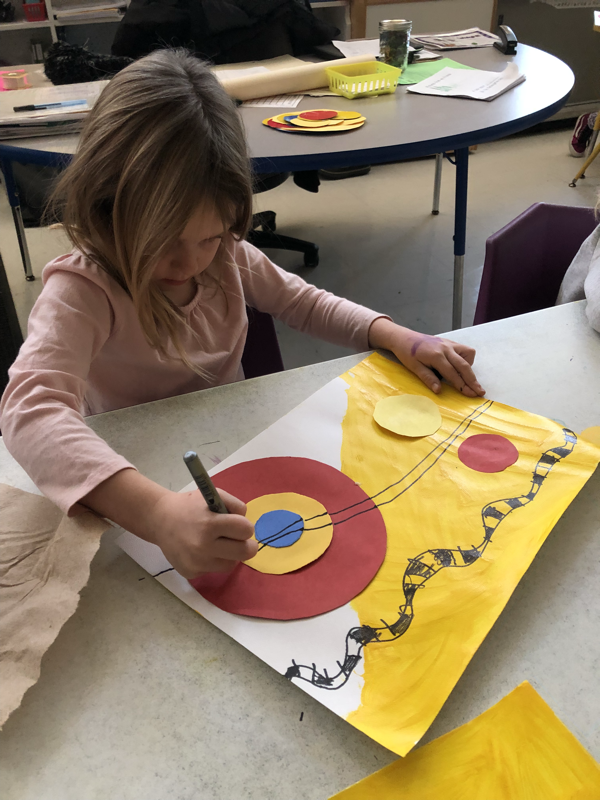 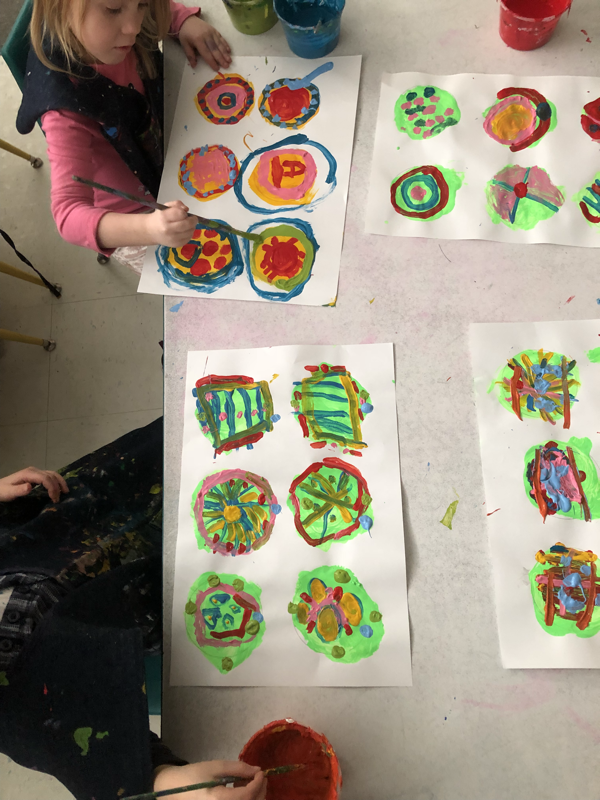 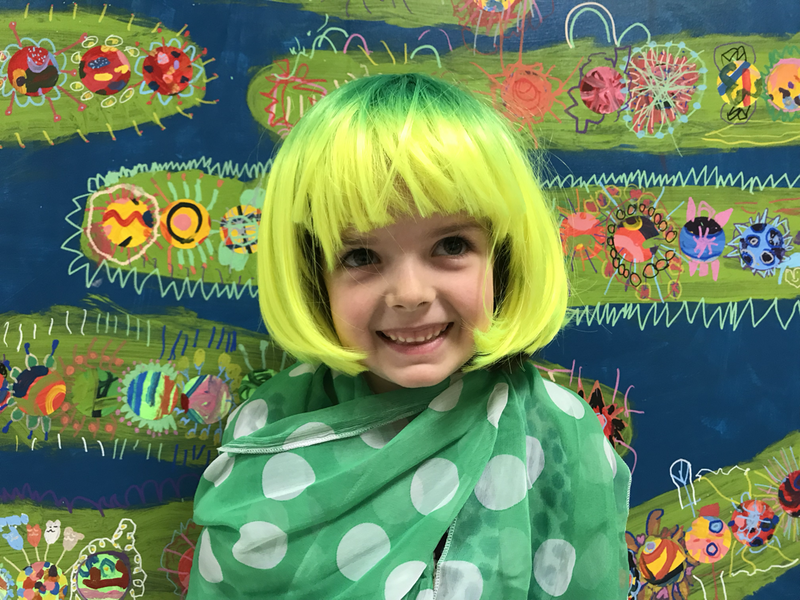 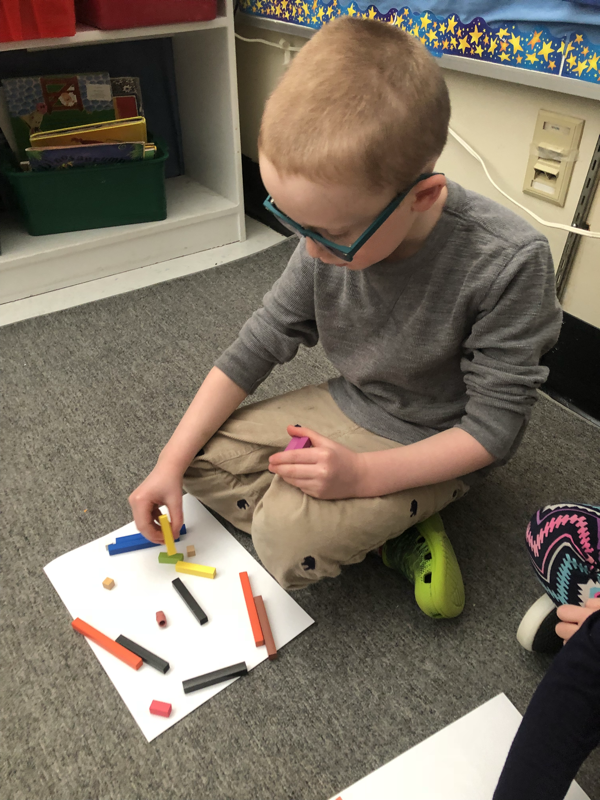 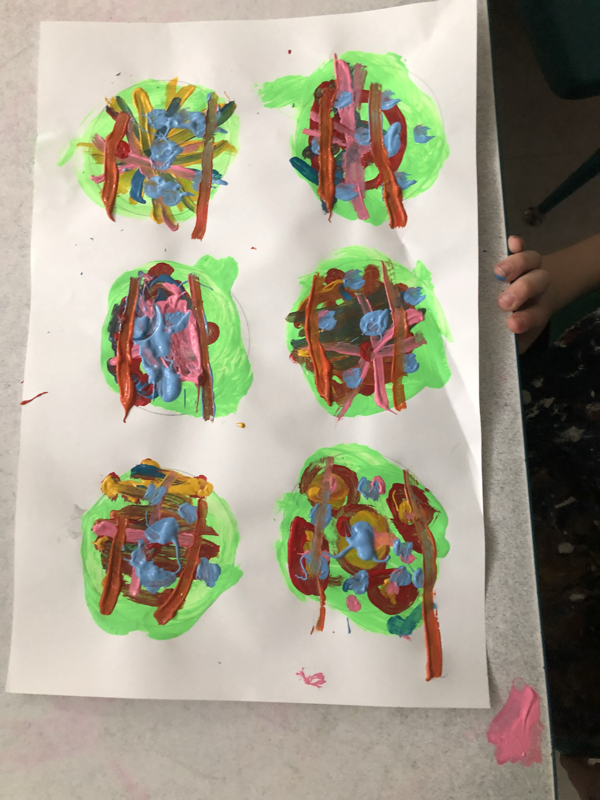 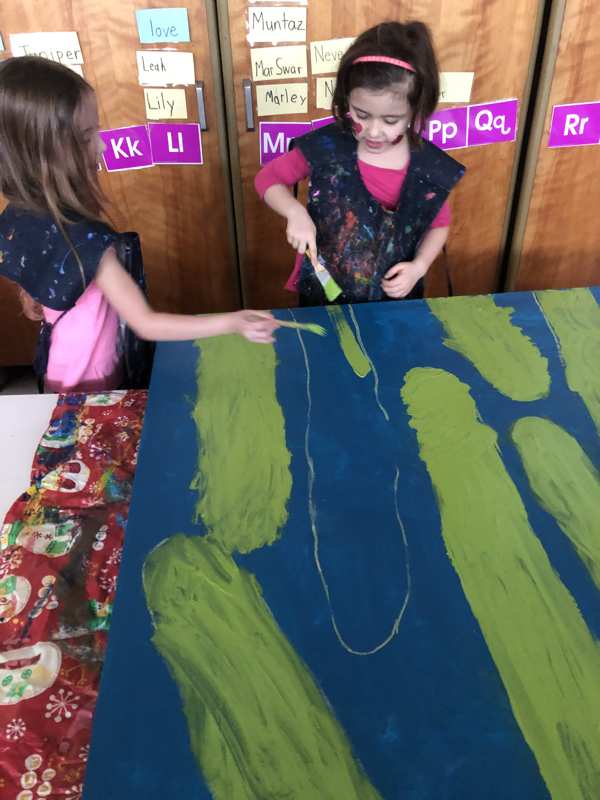 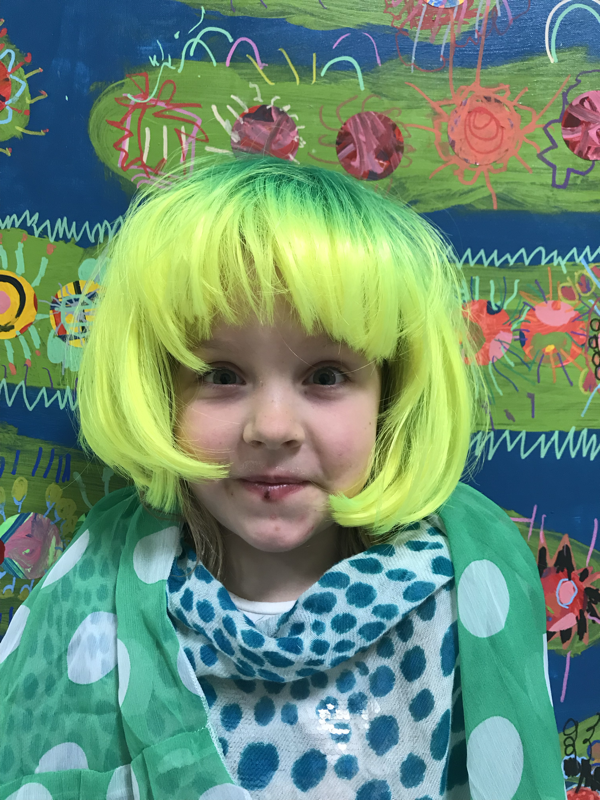 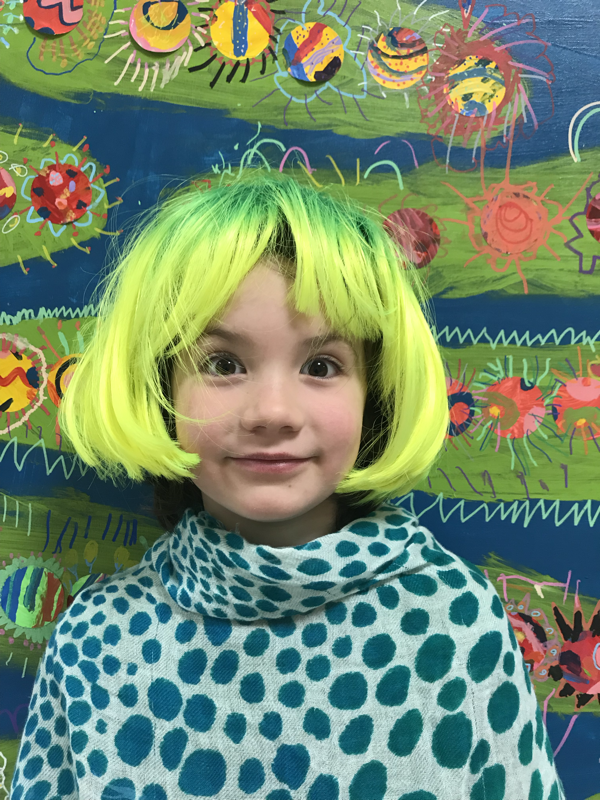 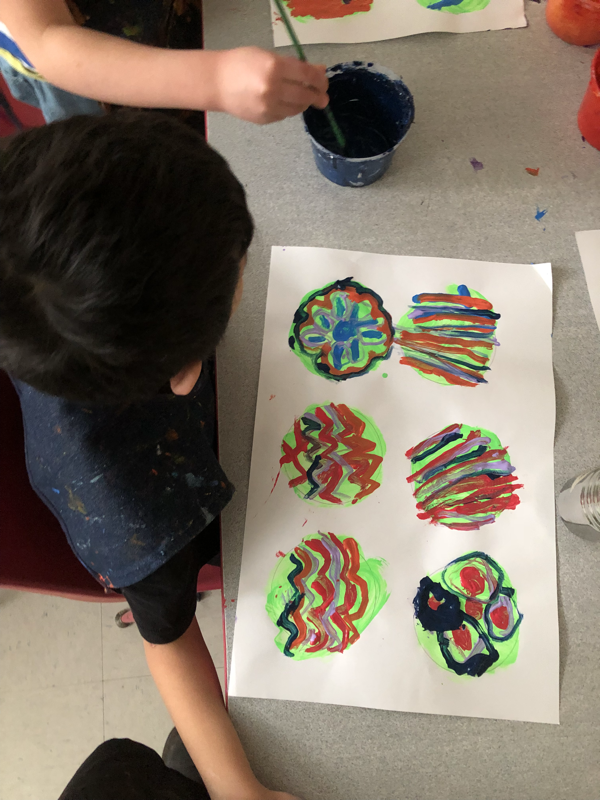 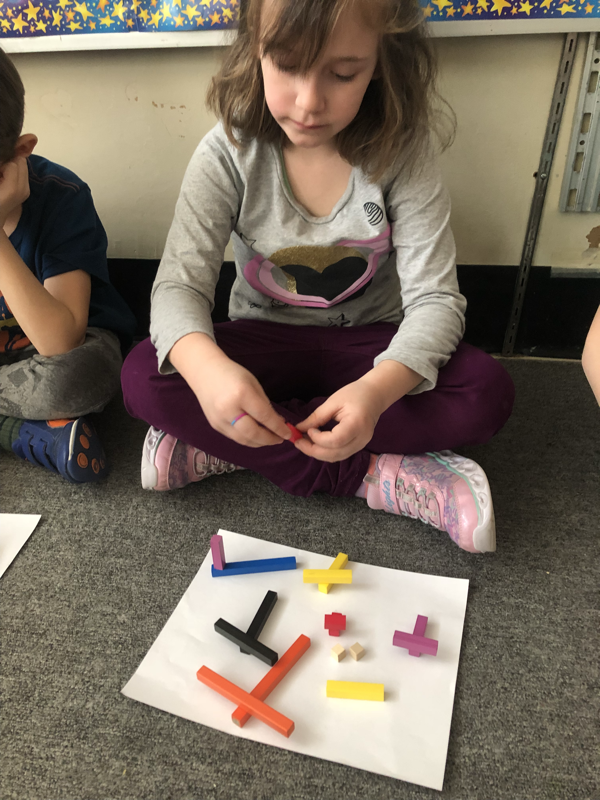 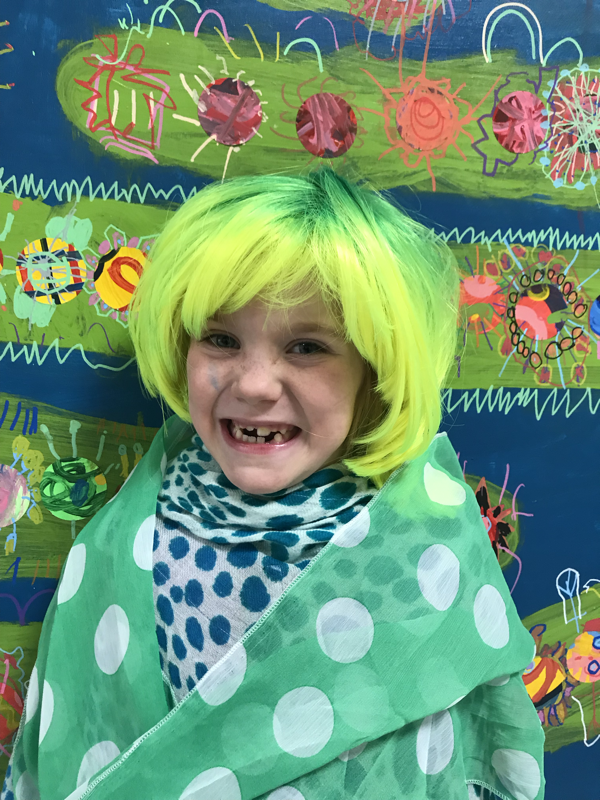 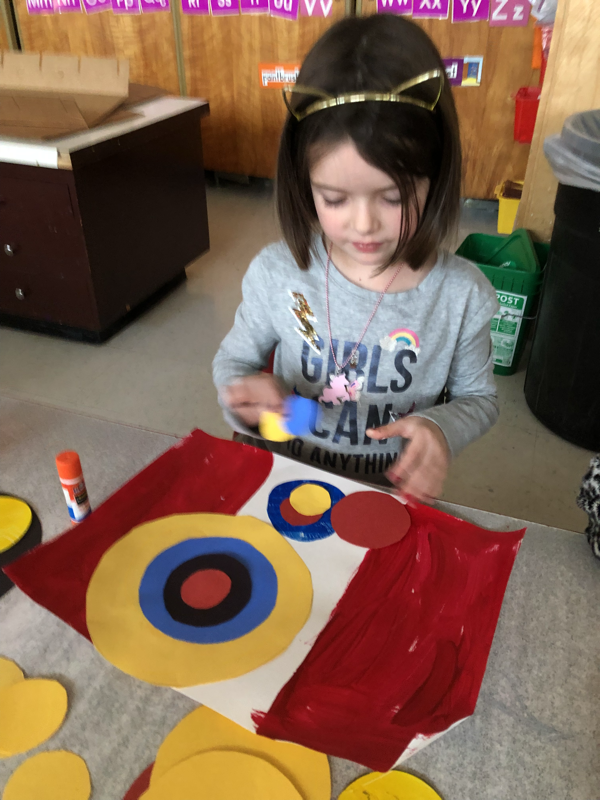 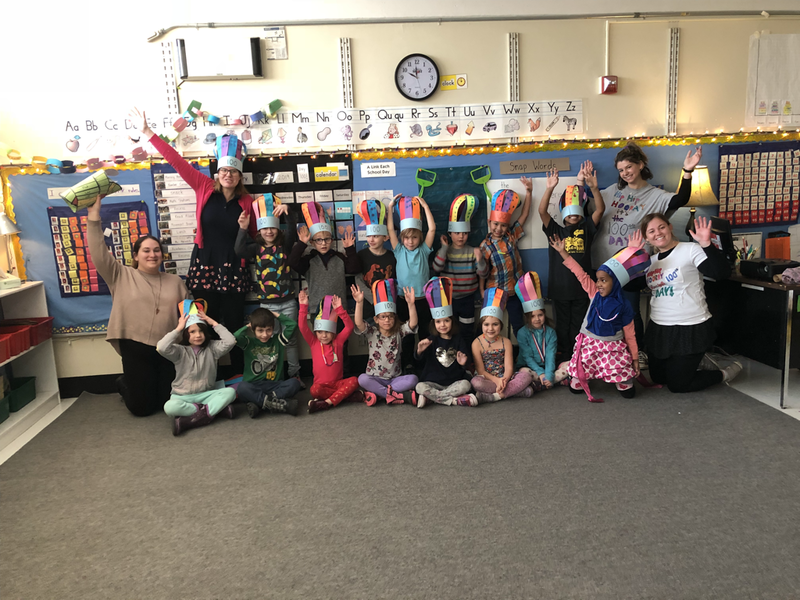 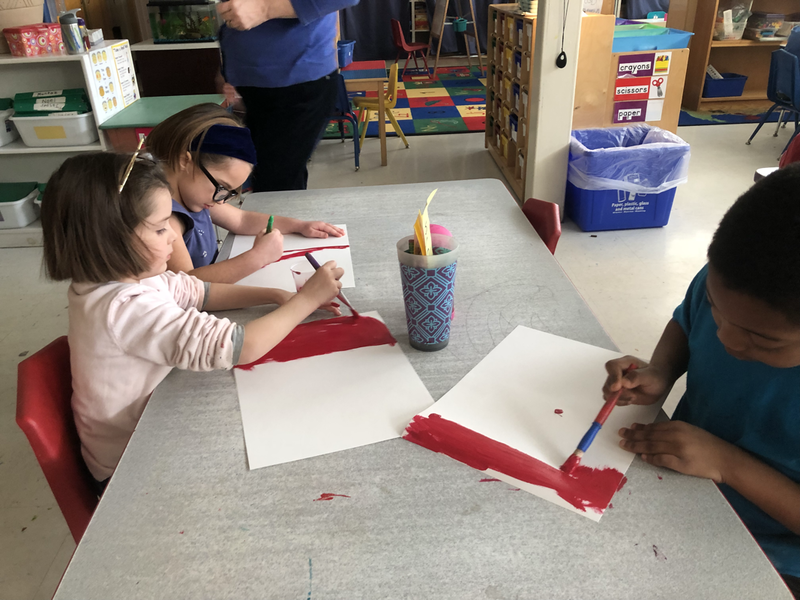 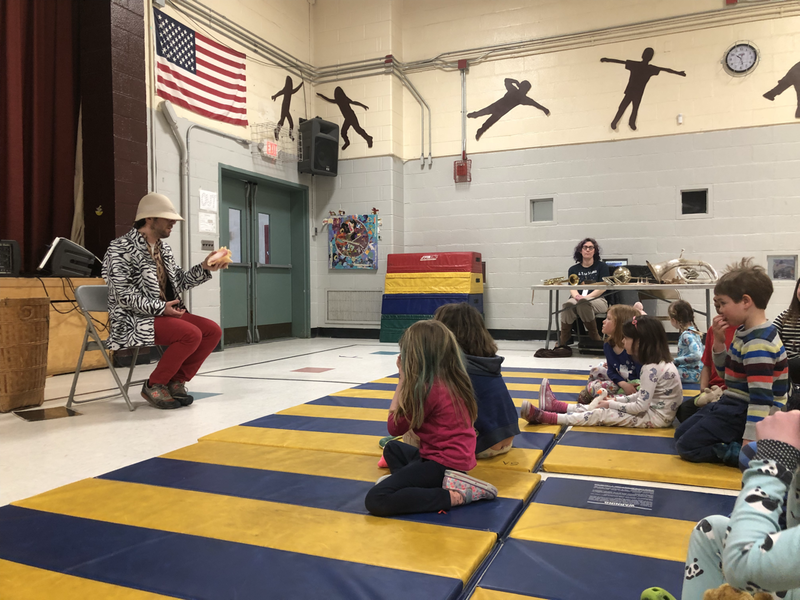 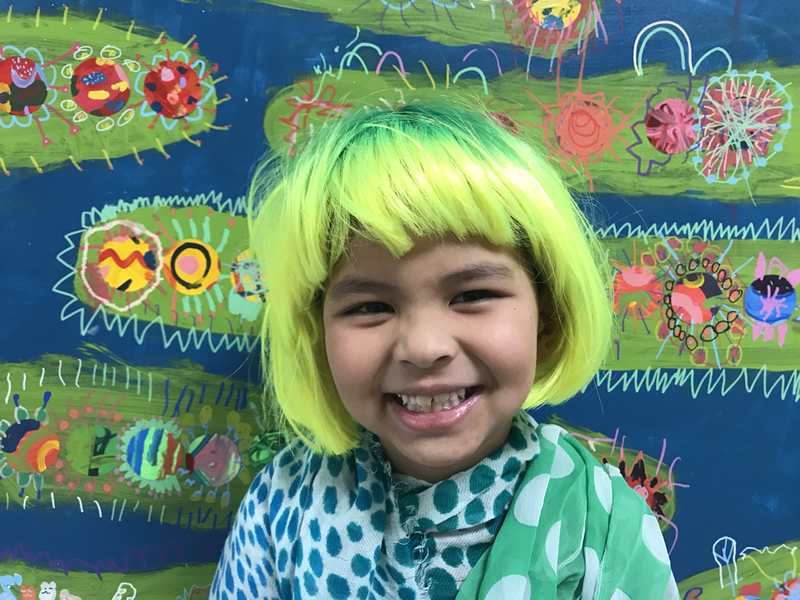 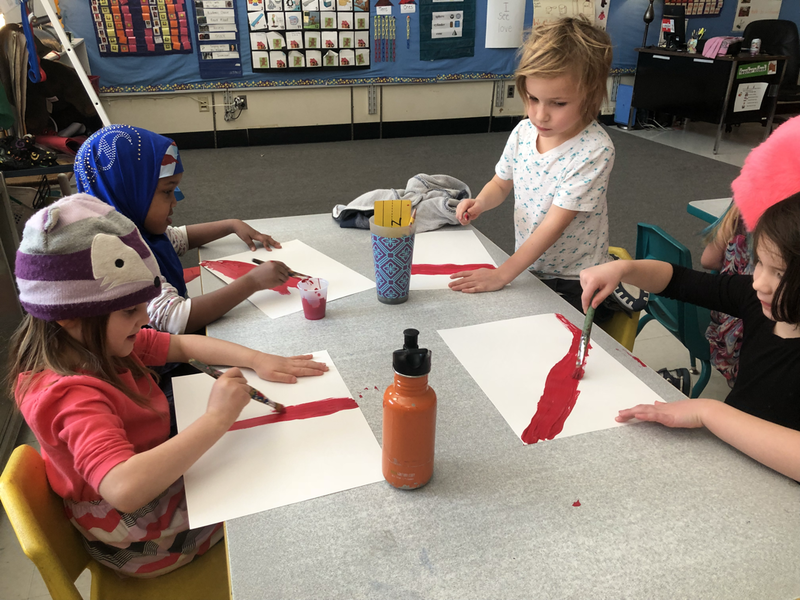 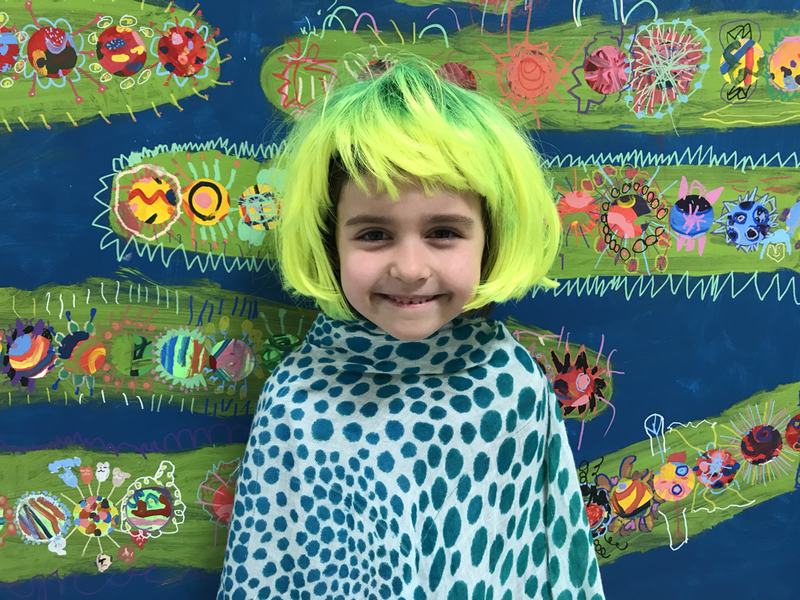 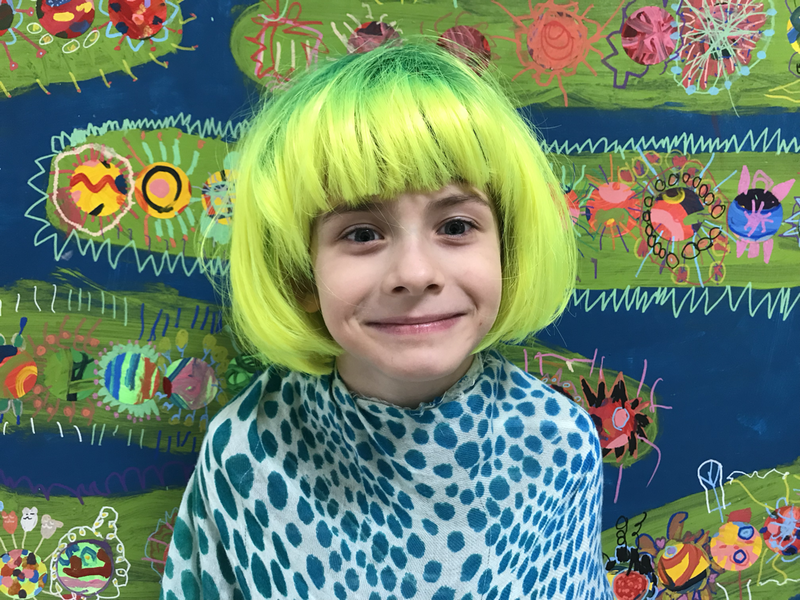 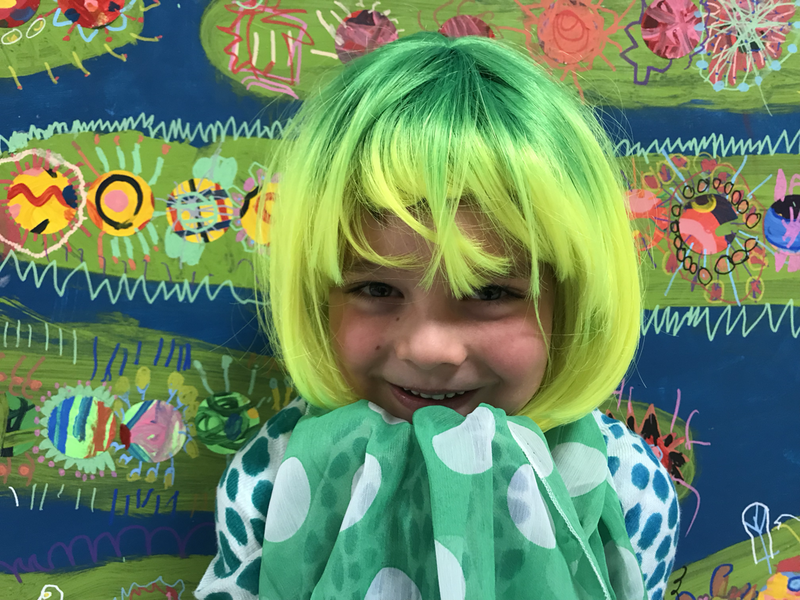 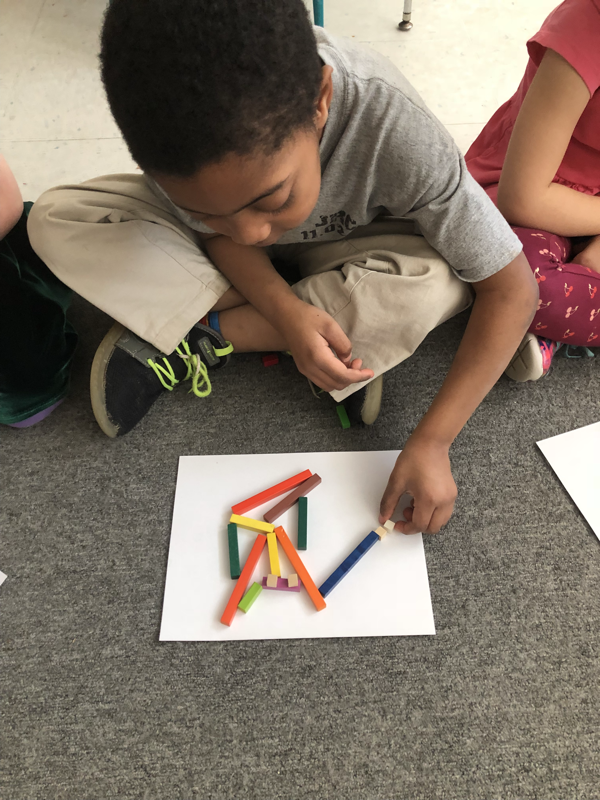 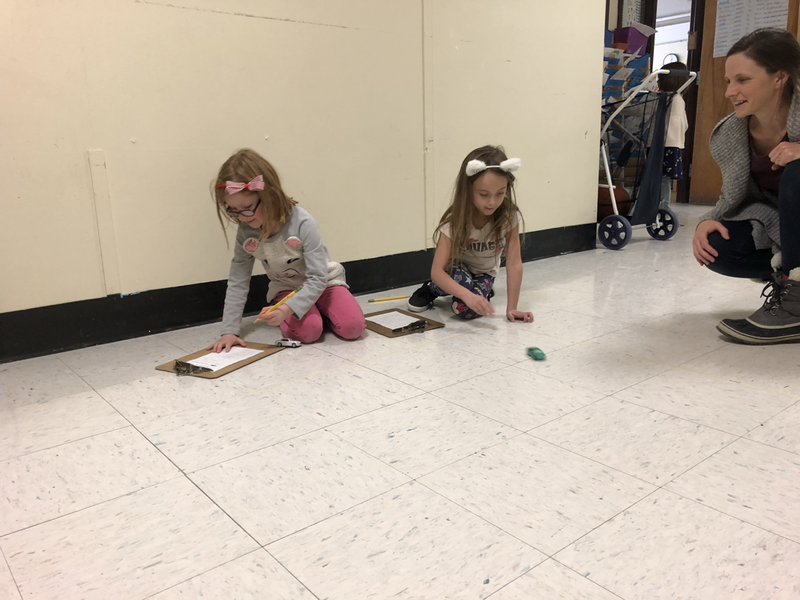 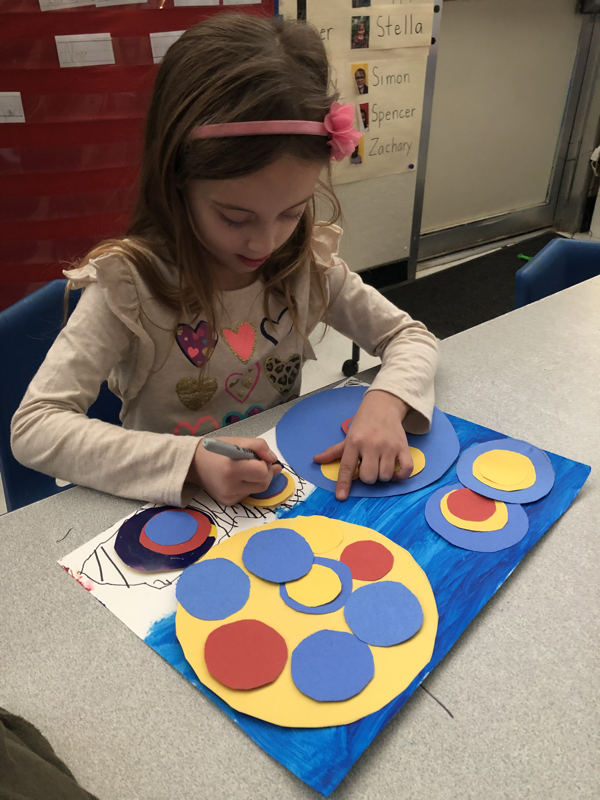 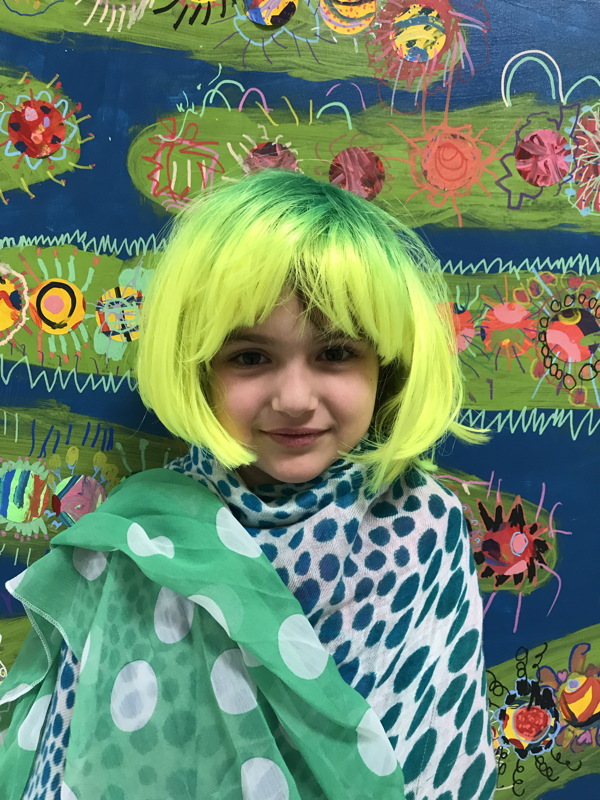 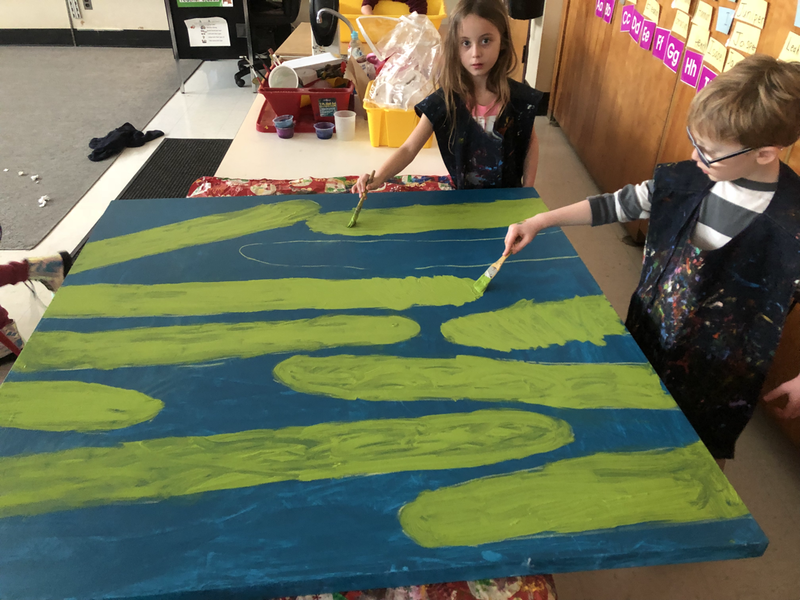 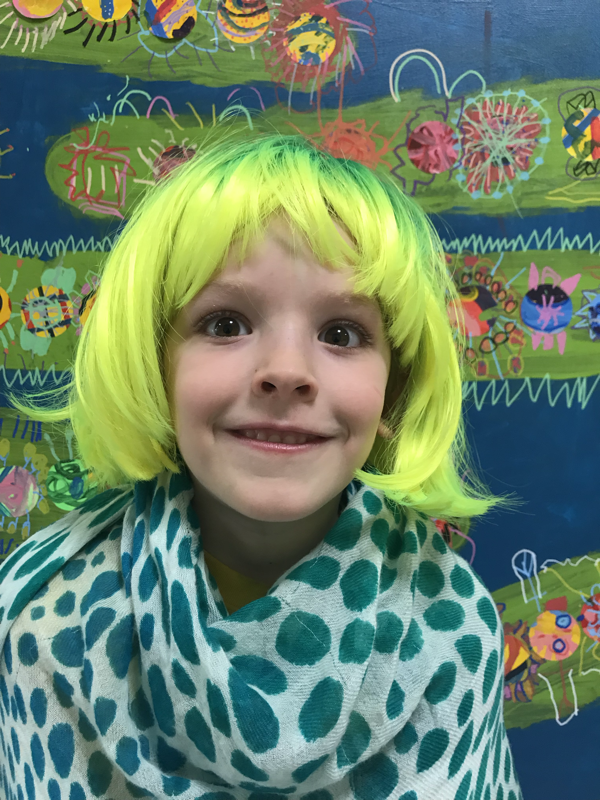 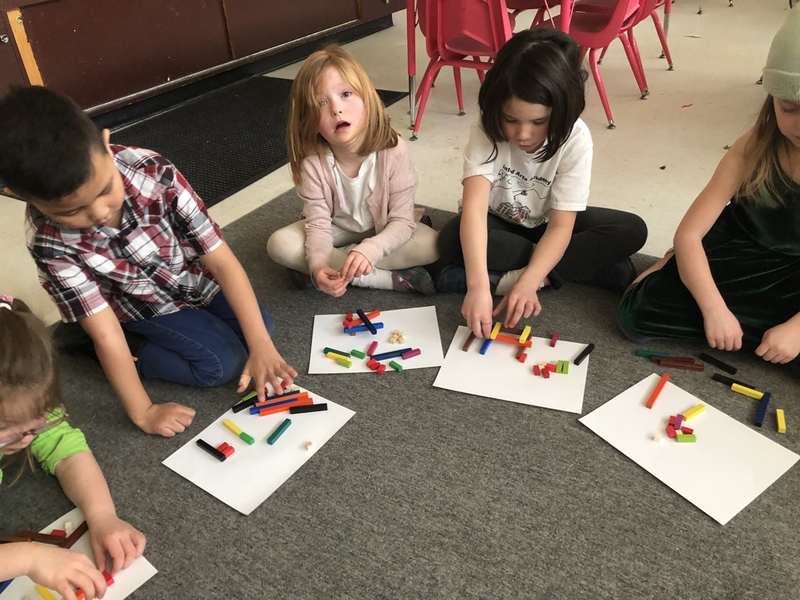 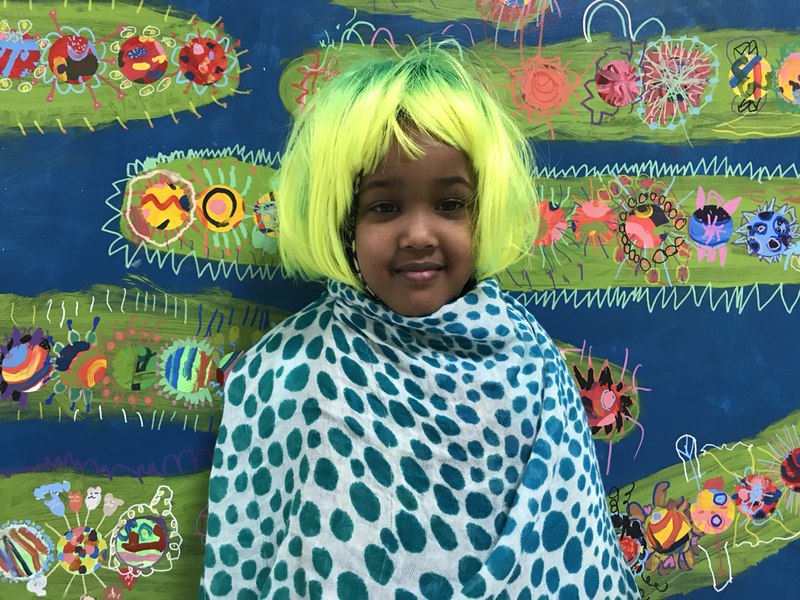 The Kindergarten students have been inspired by the “princess of dots!” Here are some photos of the month long project integrating math and visual art with the fabulous Ms. Judy. 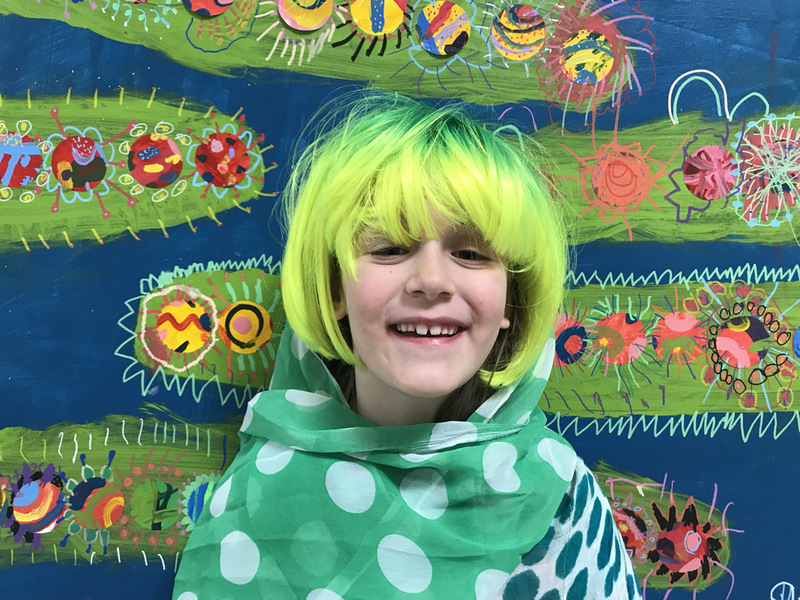 After completing our 100 dot painting, students posed in front of it in true Yayoi fashion! 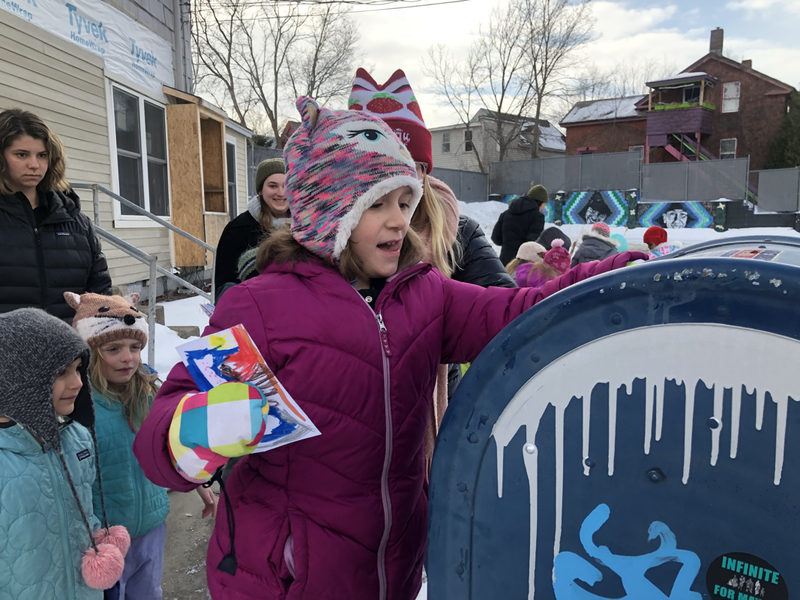 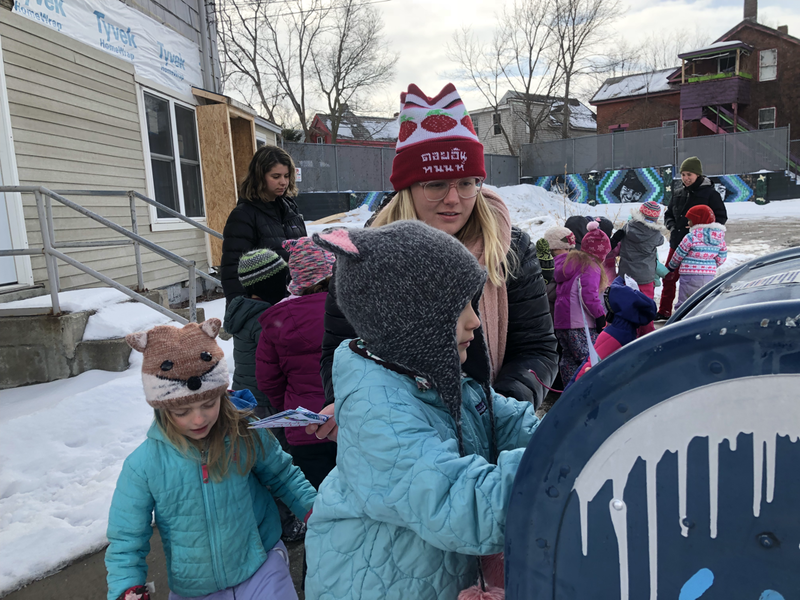 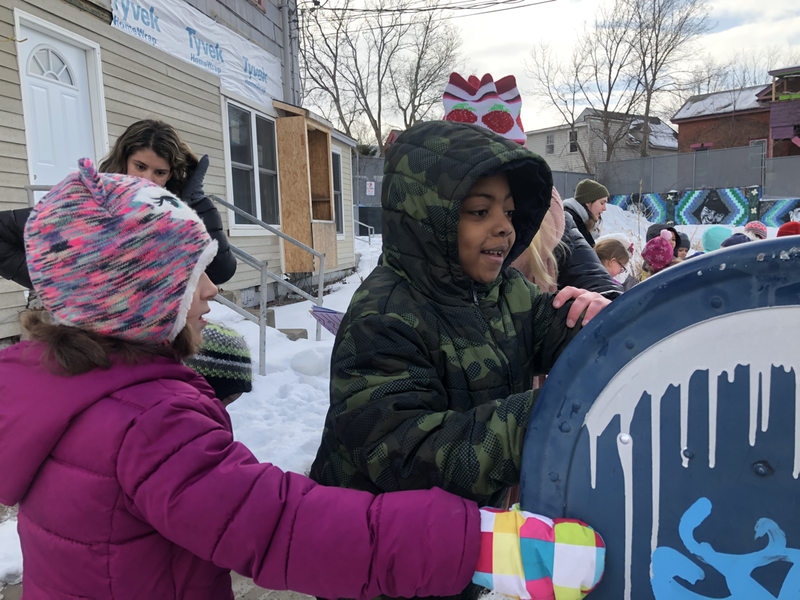 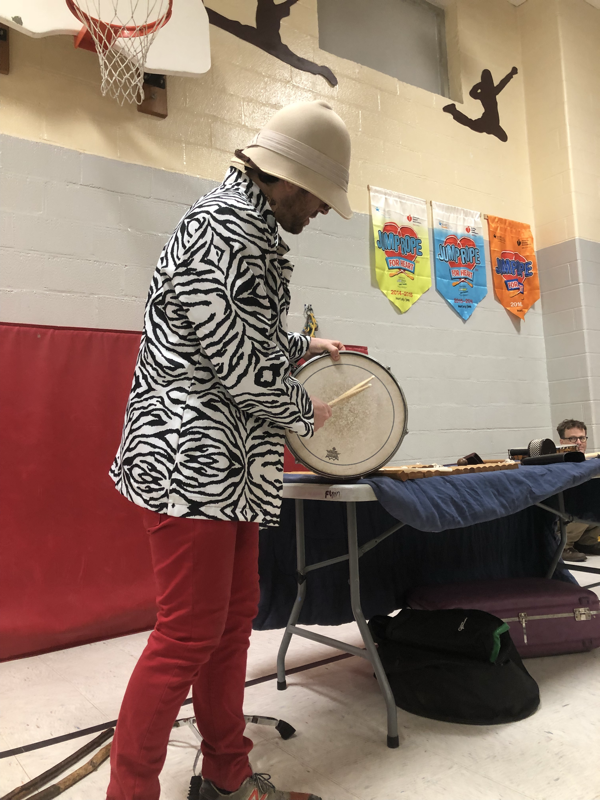 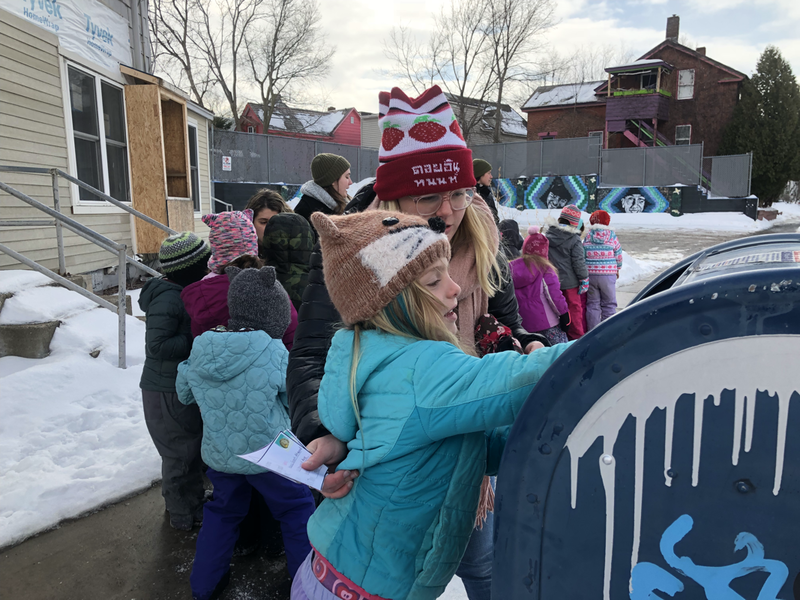 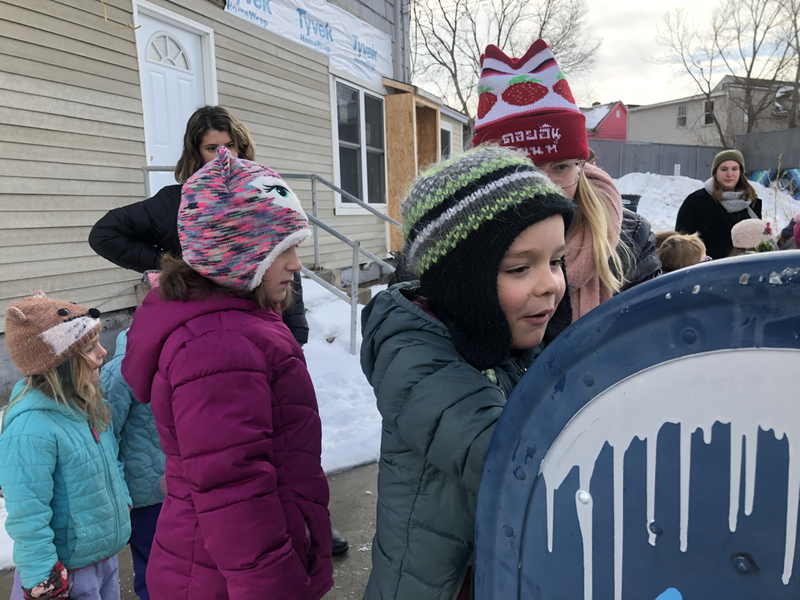 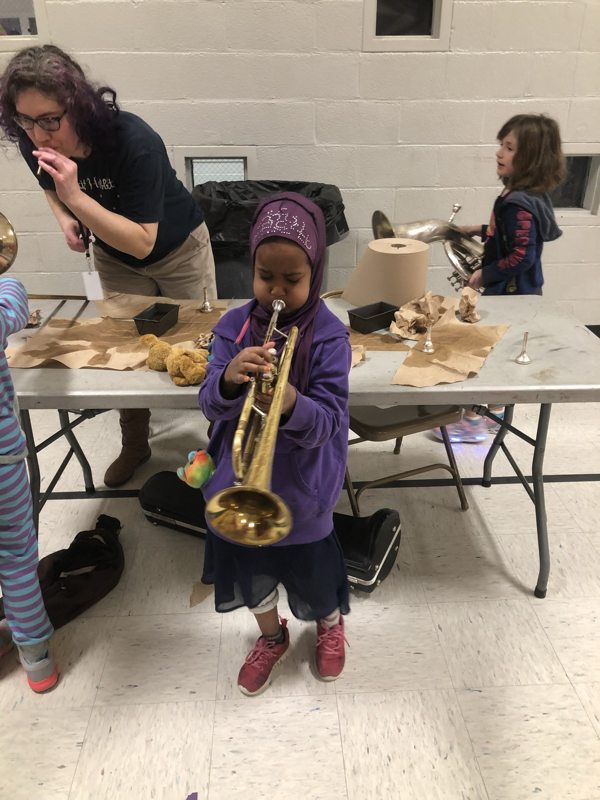 The Vermont Symphony Orchestra sponsored a super fun musical petting zoo. 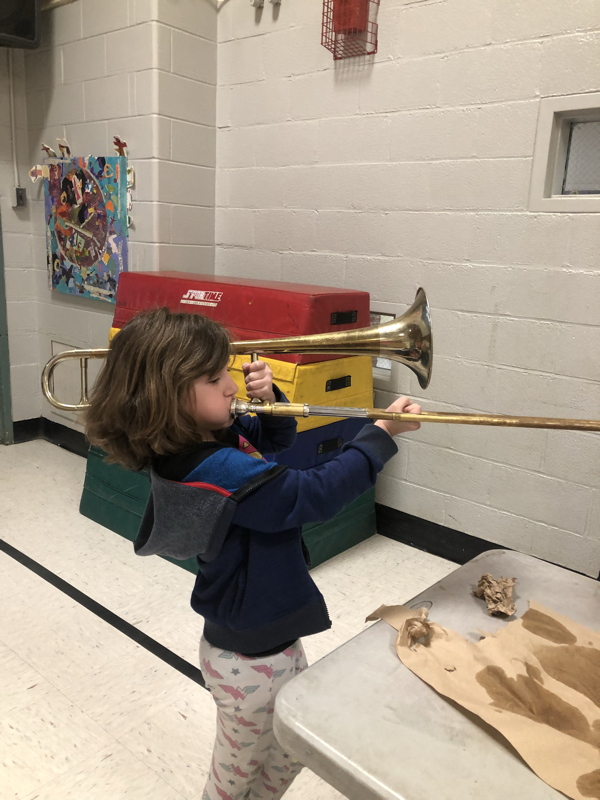 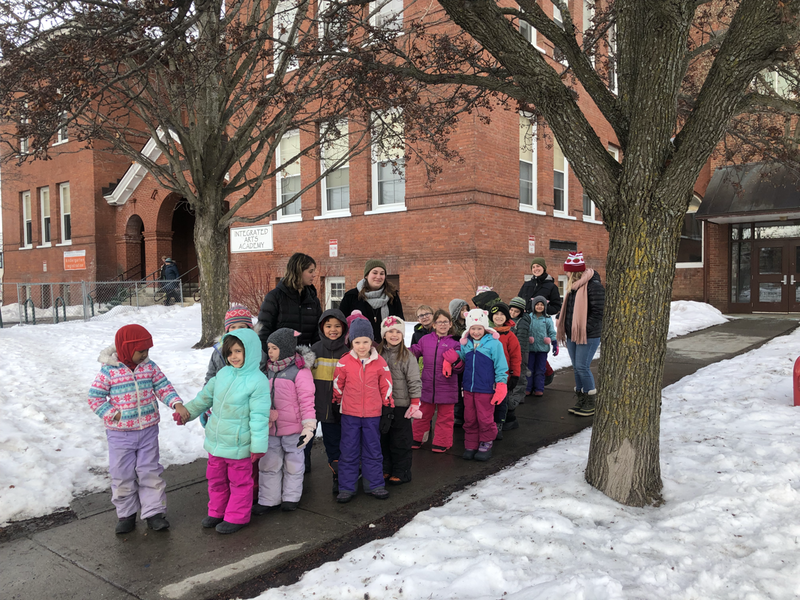 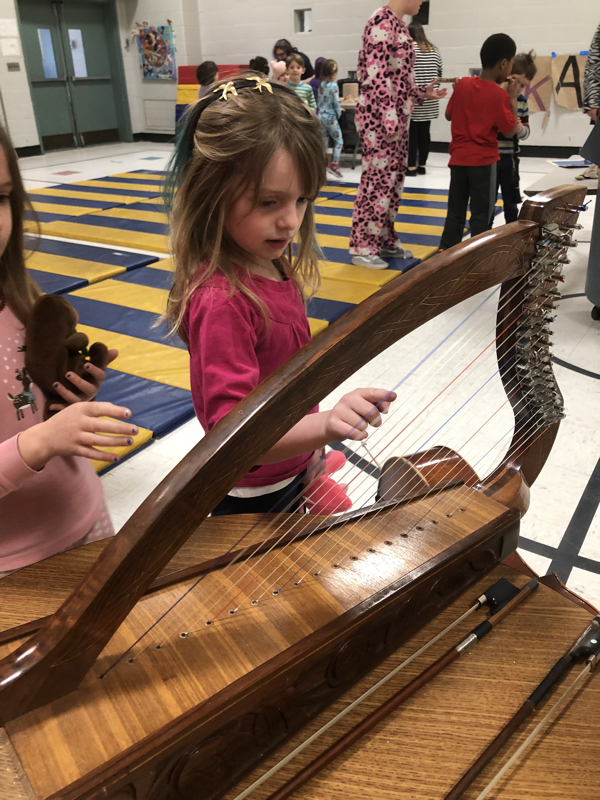 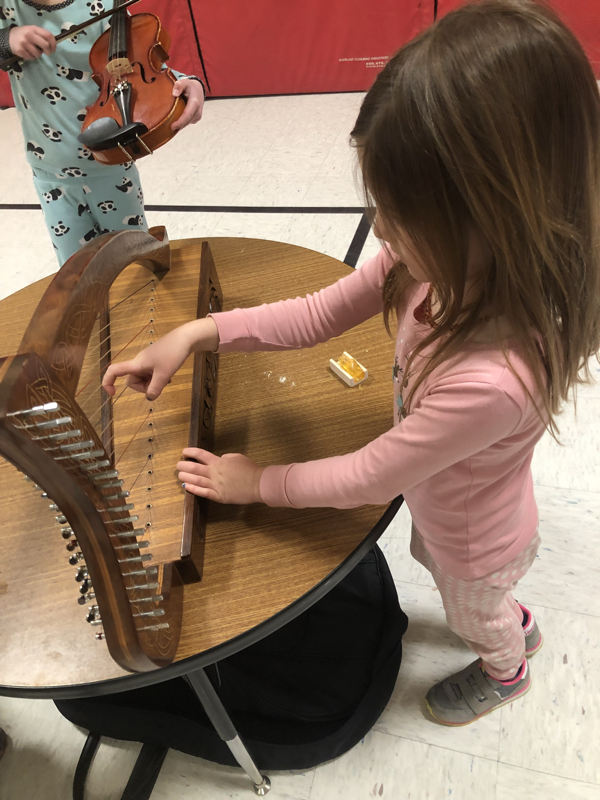 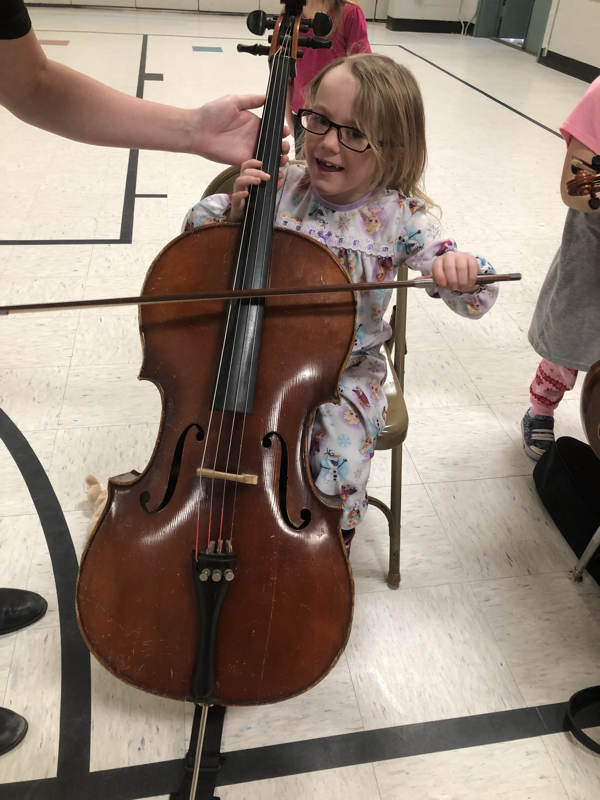 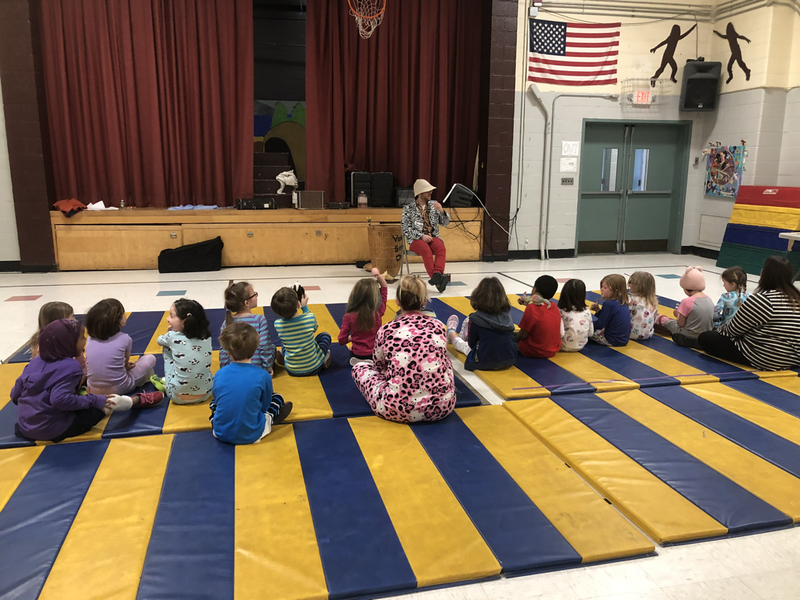 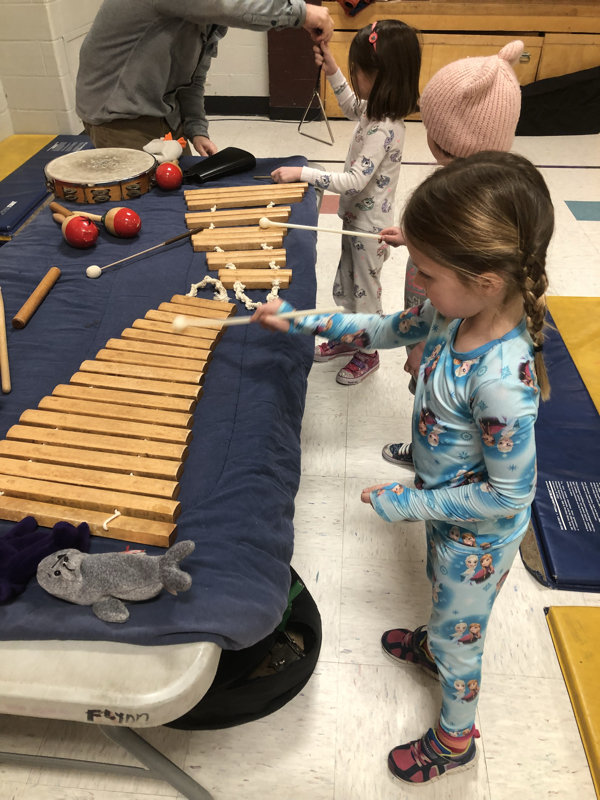 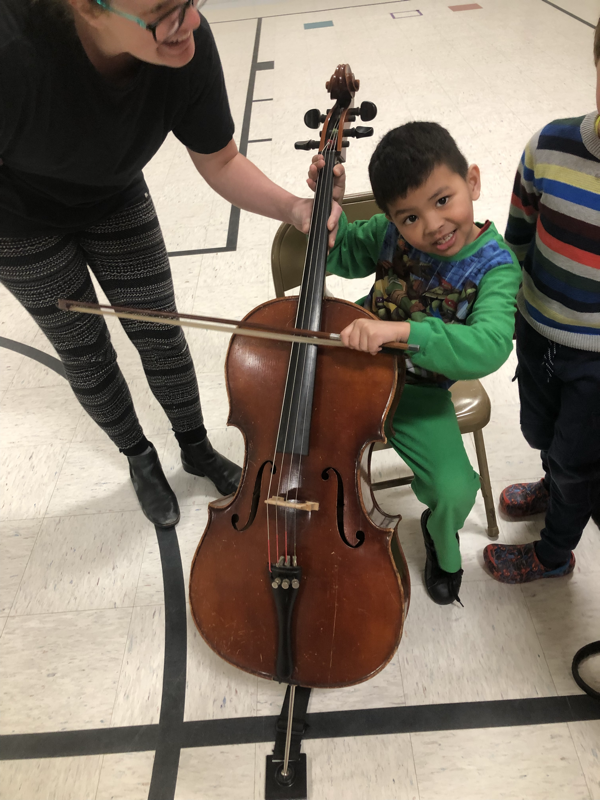 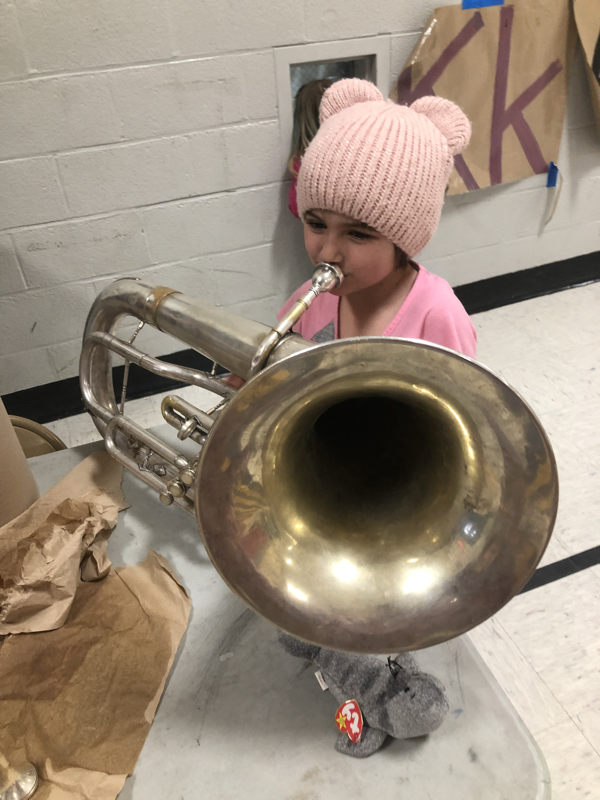 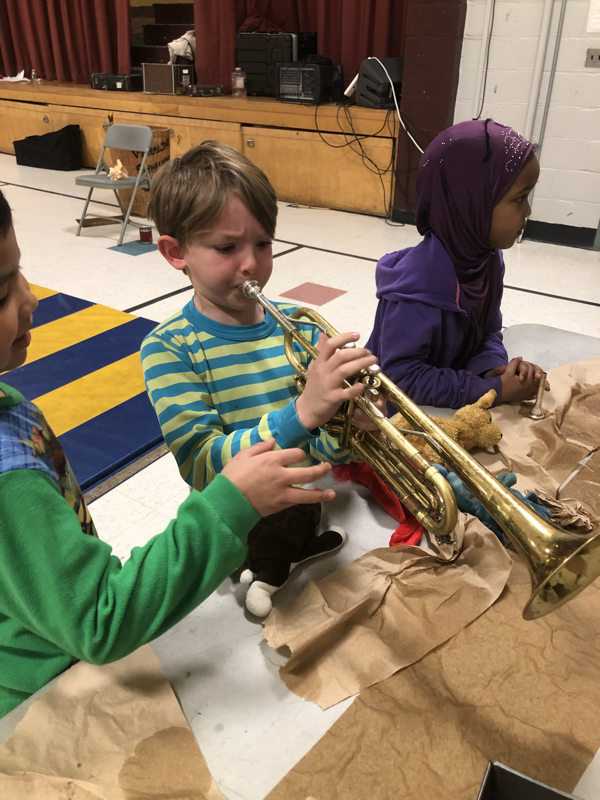 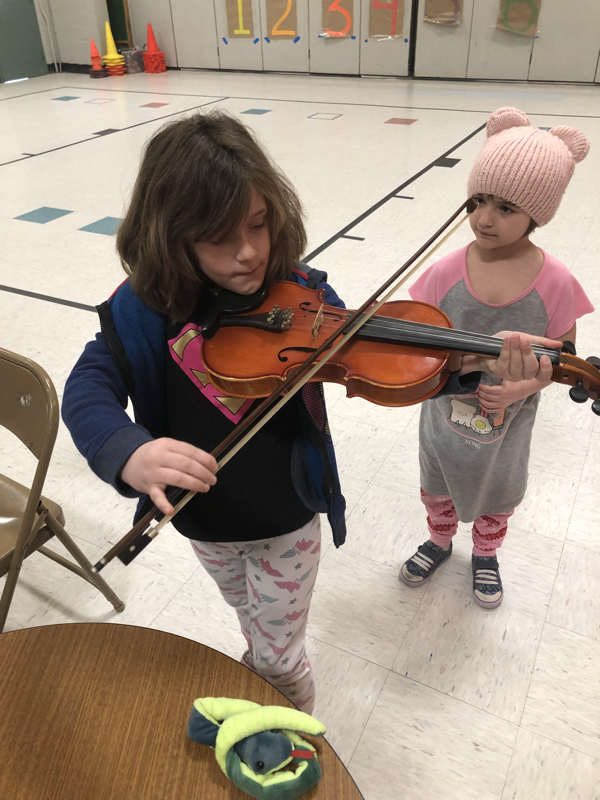 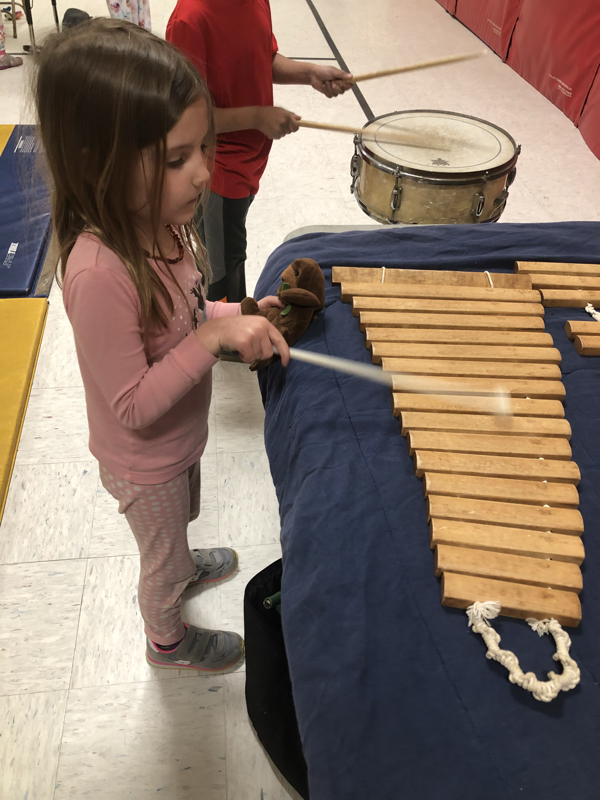 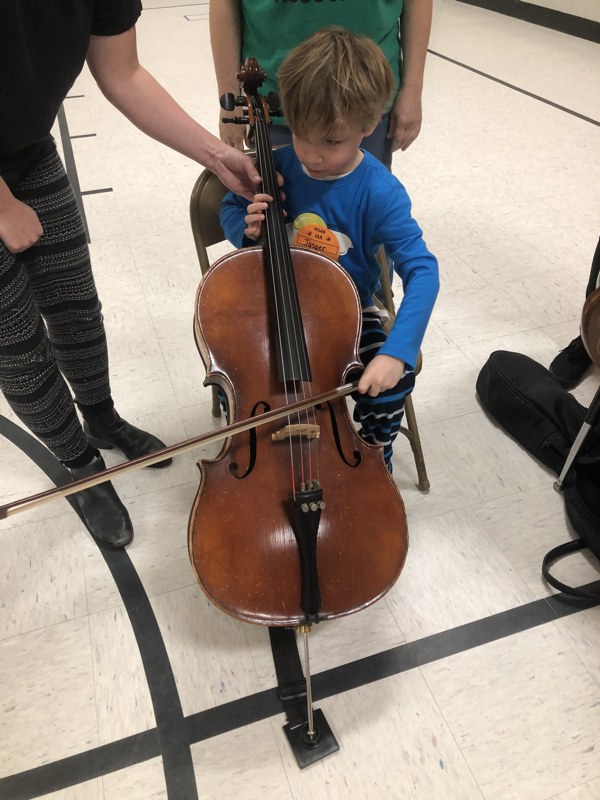 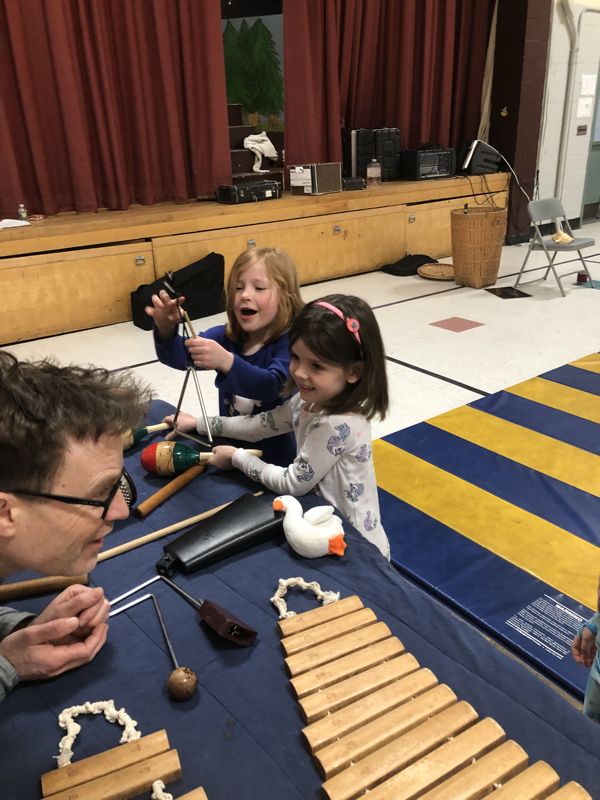 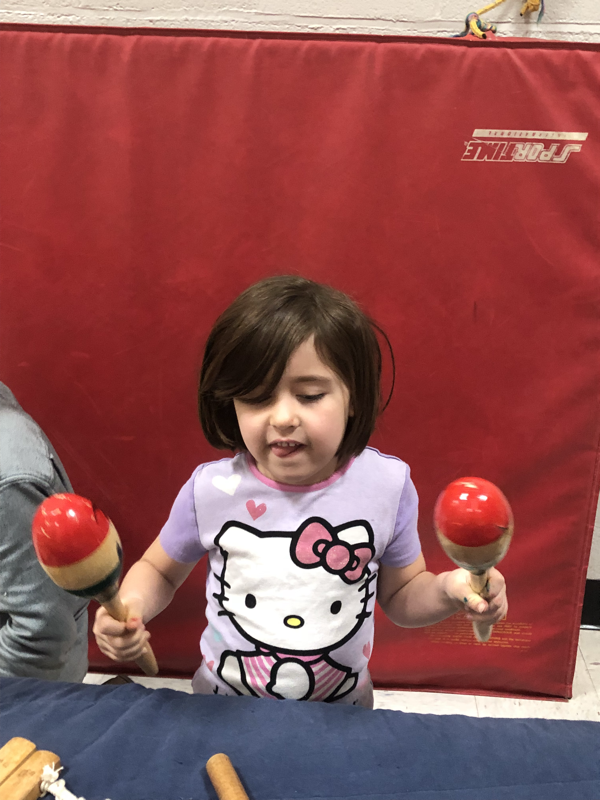 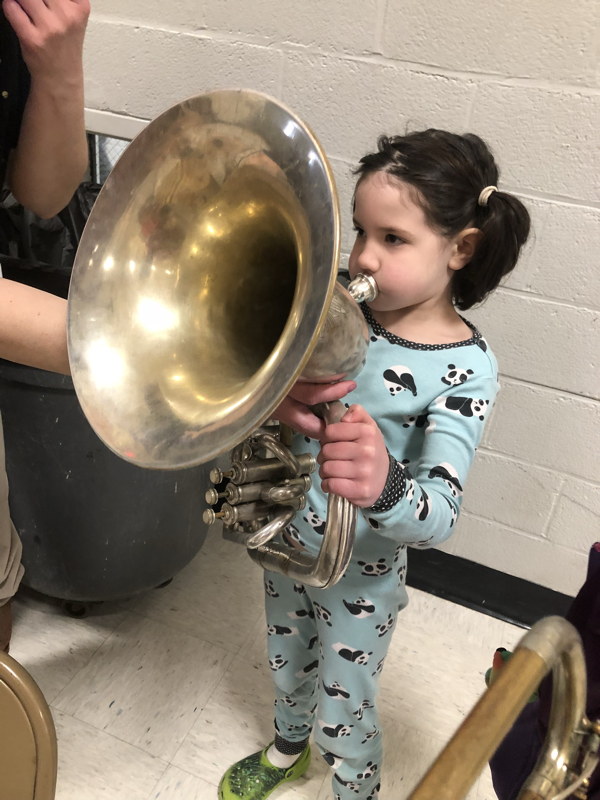 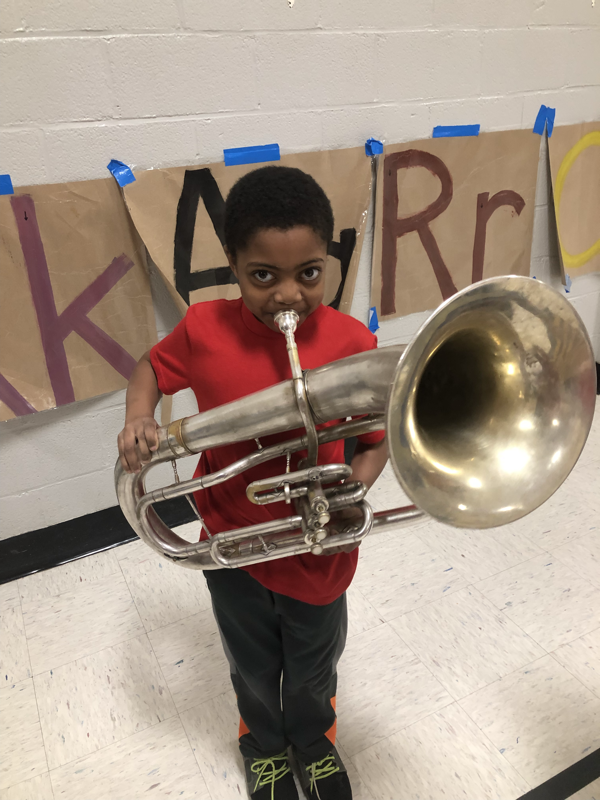 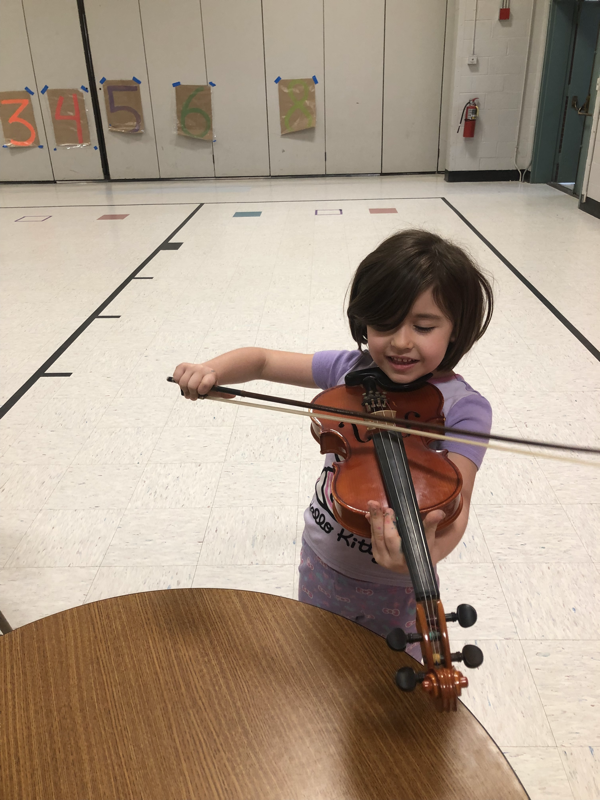 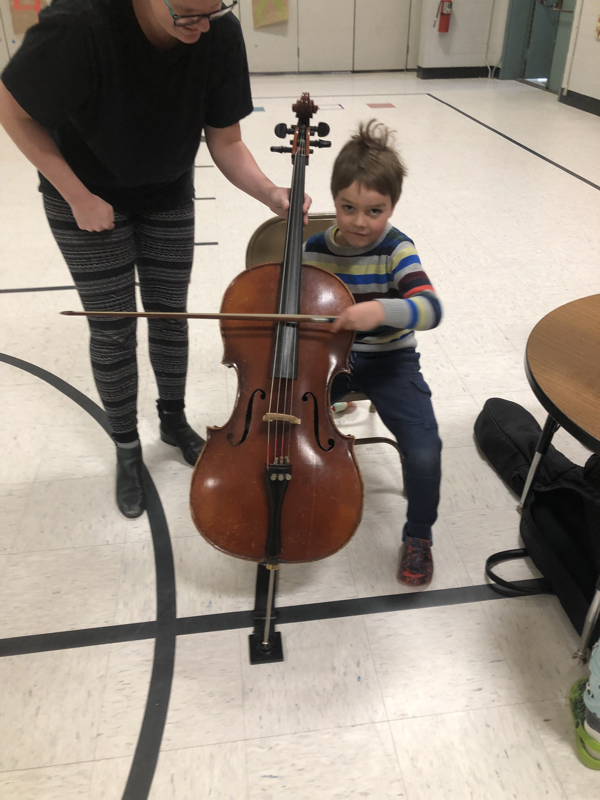 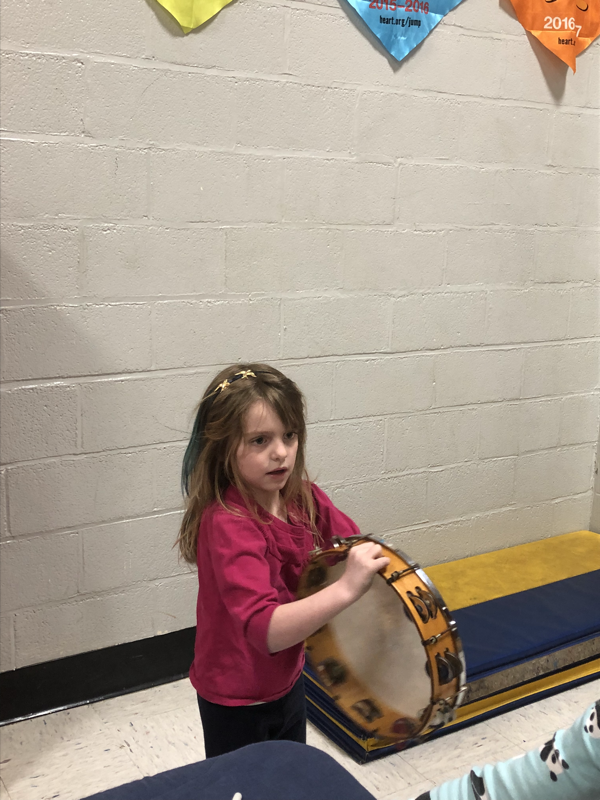 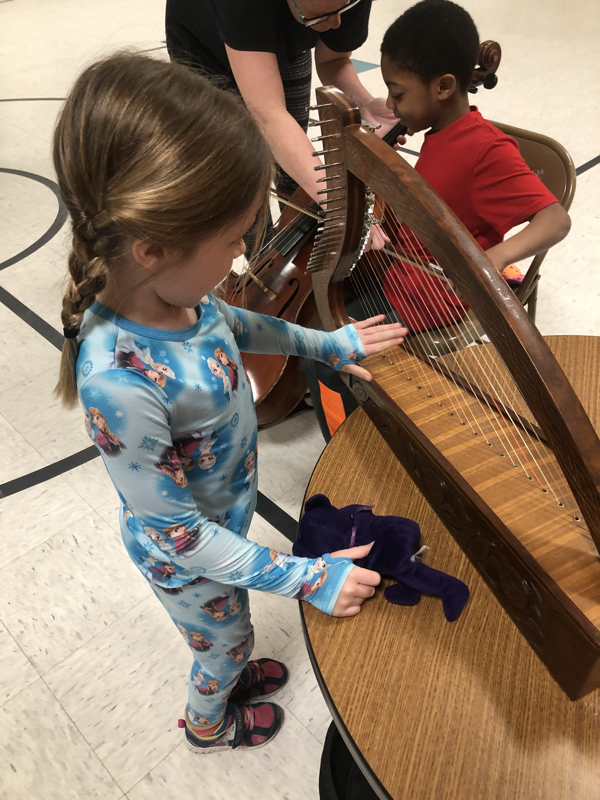 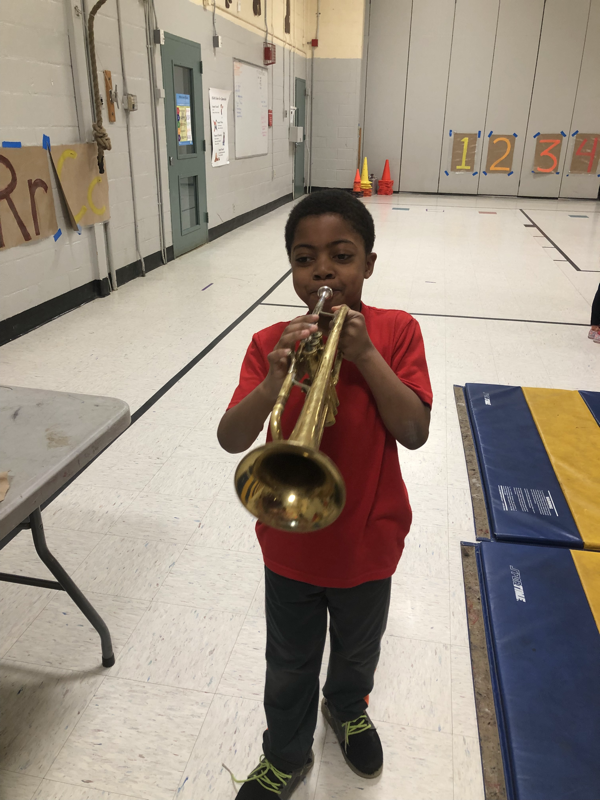 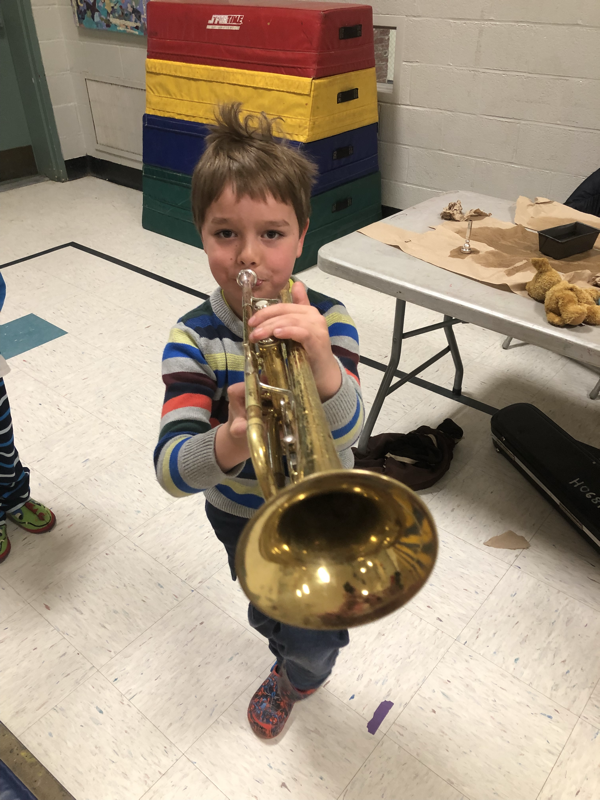 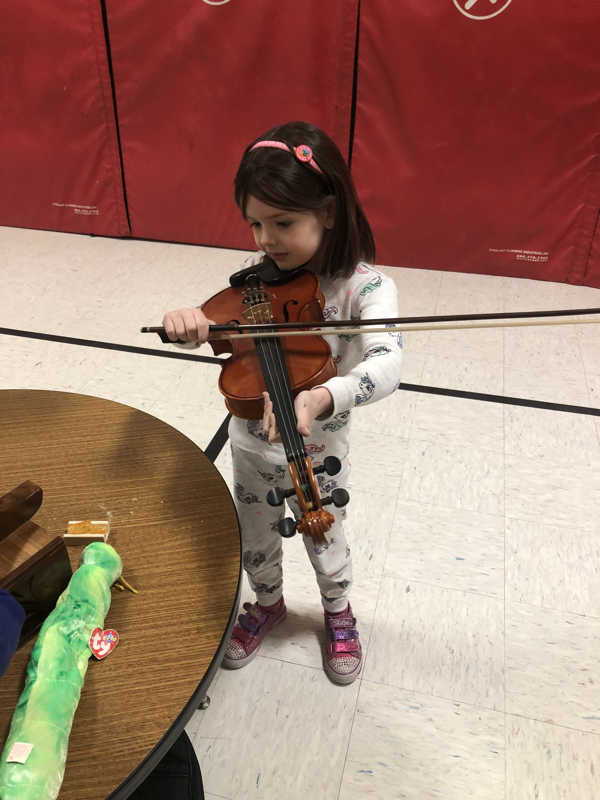 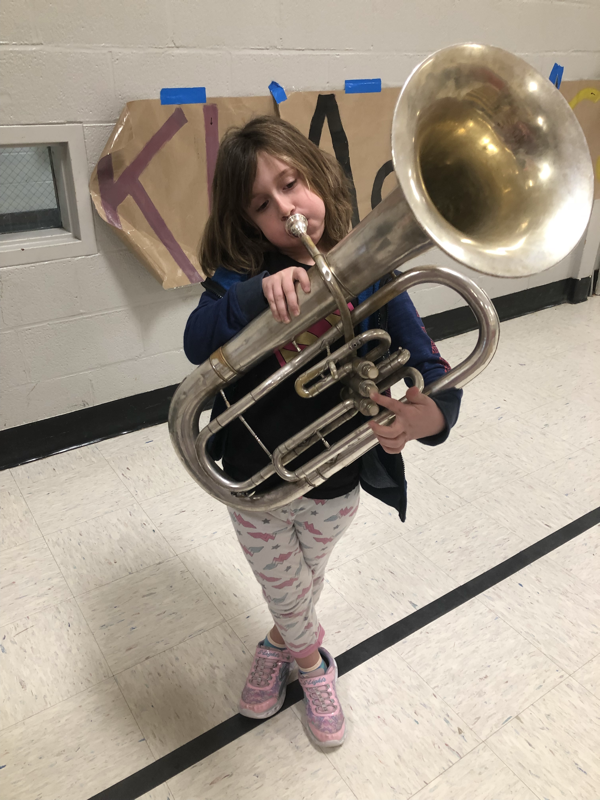 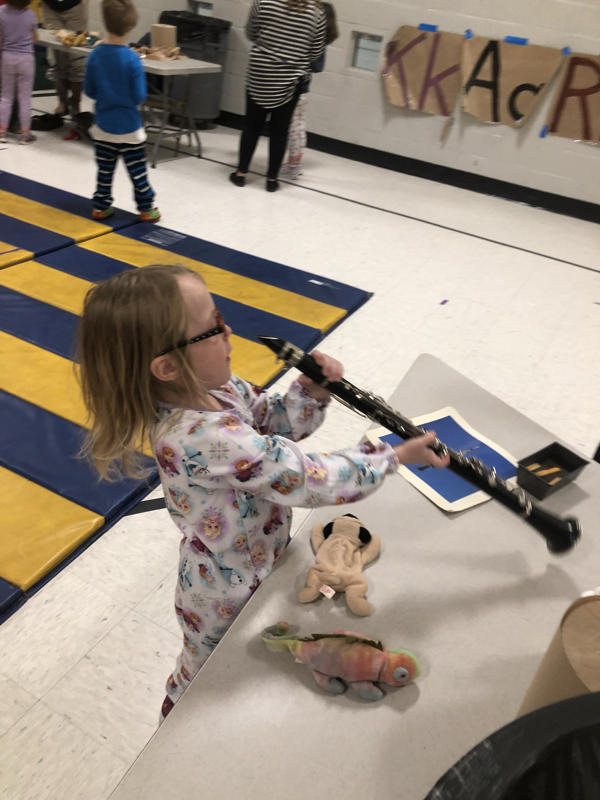 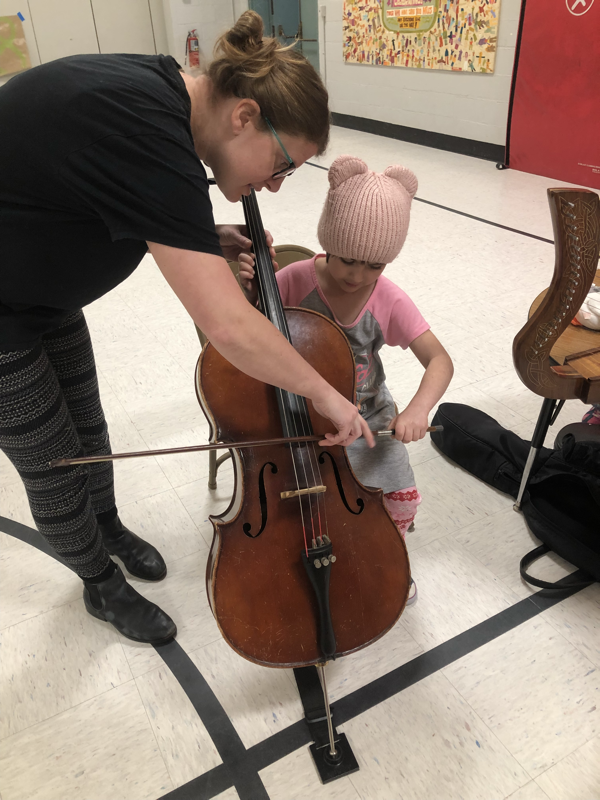 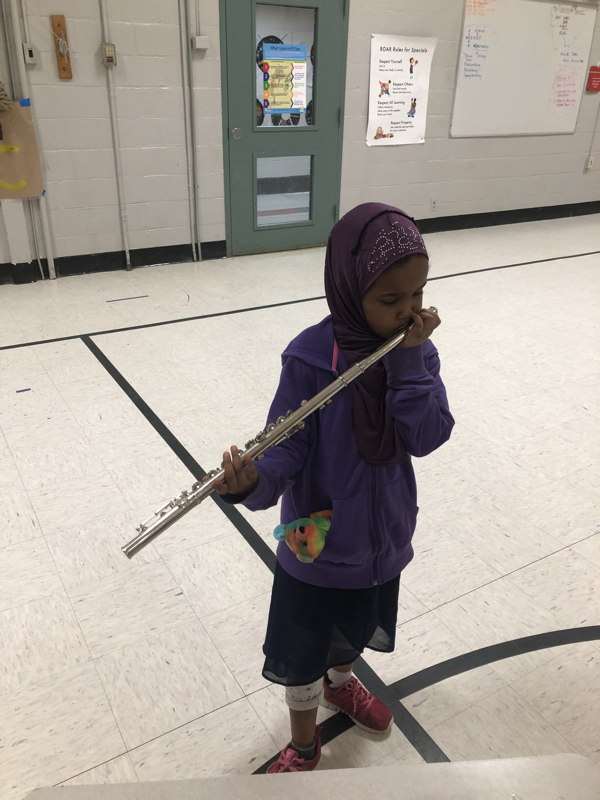 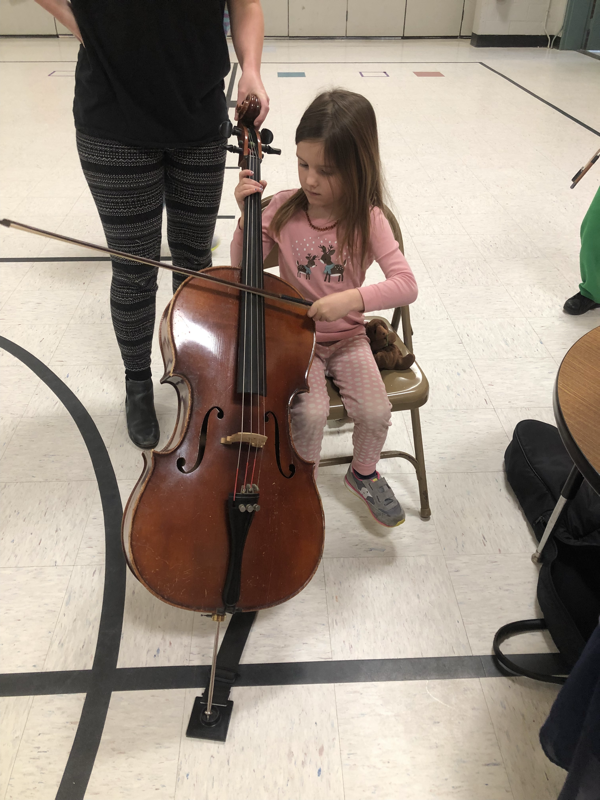 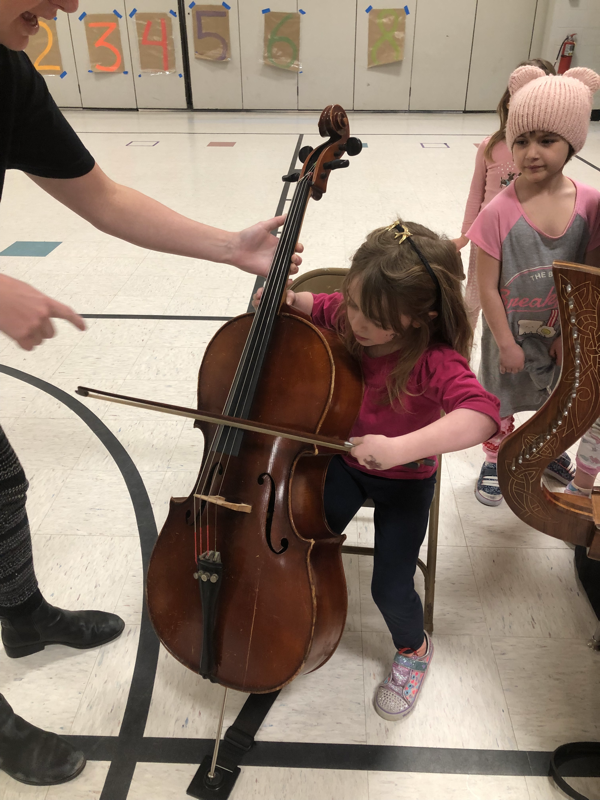 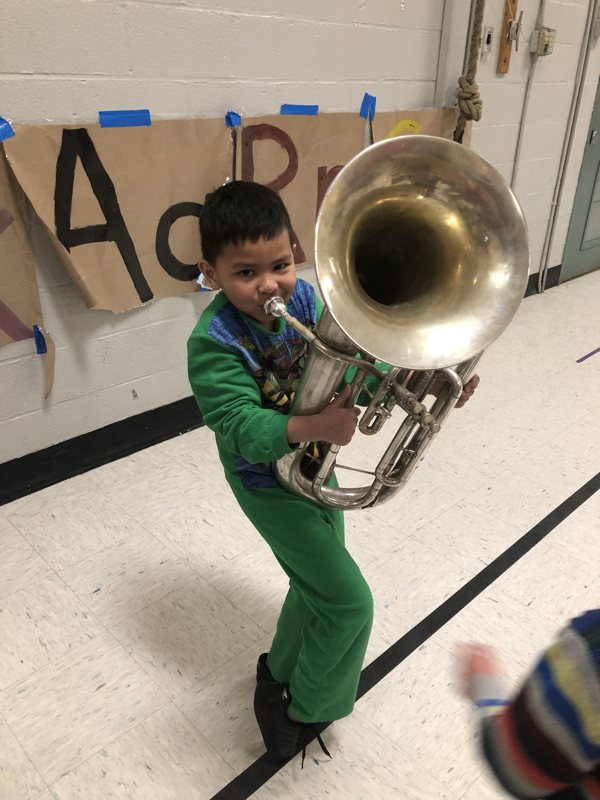 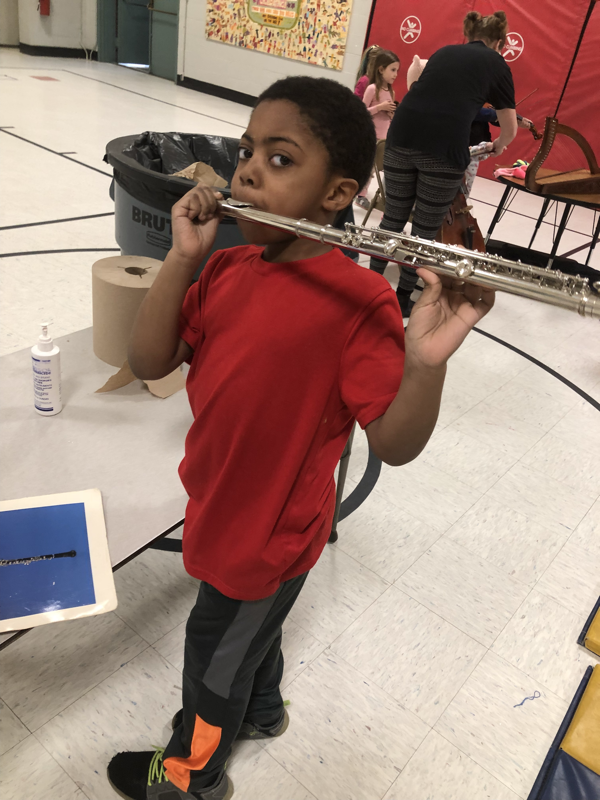 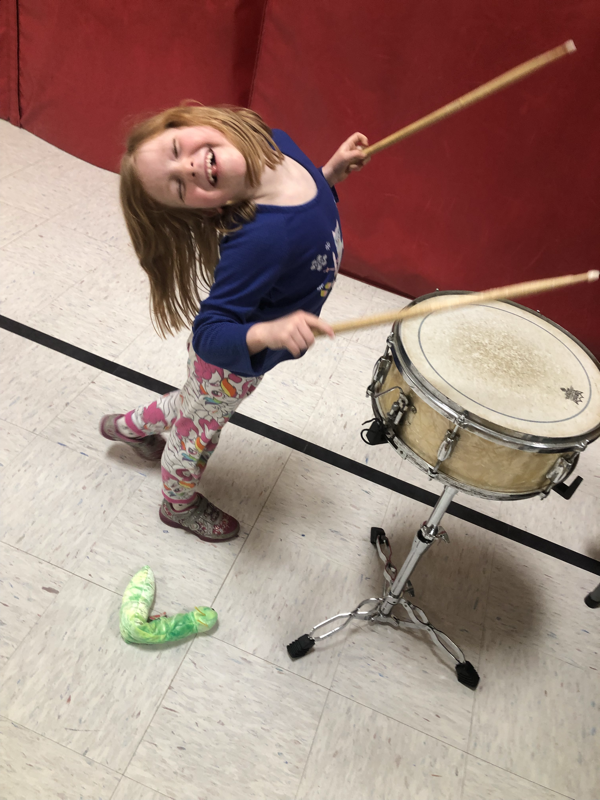 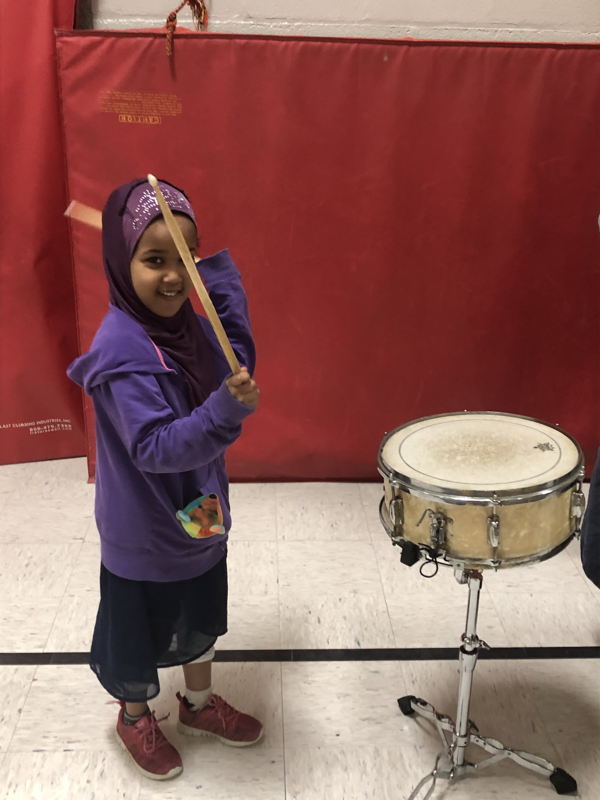 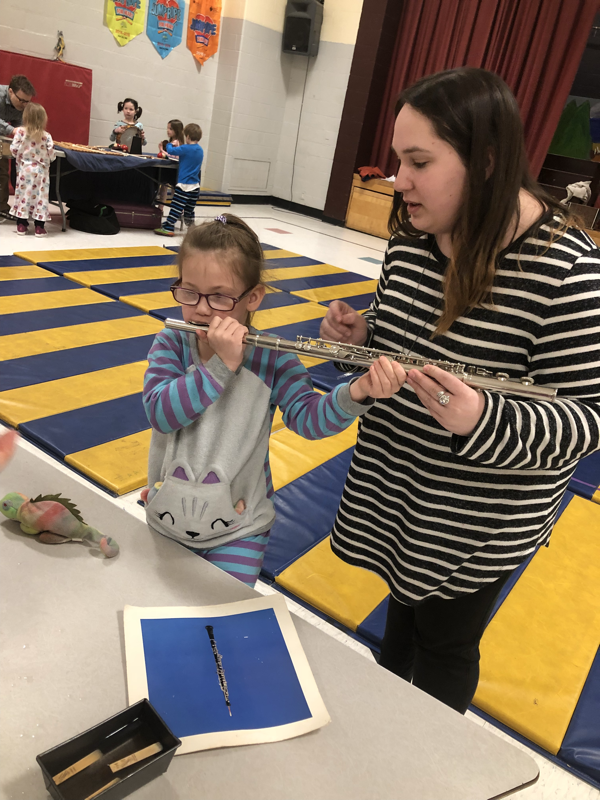 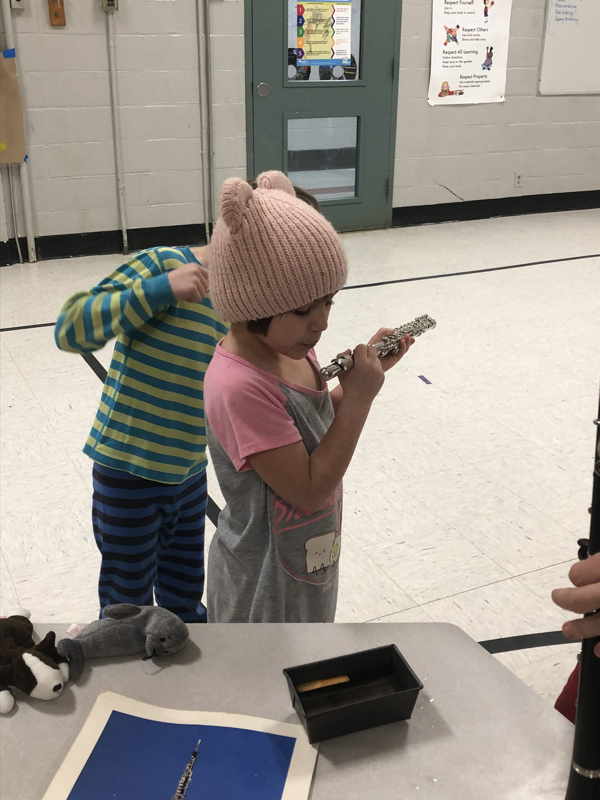 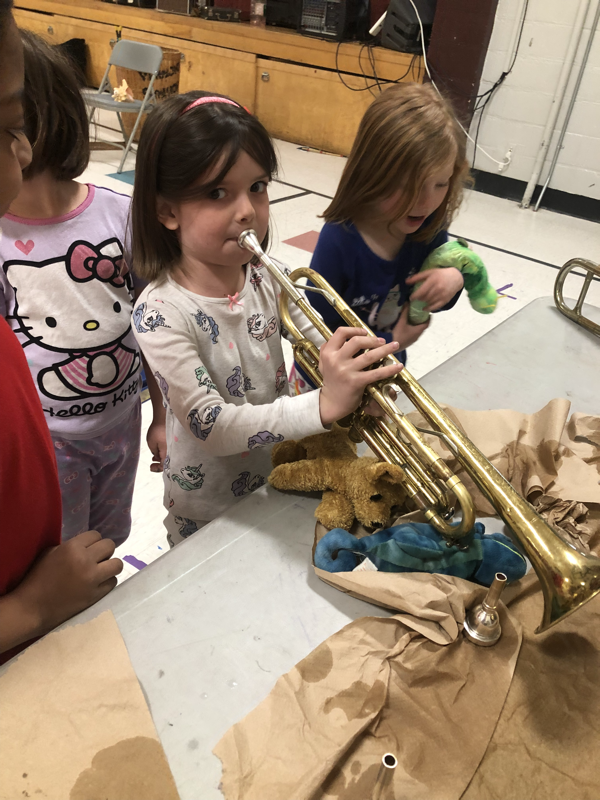 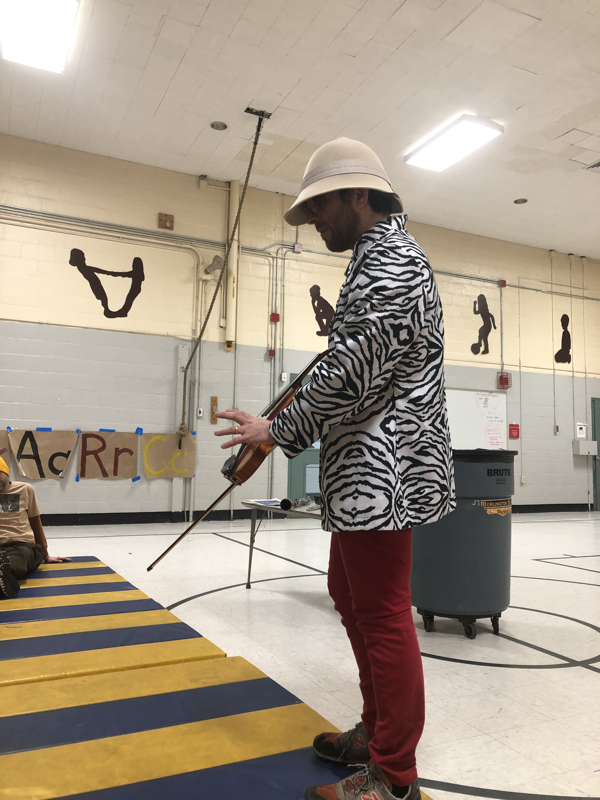 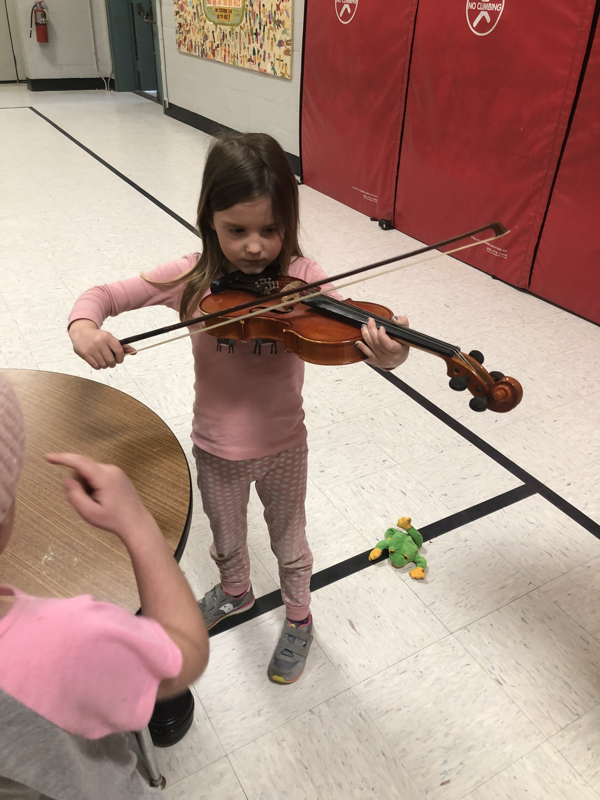 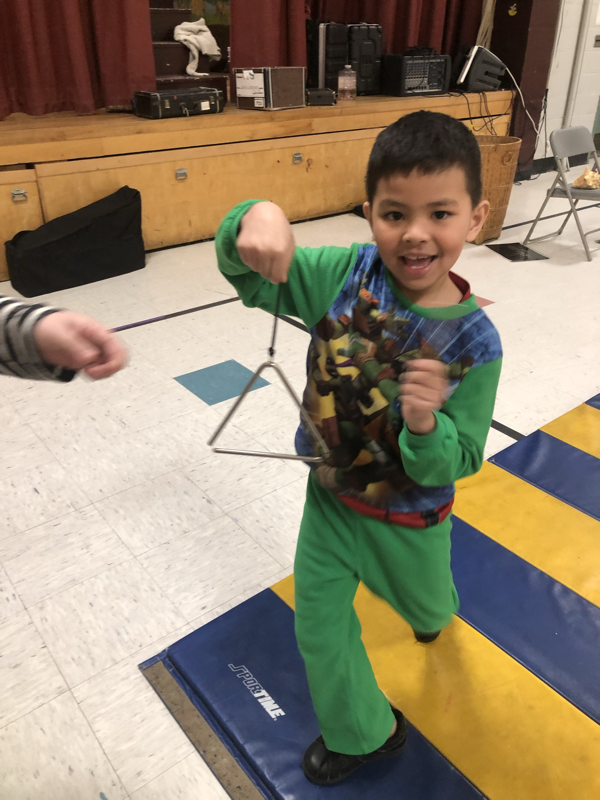 The kindergarten students learned about the different families of instruments and then had a chance to play some many types- violins & harps, clarinets & flutes, trombones & trumpets and lots of different percussion instruments. 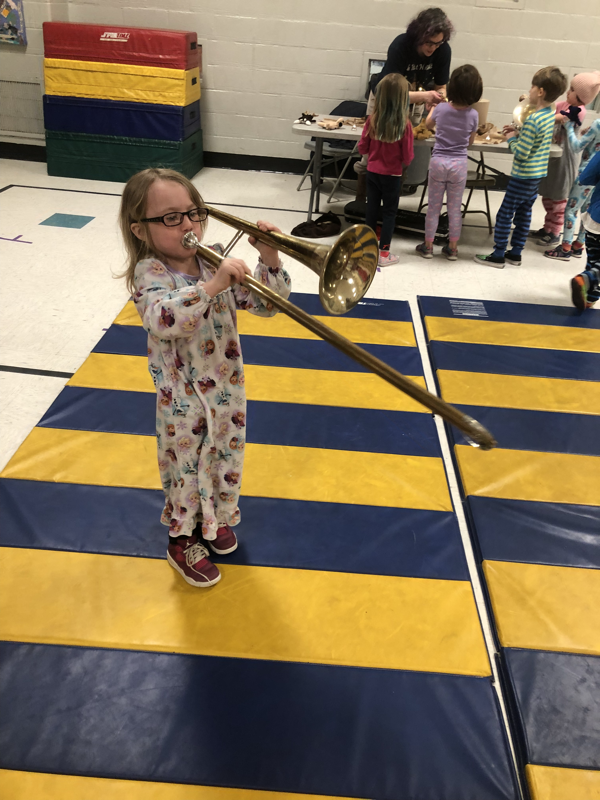 Of course, everything was made better because we were in our PJs for a 100 ROAR card celebration! 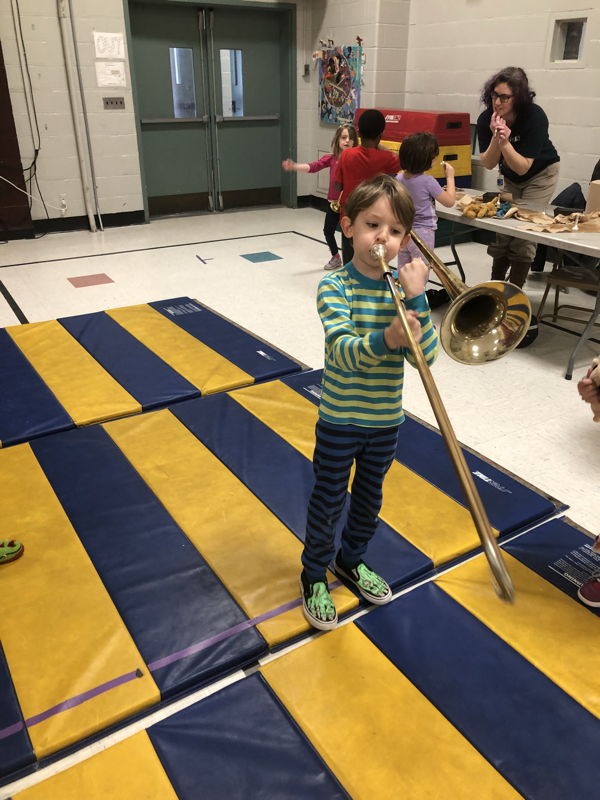 Thanks again to the many volunteers and organizers for helped bring this great event to IAA! 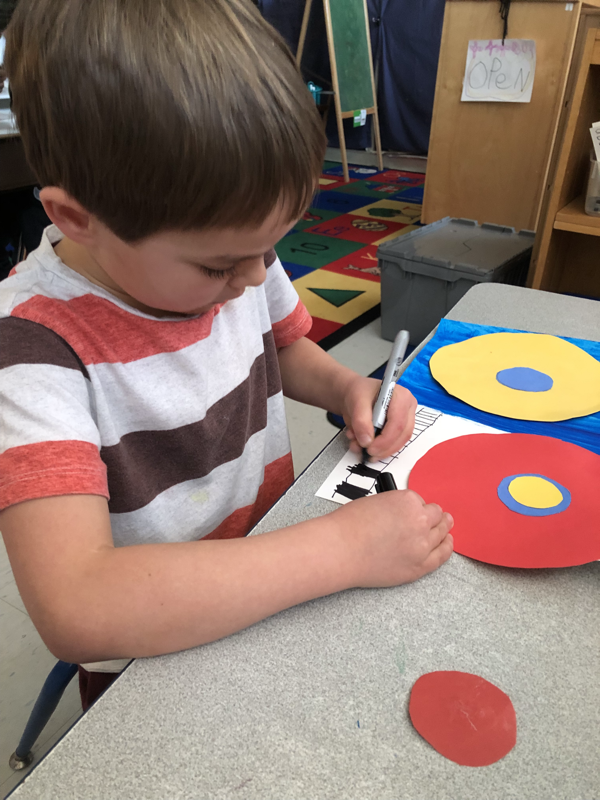 As part of social studies unit this year, we have been learning about different community helpers! 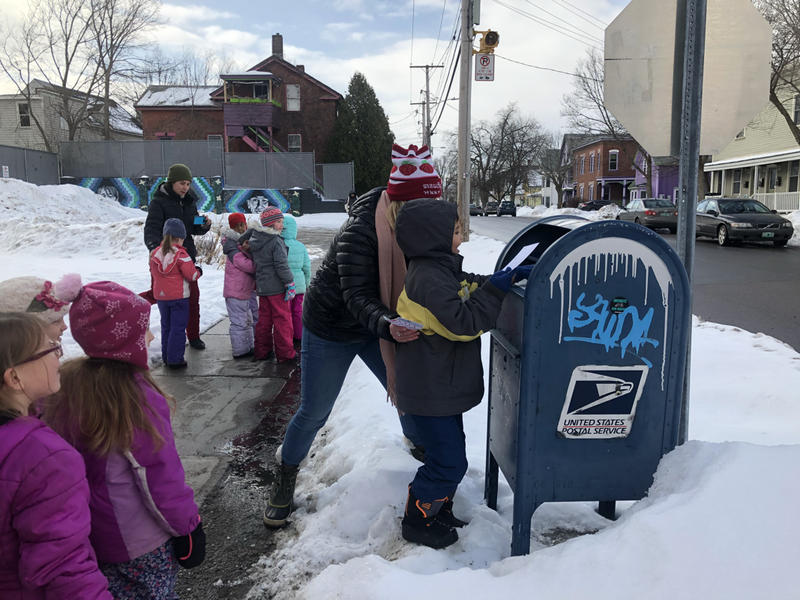 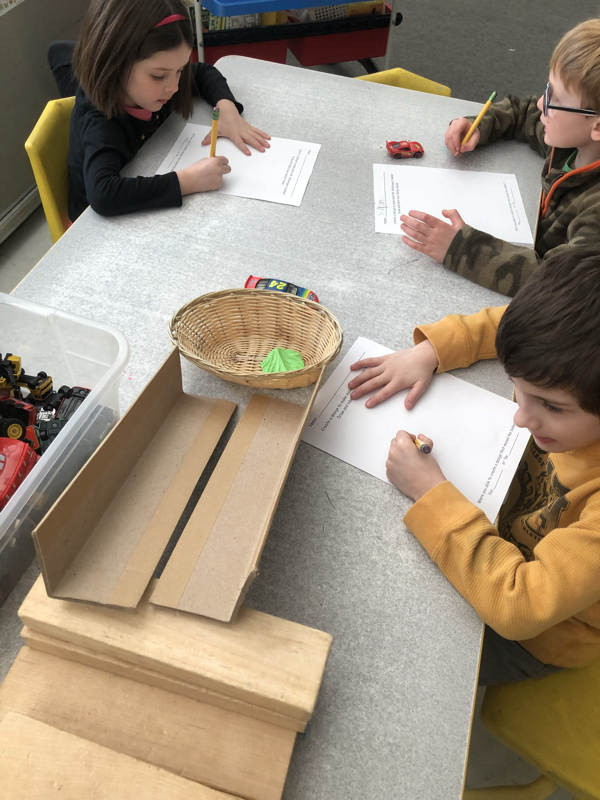 The kindergarten students created a post office in our dramatic play area and learned about the important ways mail carriers help our community. 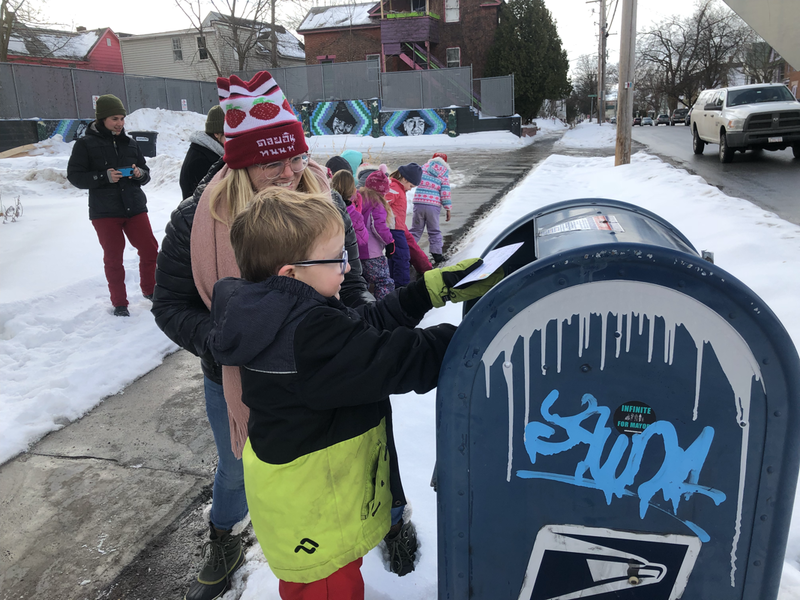 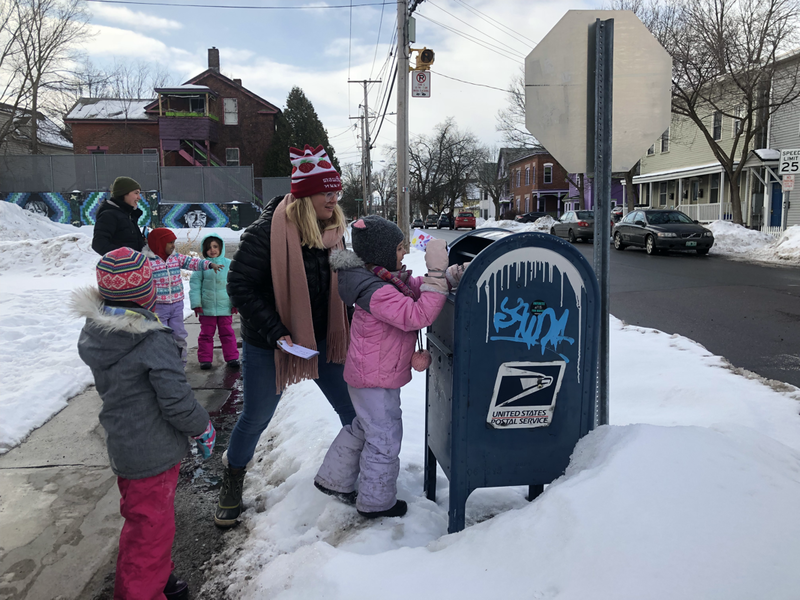 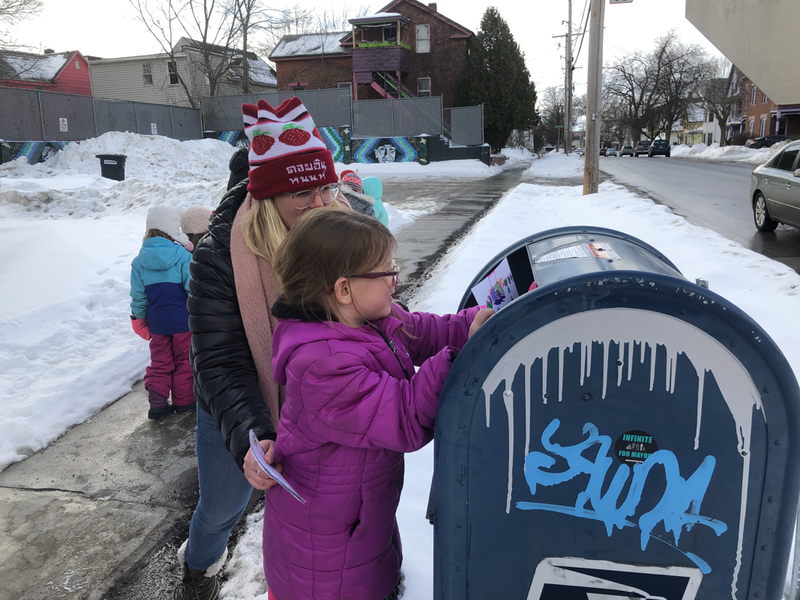 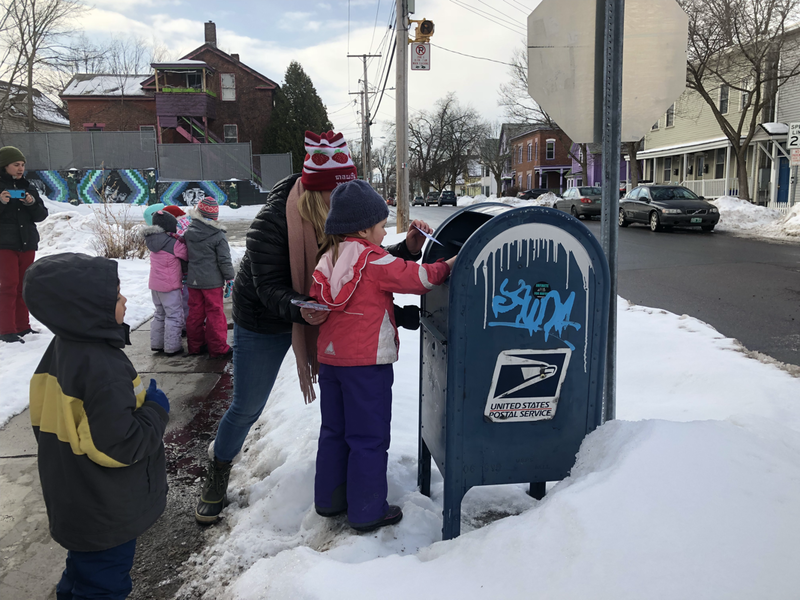 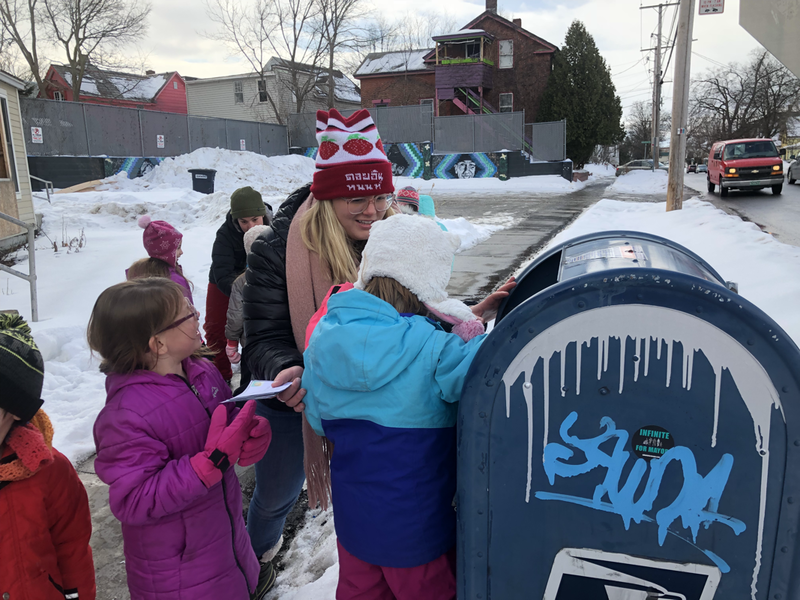 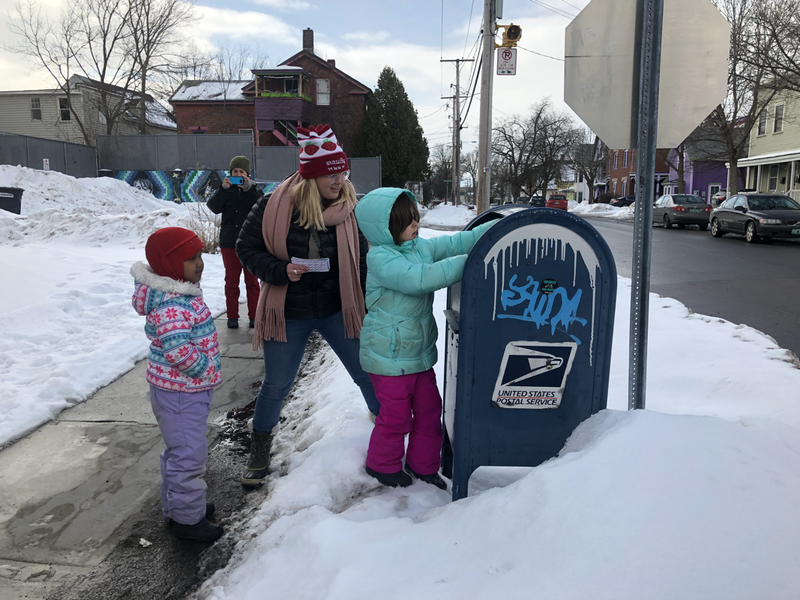 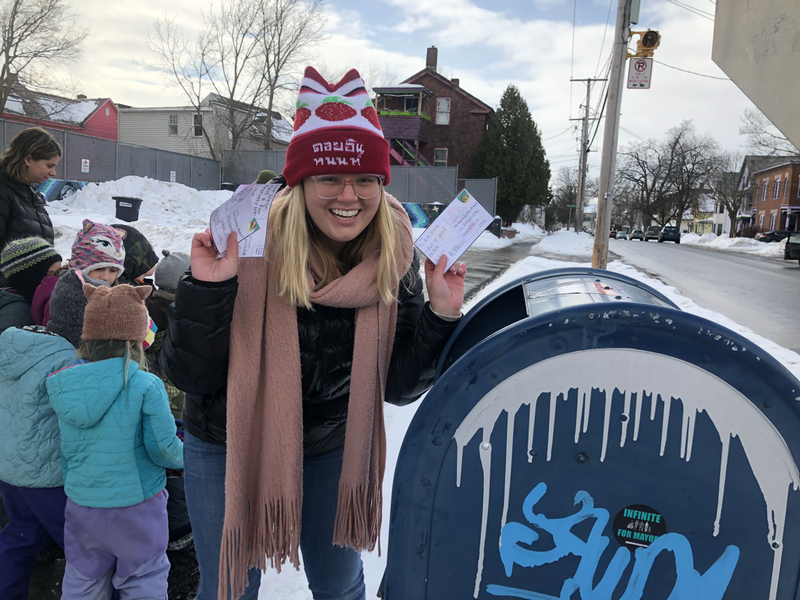 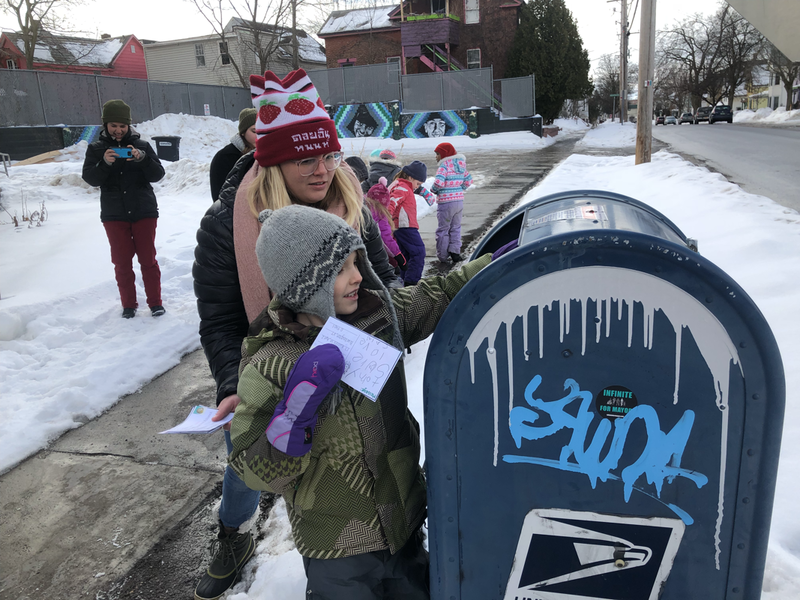 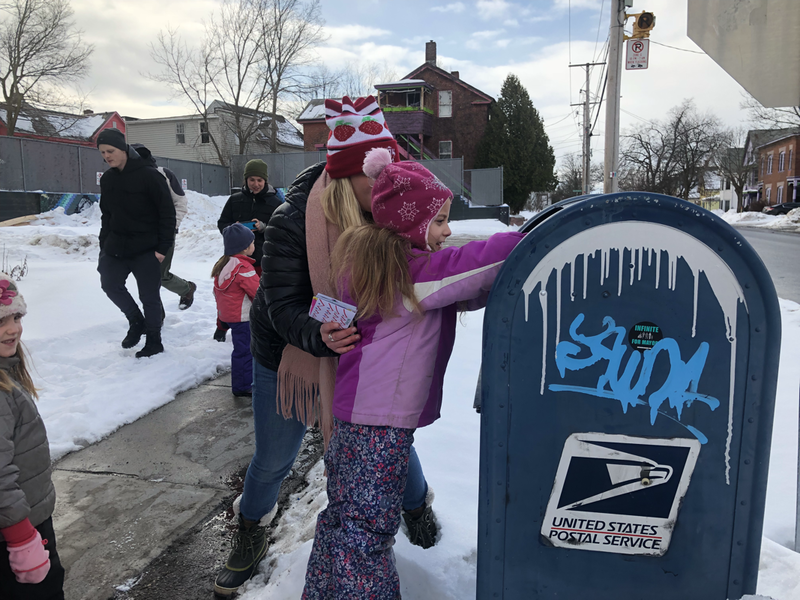 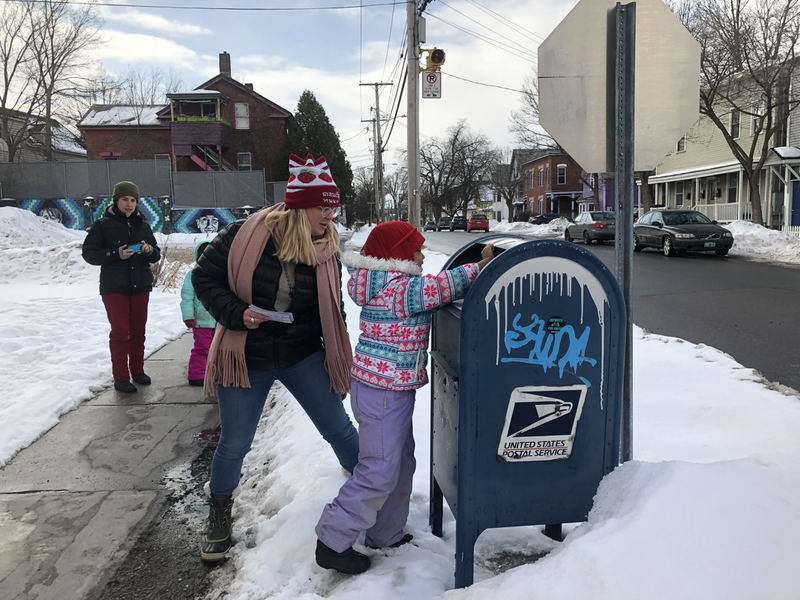 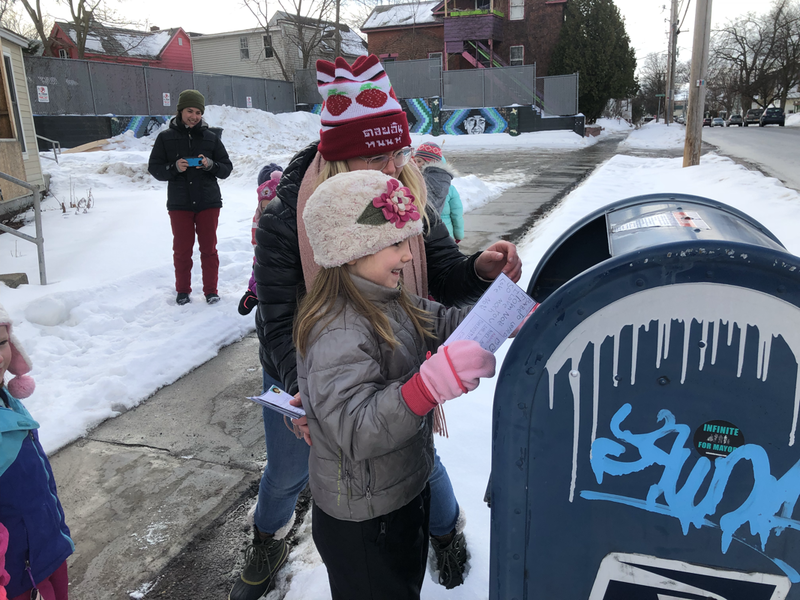 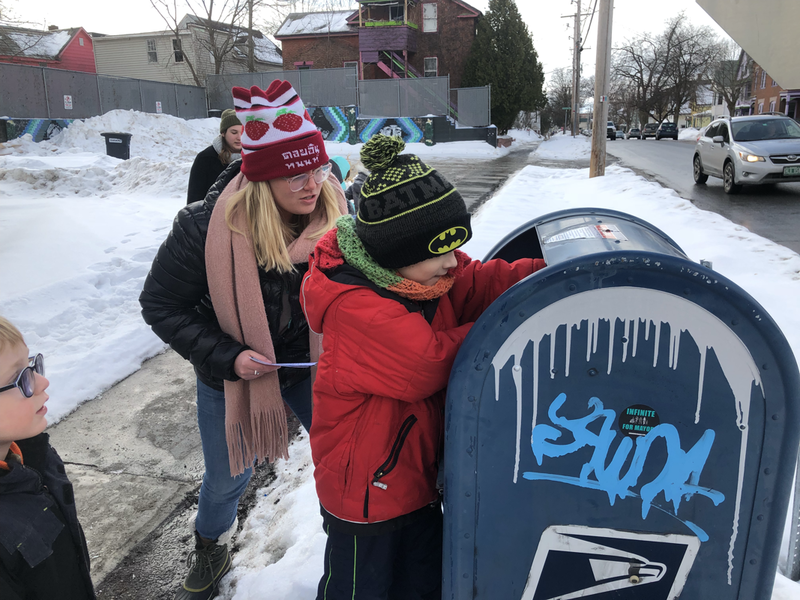 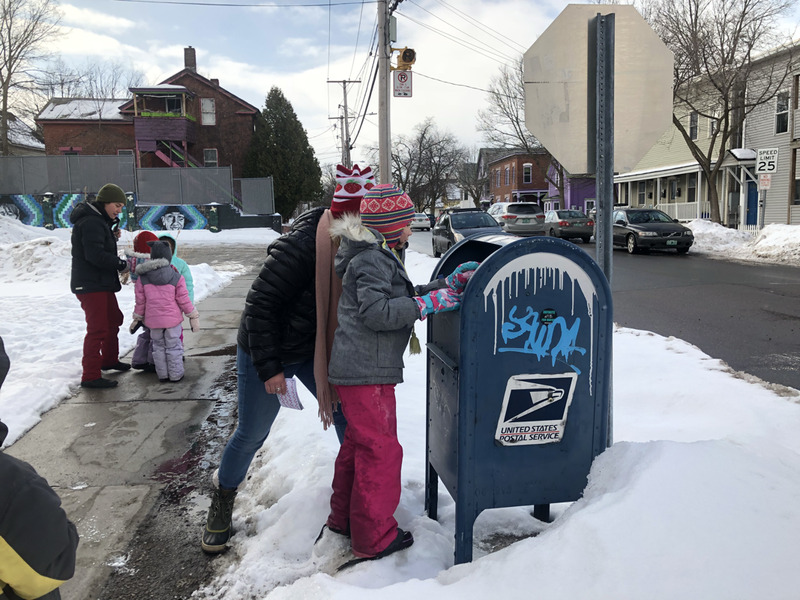 The kids were really thrilled to create their own postcards and mail them to our pets, siblings, family members or themselves! 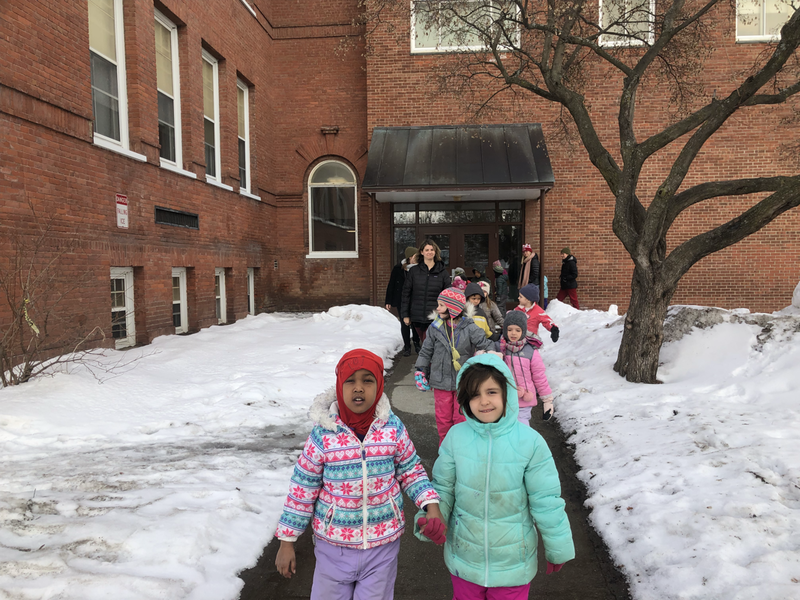 We hope they arrived over the February break. 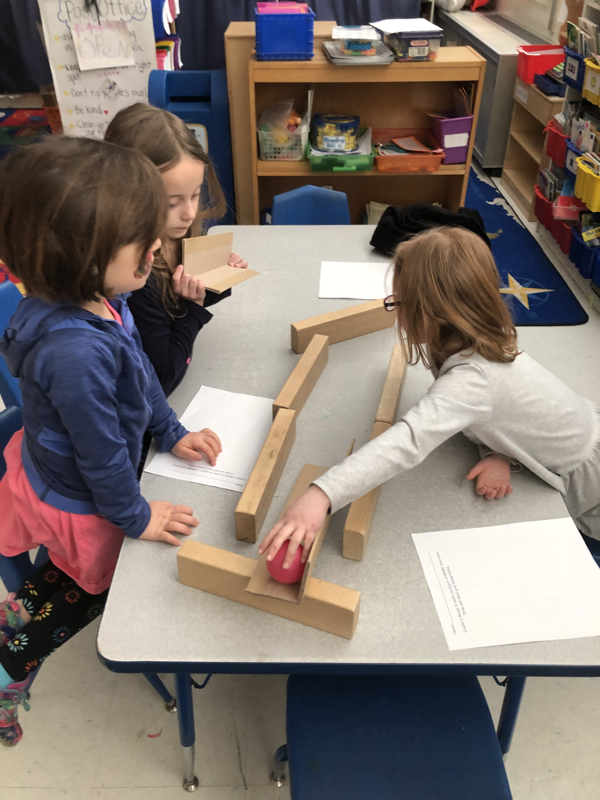 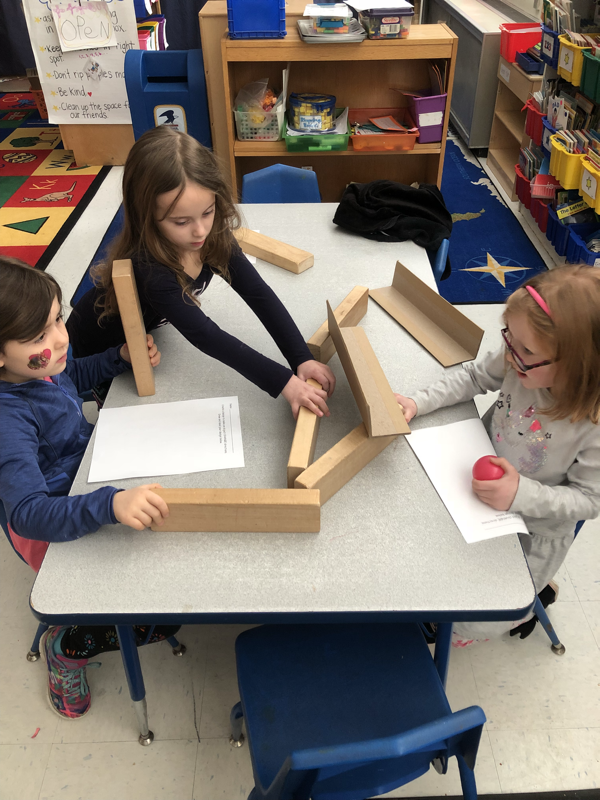 The kindergarten students had a blast exploring our science unit on forces and motion. 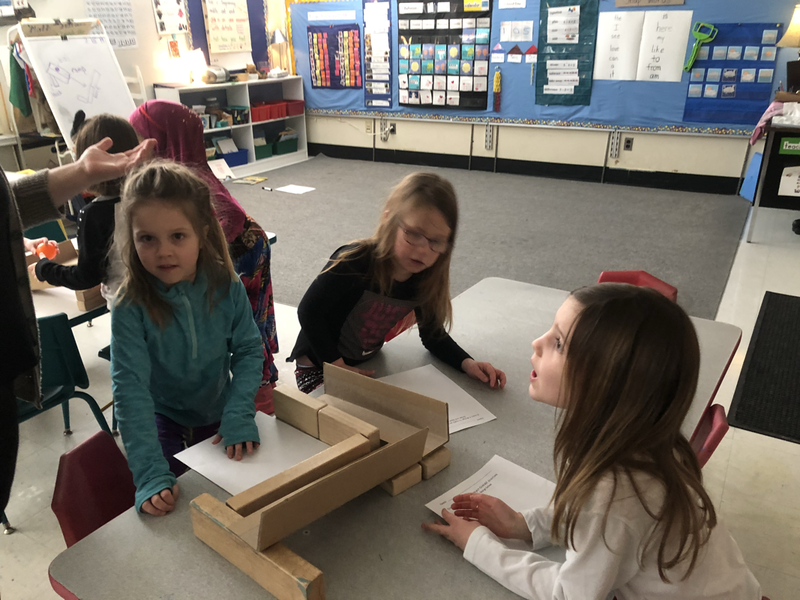 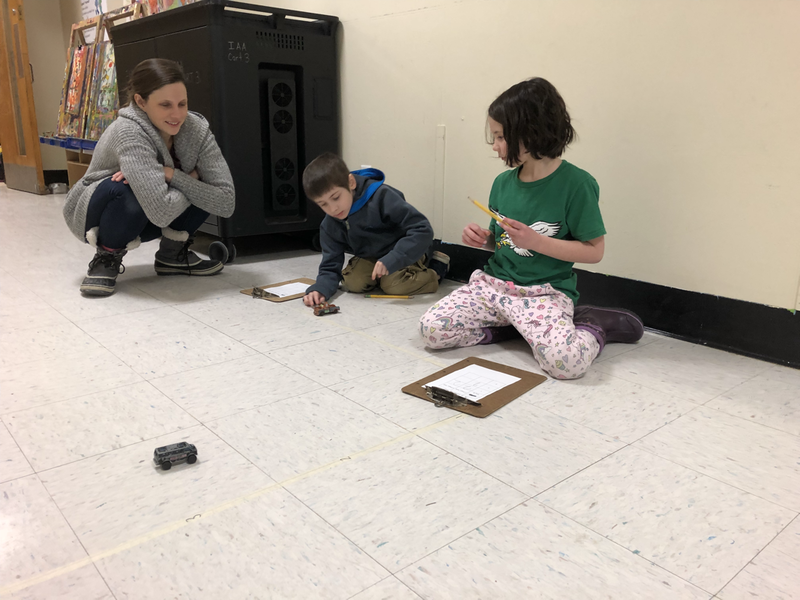 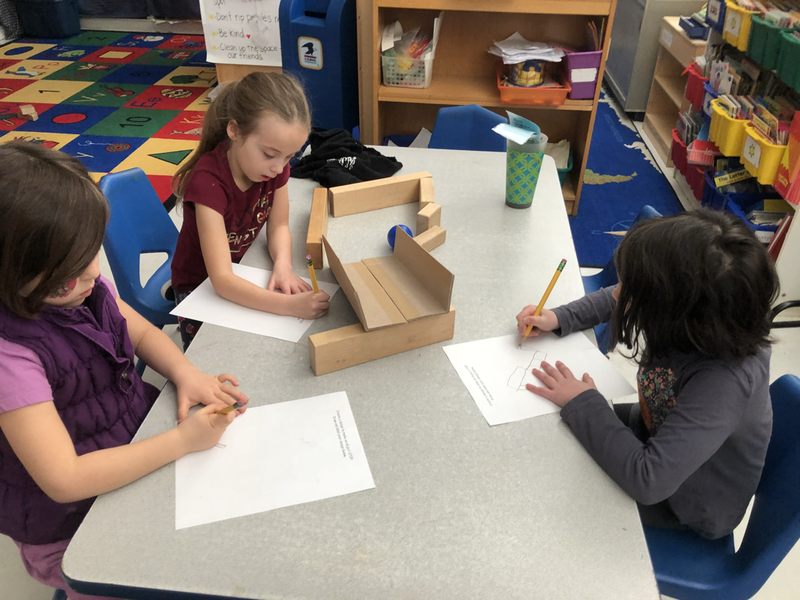 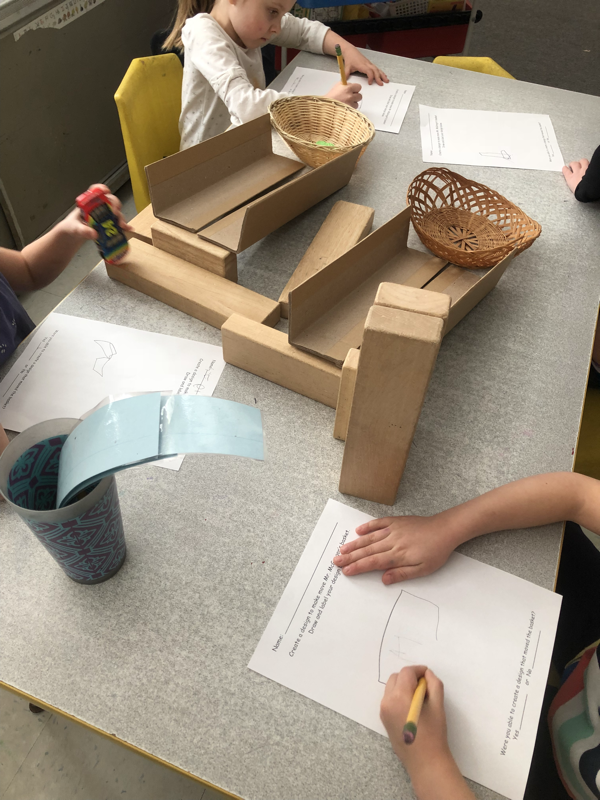 We had a variety of engineering tasks that the kids worked in teams to complete to help build theories and ideas about how objects move. 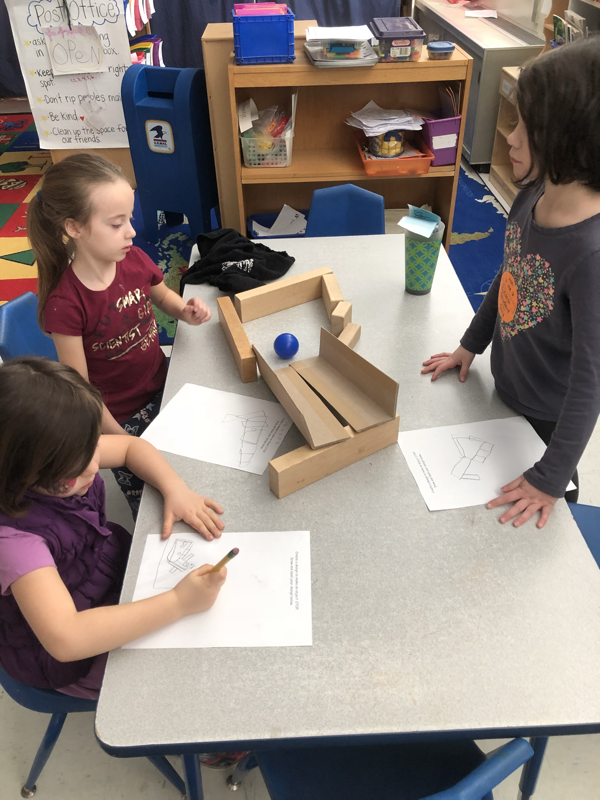 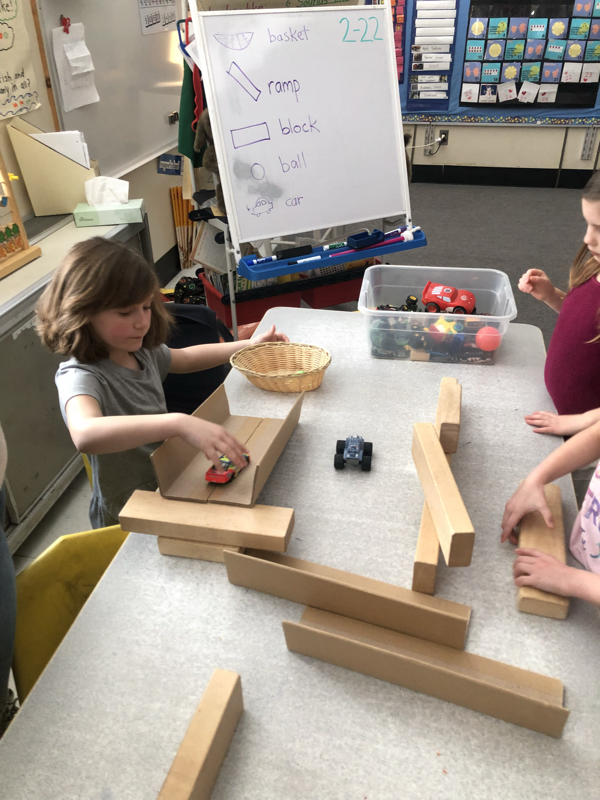 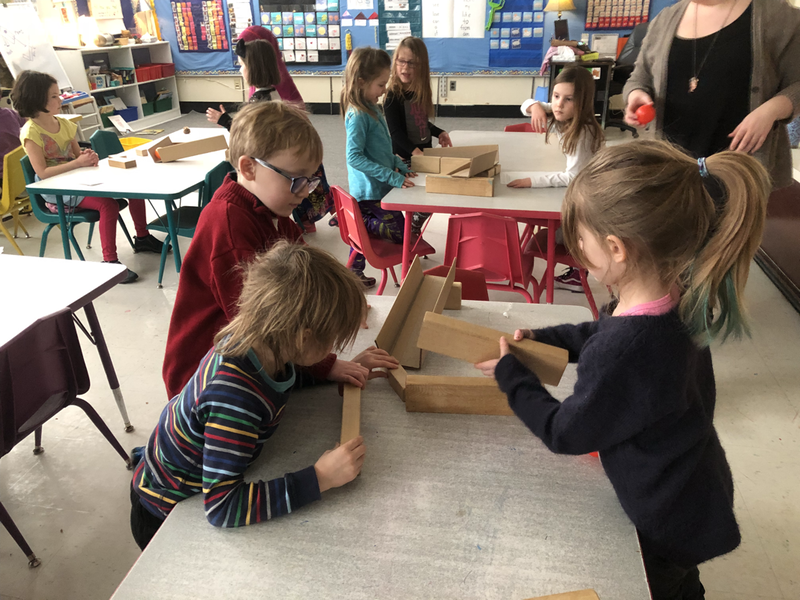 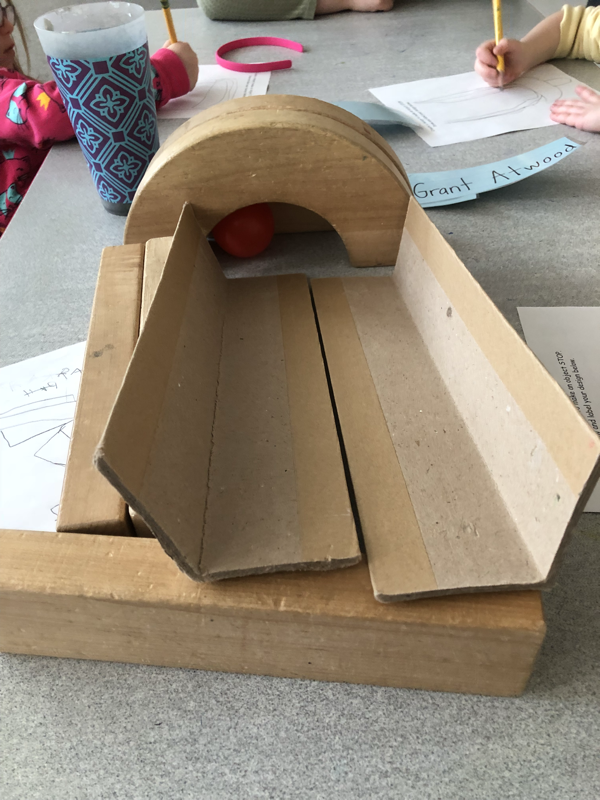 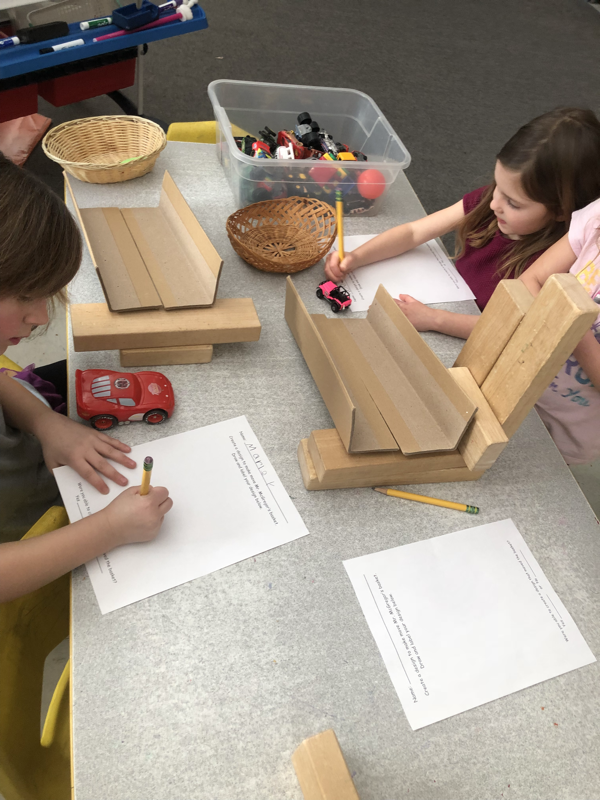 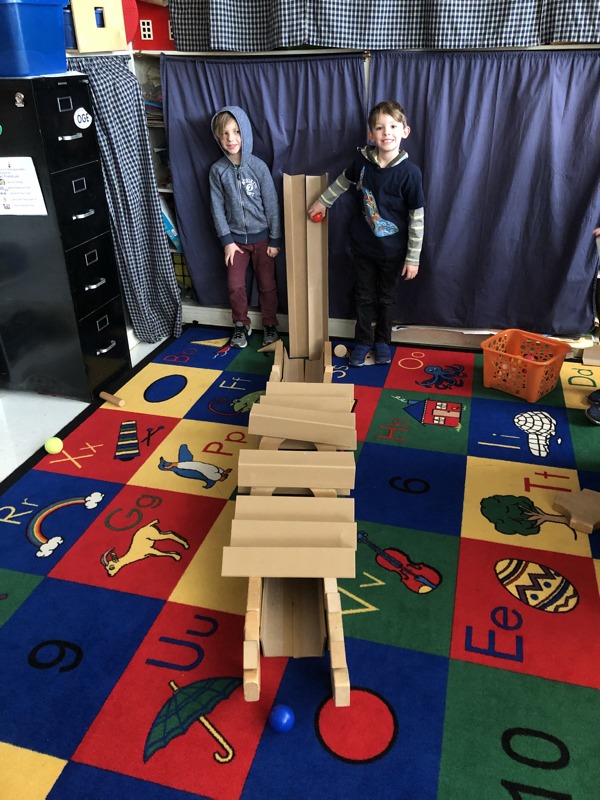 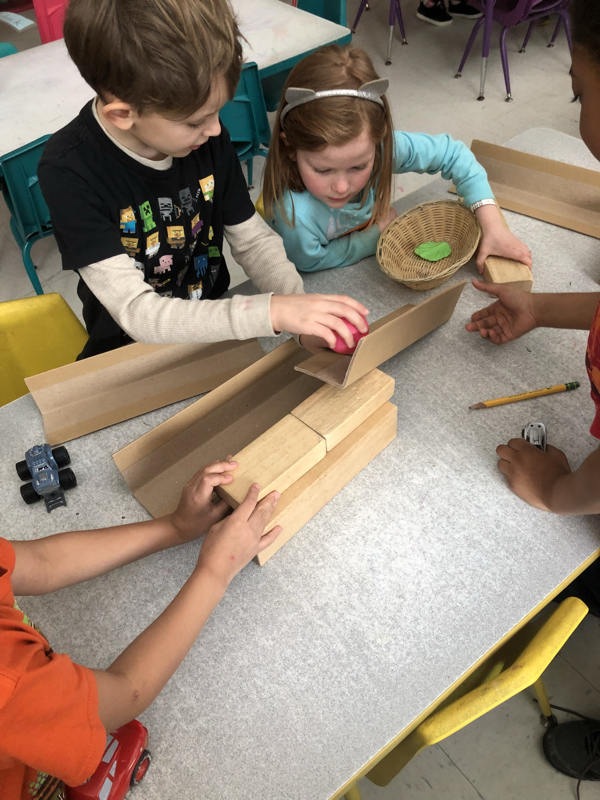 The used a variety of materials to explore these concepts, ramps and cars, an intricate marble run, creating mazes for balls to move through etc. 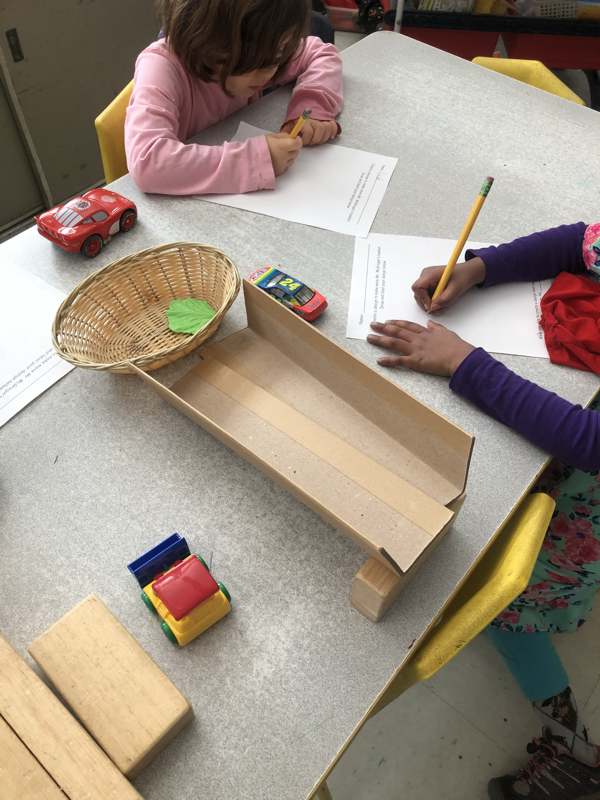 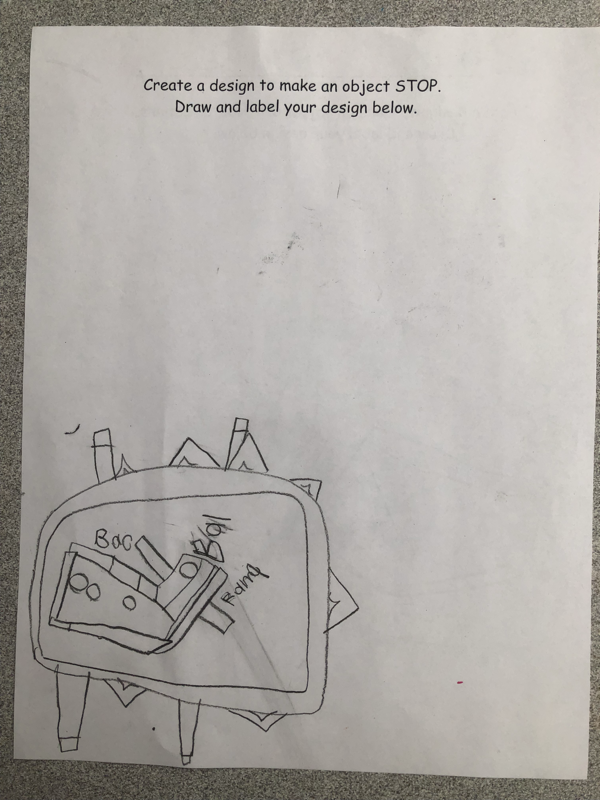 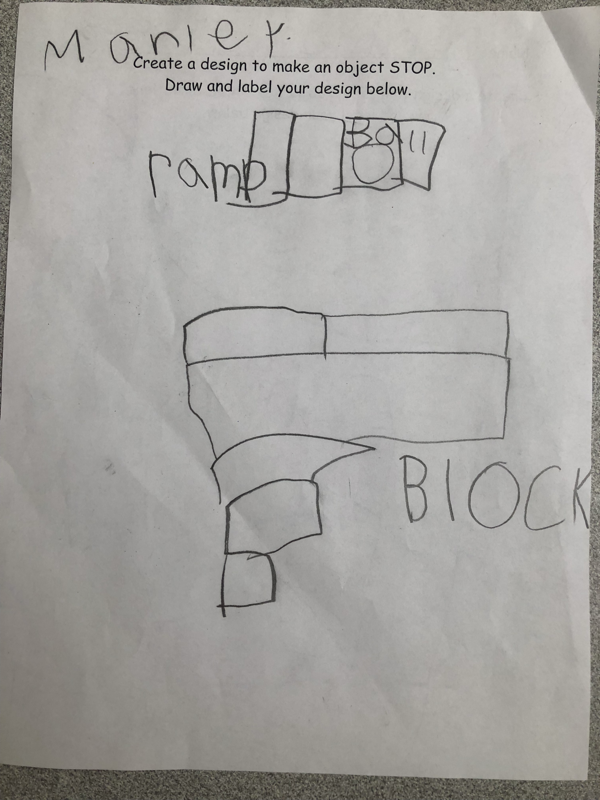 They created designs to stop an object, to make an object change directions and to make another object move. 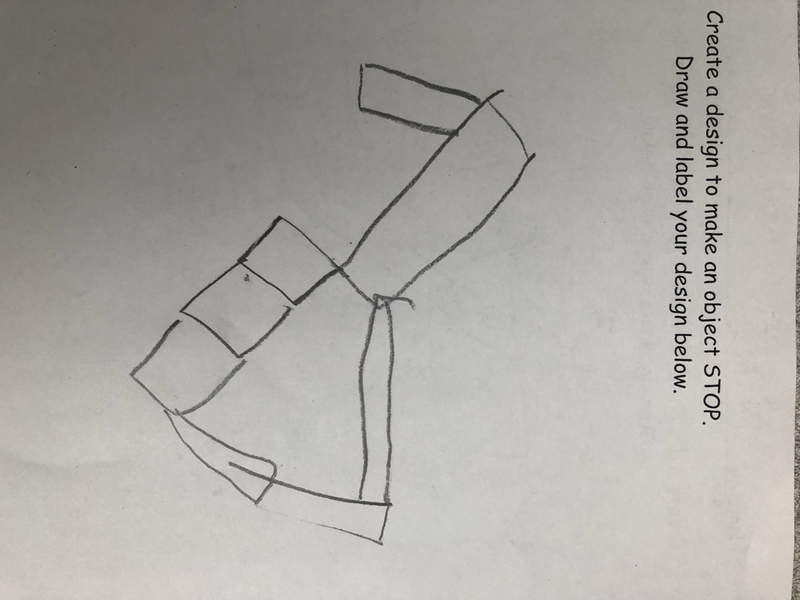 We recorded our designs in our science journals and enjoyed watching each other’s different strategies. 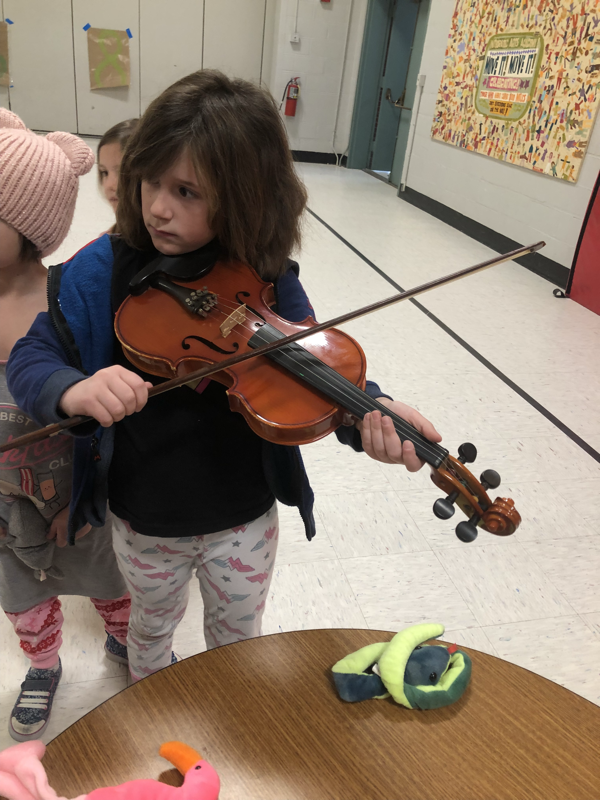 Right out of our shoes! 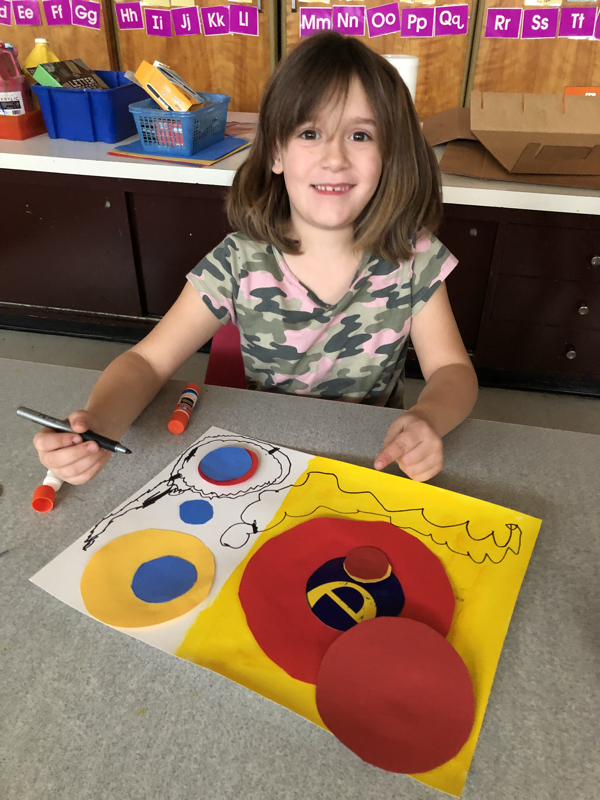 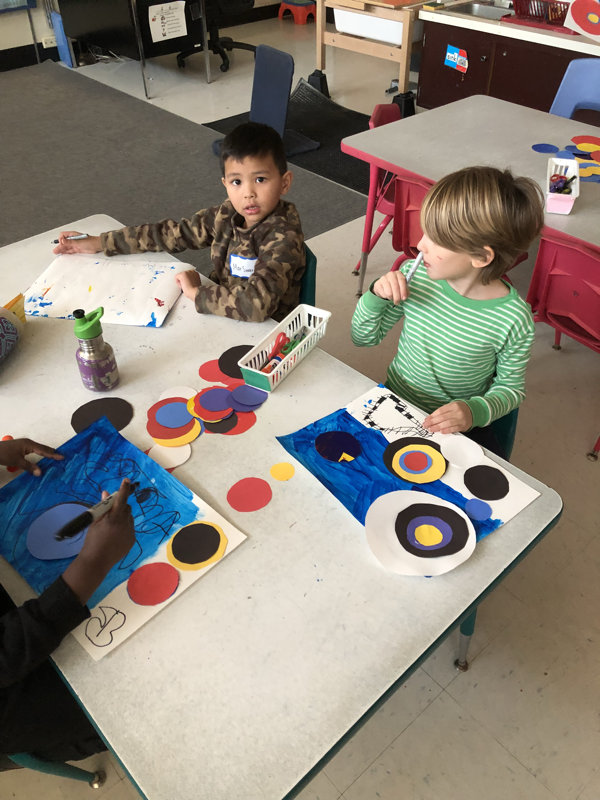 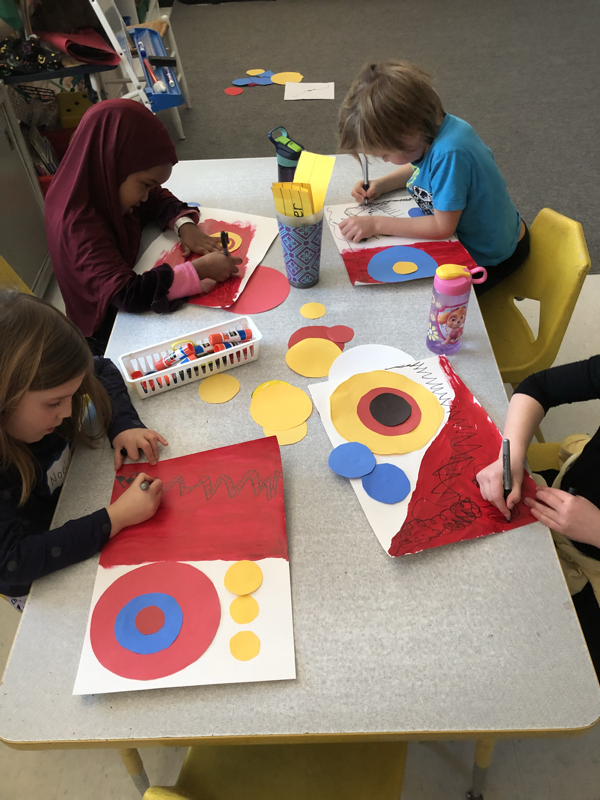 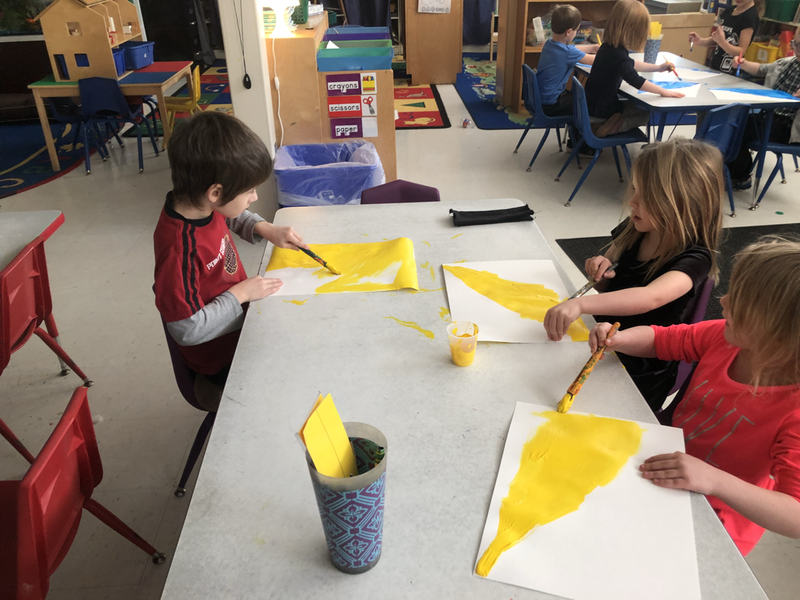 Kindergarten Explores Alexander Calder 2D and 3D shapes + lines + primary colors! 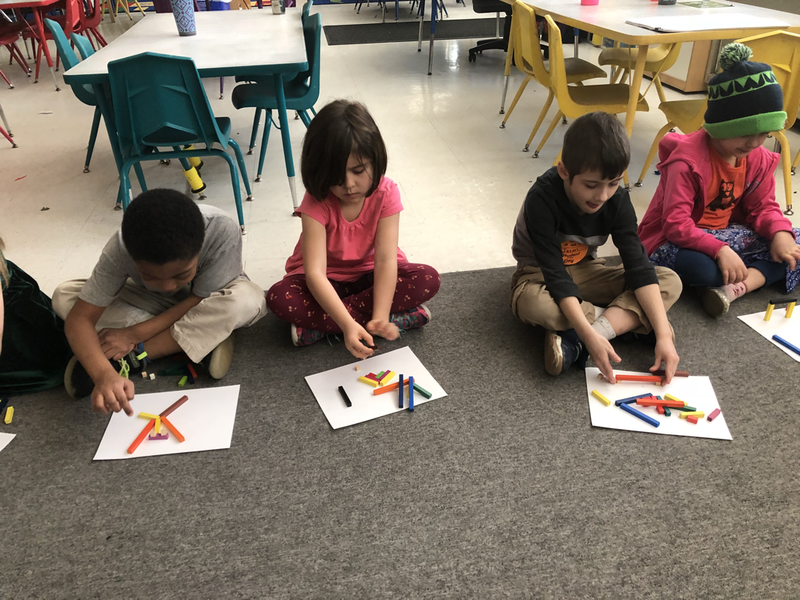 We a learned a new math game from Ms. Regina! 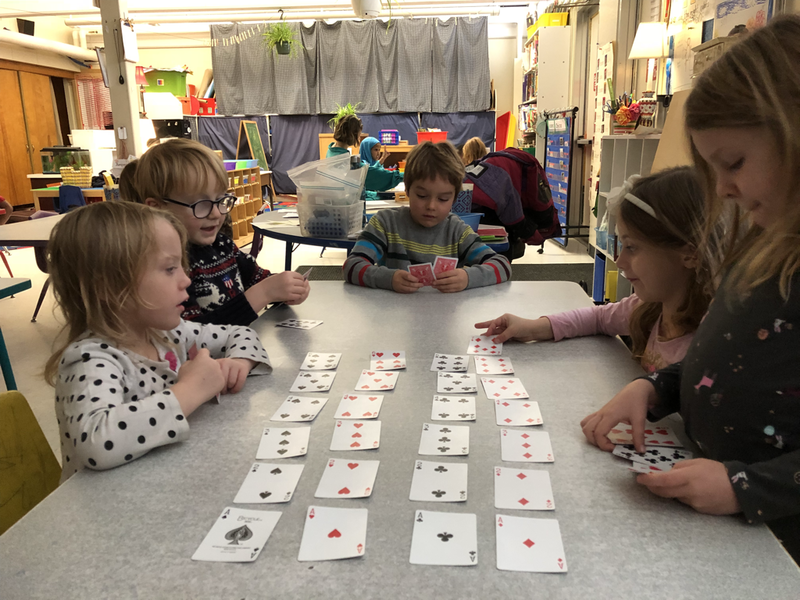 The Knstudents learned about the different suits in a deck of cards and had to work together to organize the deck. 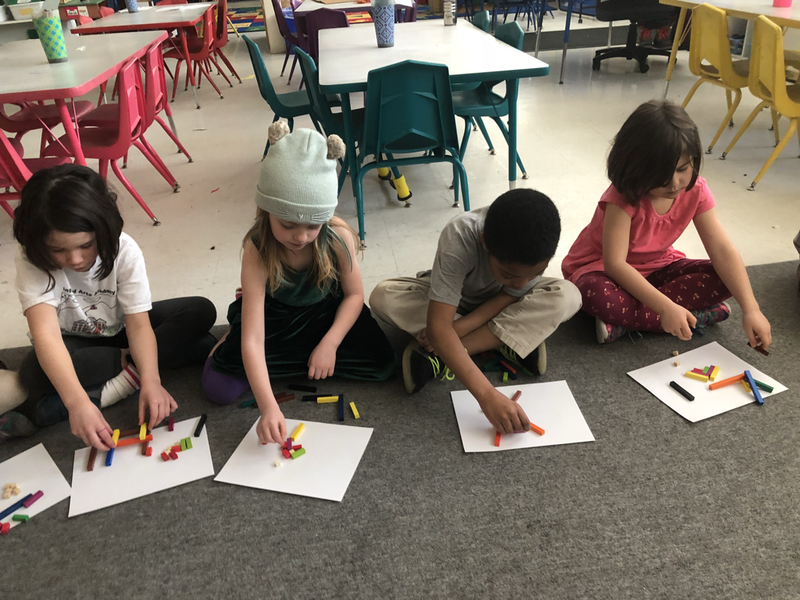 We practiced counting forwards to 10 and backwards to 0. 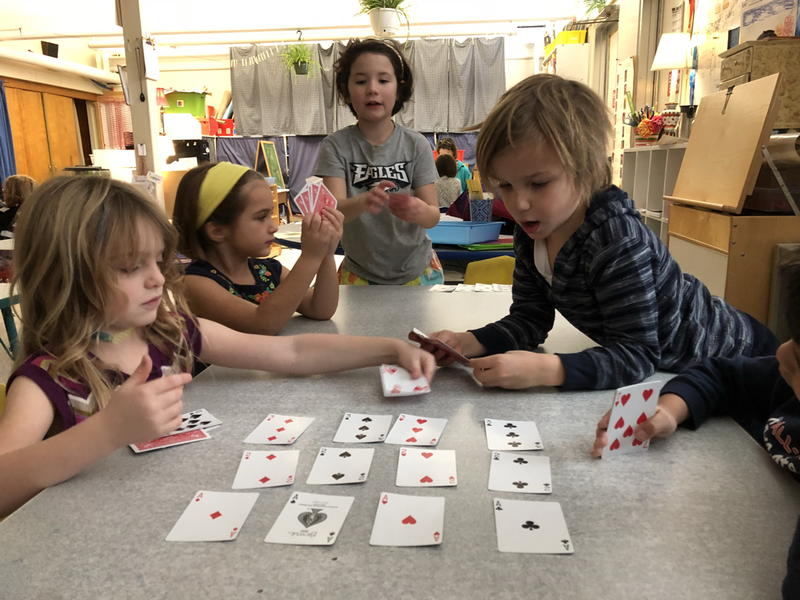 The K students had to discuss where to put the cards and determine if all the cards were in the right spot. 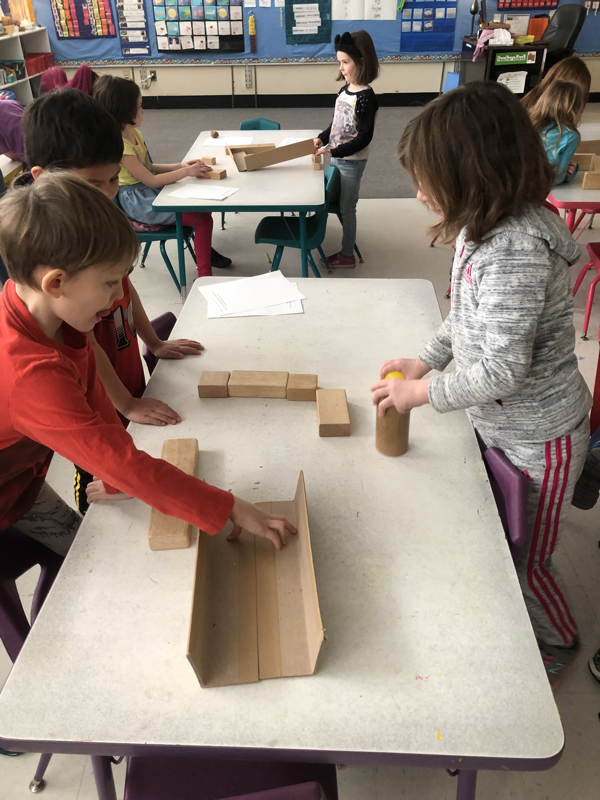 We had great discussions while playing the game and many students said they loved this new math station!